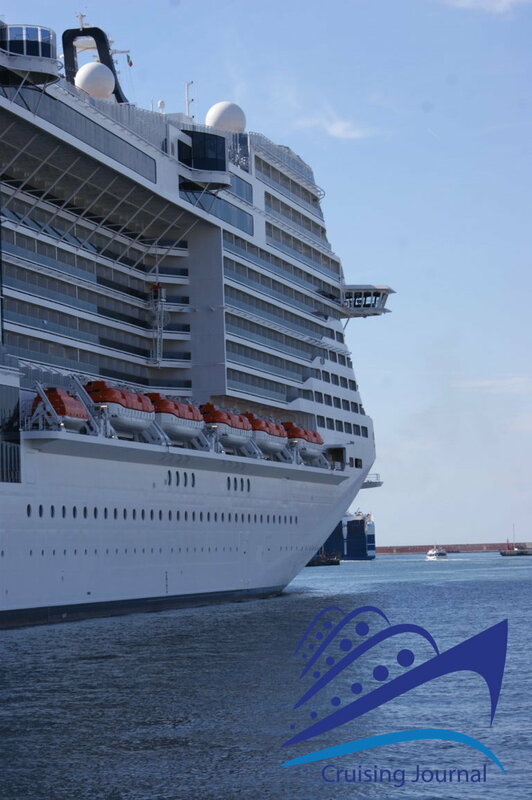 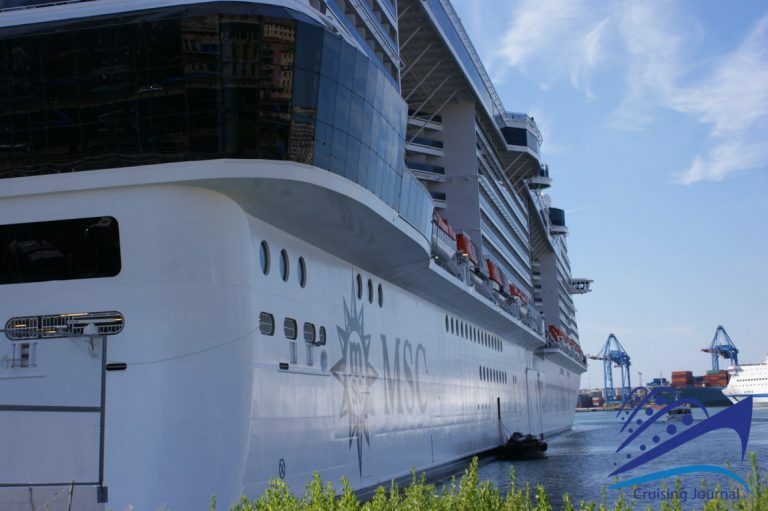 Msc Meraviglia is the last ship launched by Msc Cruises on June 3, 2017 in Le Havre and it represents the first of a series of 11 units that will widen the fleet by 2026. 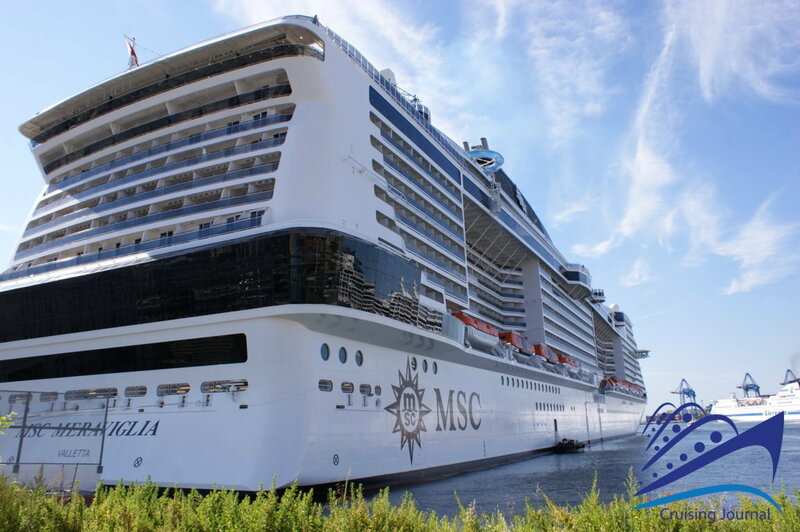 The numbers in Msc Meraviglia are impressive: 171,598 tons of gross tonnage, 315 meters in length, 43 in width, 19 bridges, 2,244 cabins and a total capacity of 5,714 passengers, in addition to 1,536 crew members. 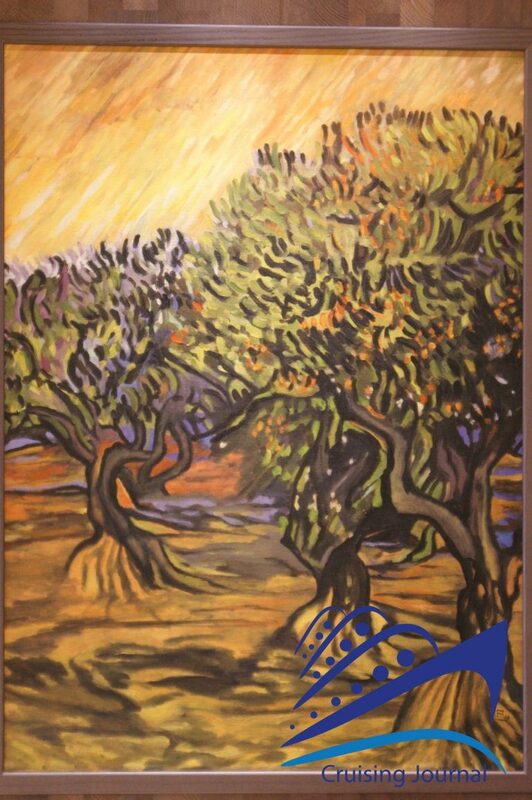 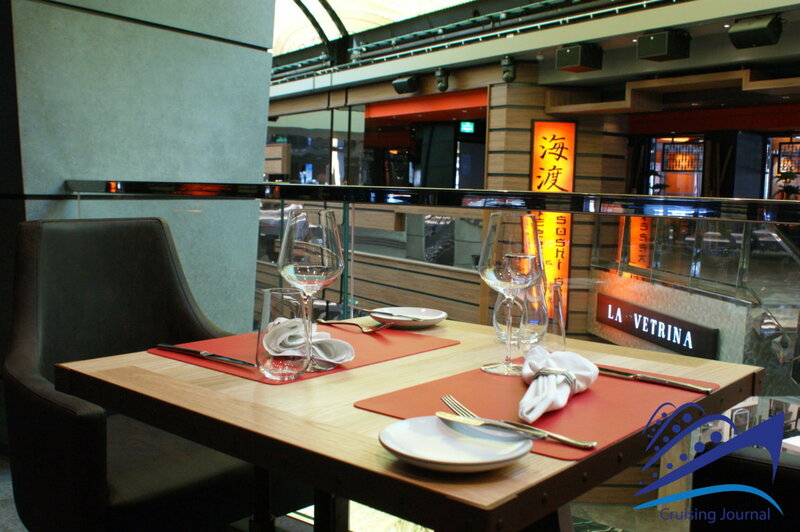 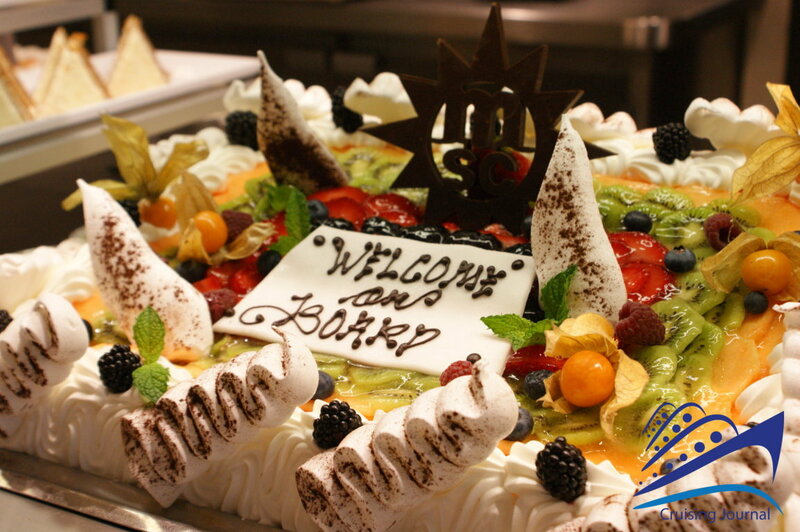 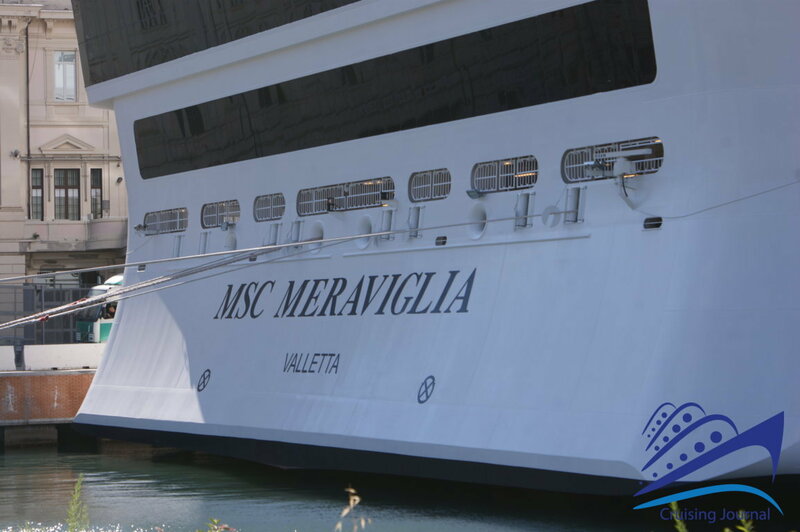 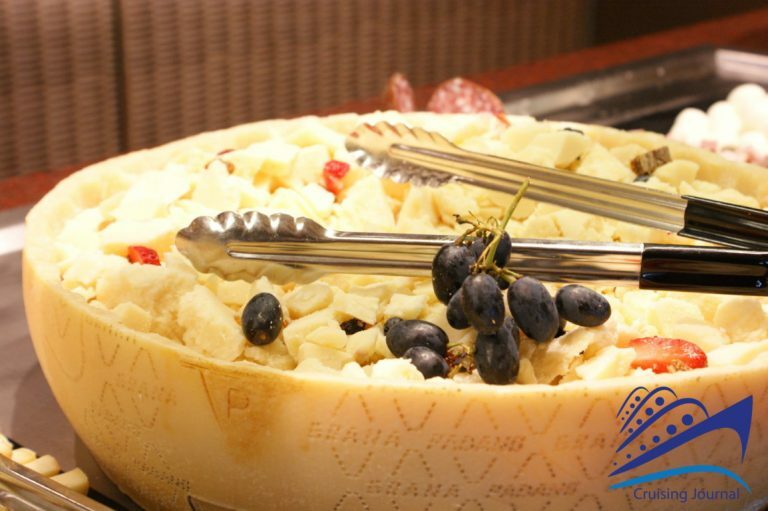 Meraviglia offers a wide range of services, entertainment offers, culinary experiences. 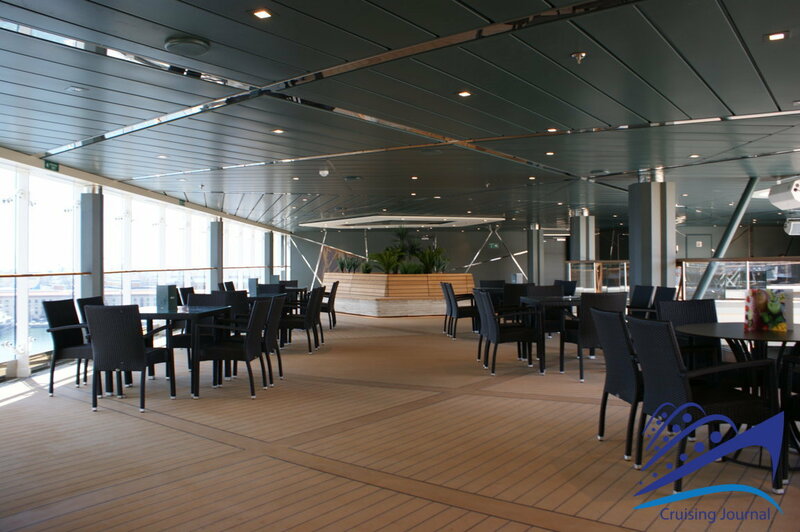 A look at the various places distributed on the 19 bridges of the new ship will help you understand the size and the variety of the offer. 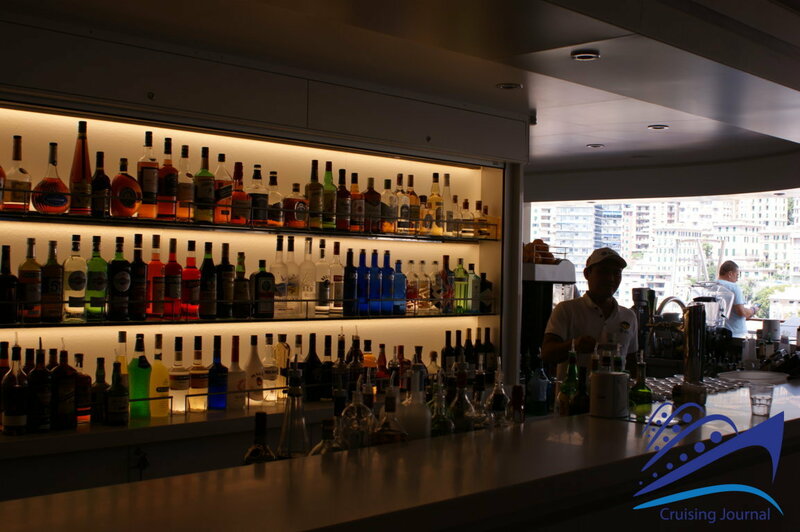 At the bow of bridge 19 you can find the Yacht Club with its main outdoor areas: The One Sundeck & Bar, The One Grill, The Pool, the Solarium and a Jacuzzi. 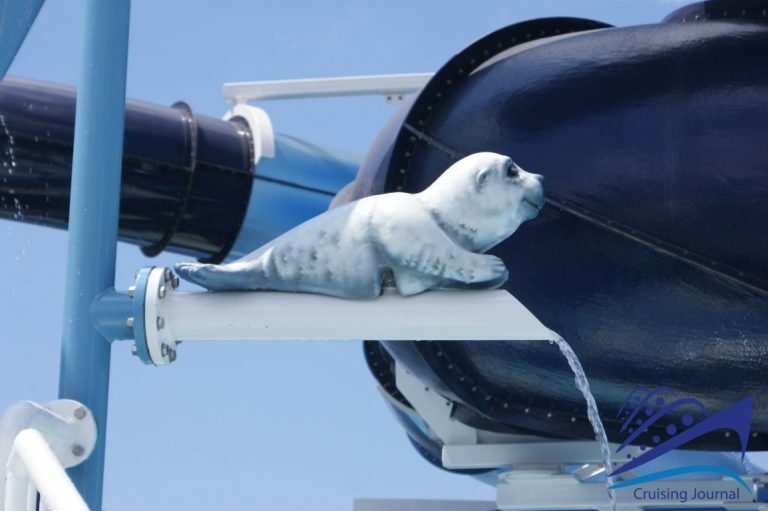 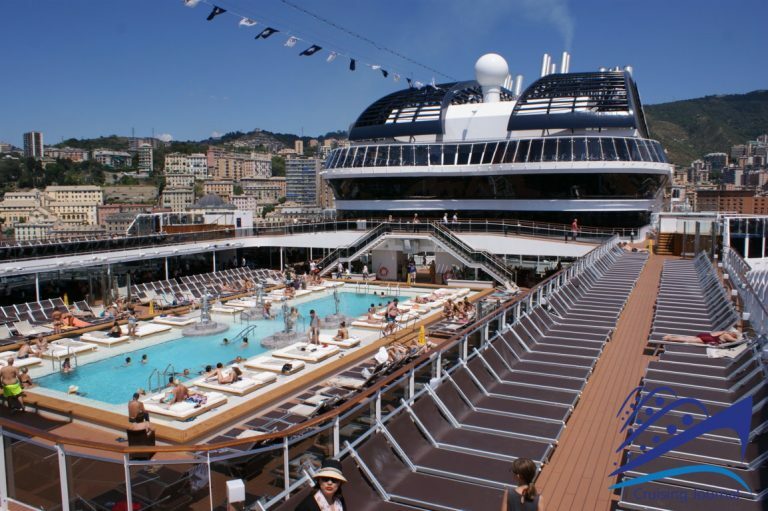 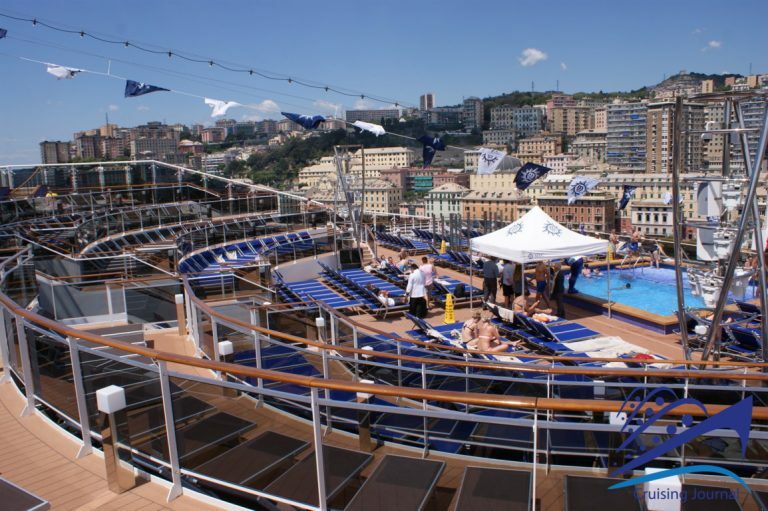 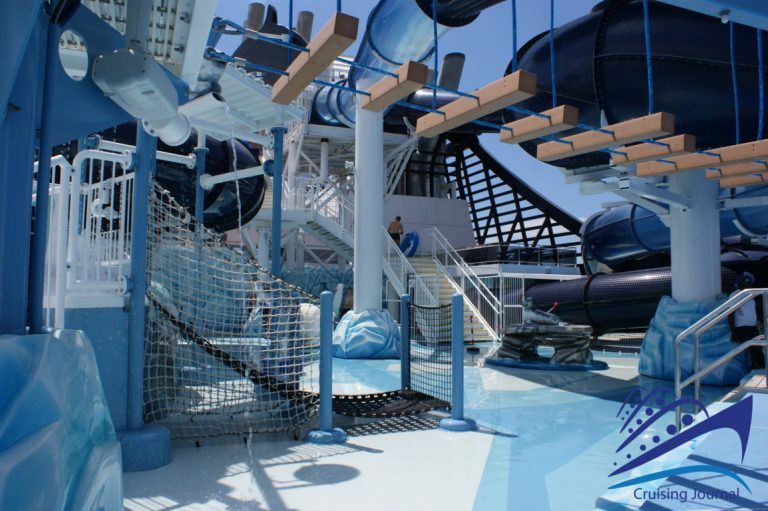 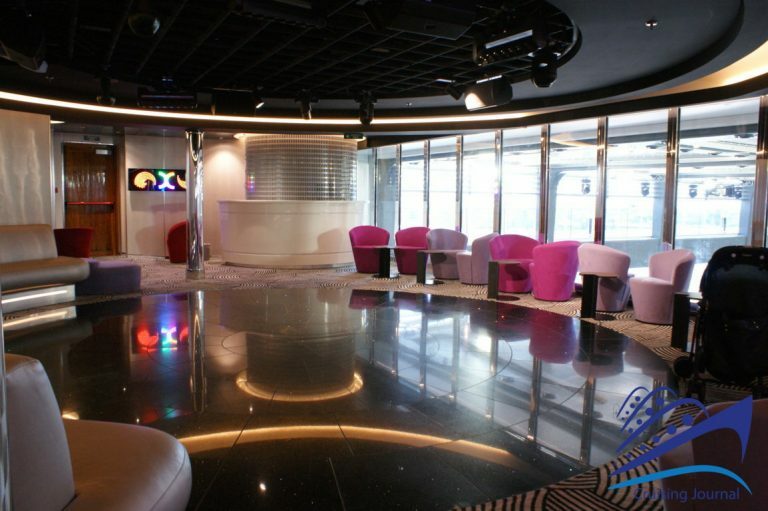 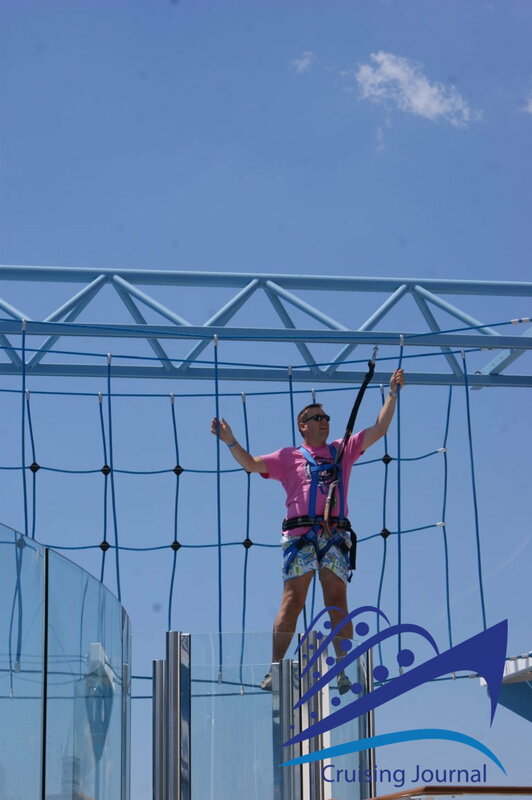 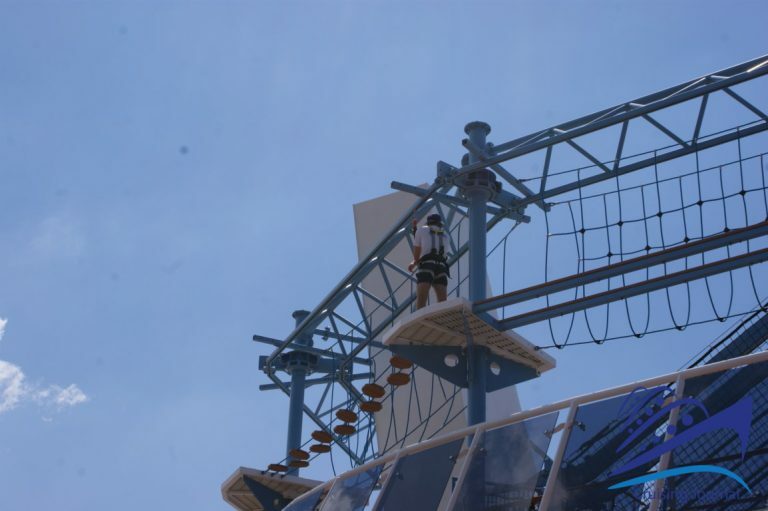 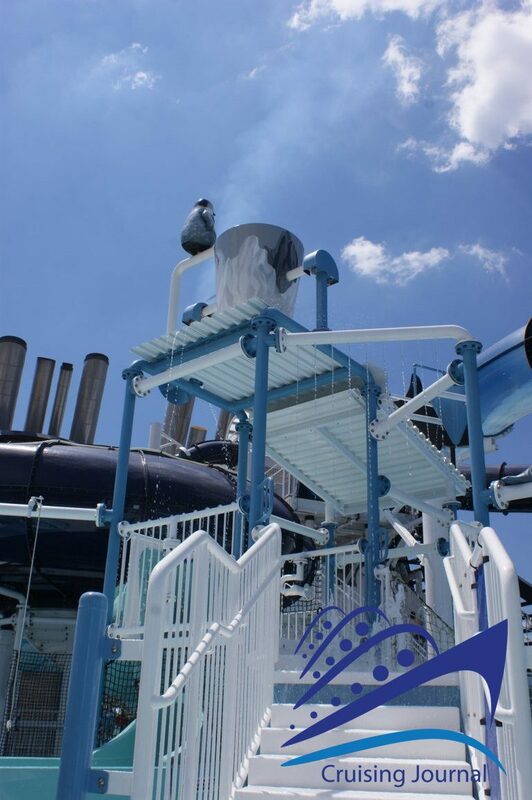 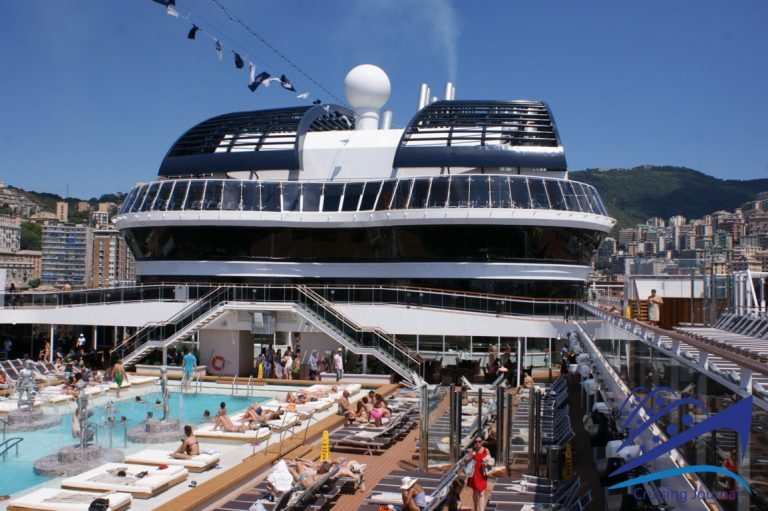 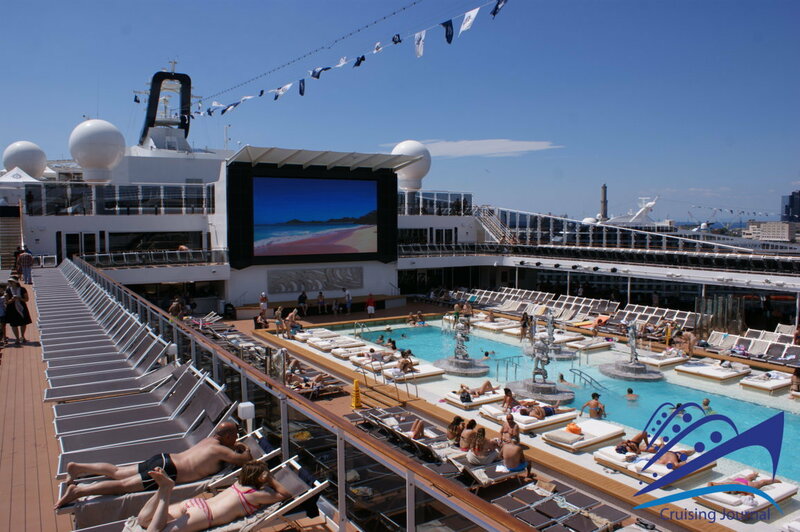 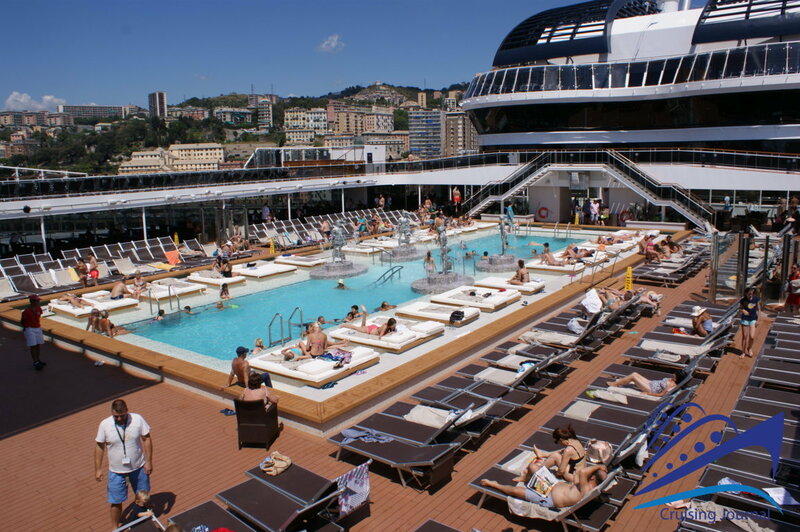 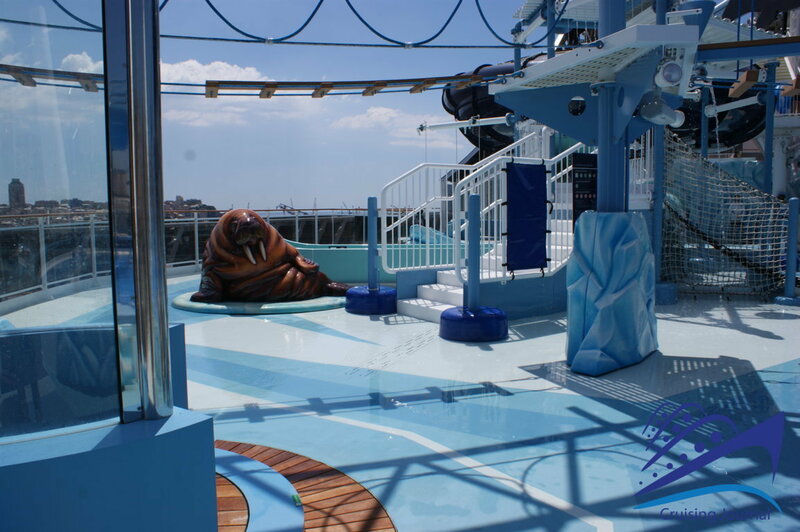 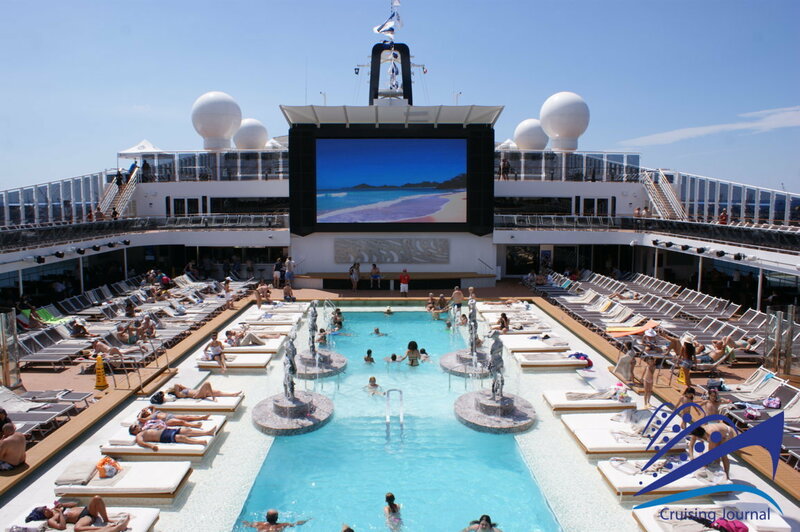 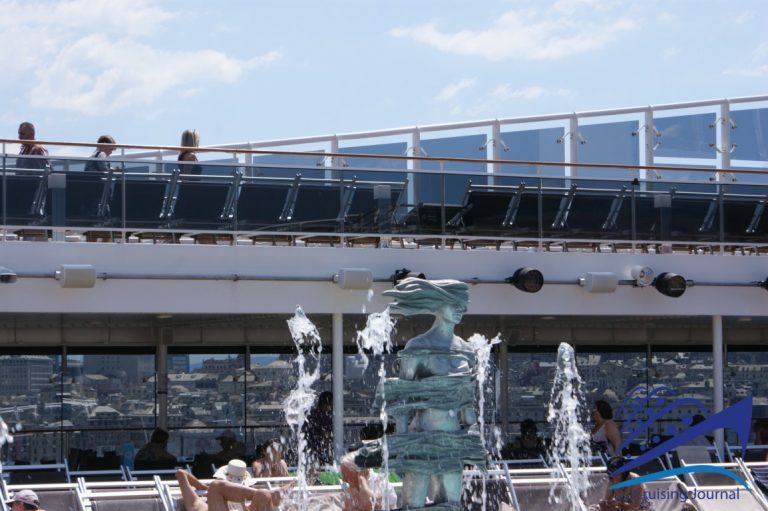 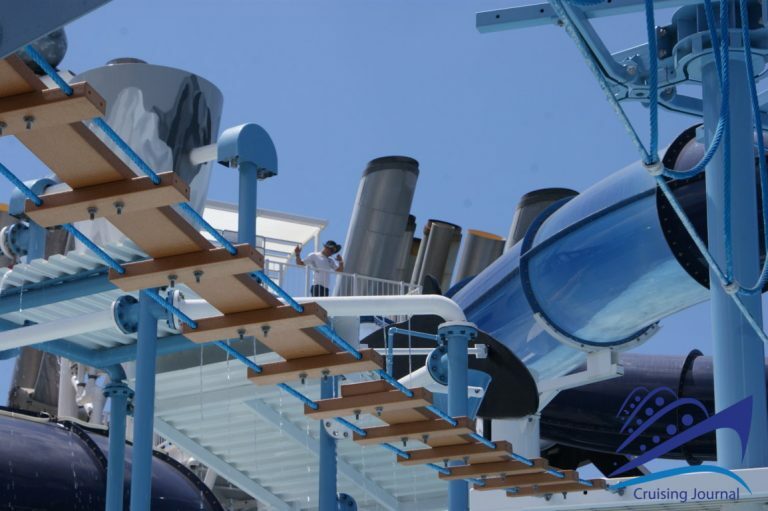 At the center of the ship there is the Top 19, an exclusive Solarium area for a fee and, in the stern area, the fun Polar AquaPark, a path between waterfalls and splashes of water, with the Himalayan Bridge and the Polar Bar. 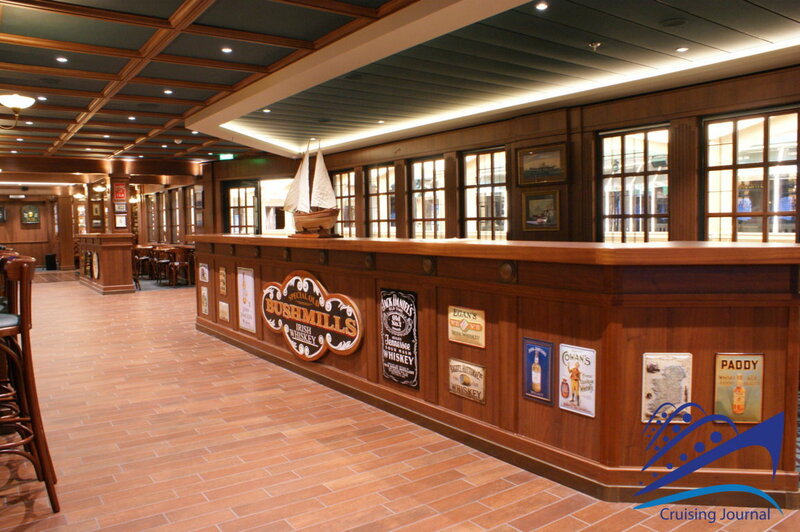 The forward area of ​bridge 18 is also occupied by the Yacht Club, with the Top Sail Restaurant and the Yacht Club Deluxe Suite. 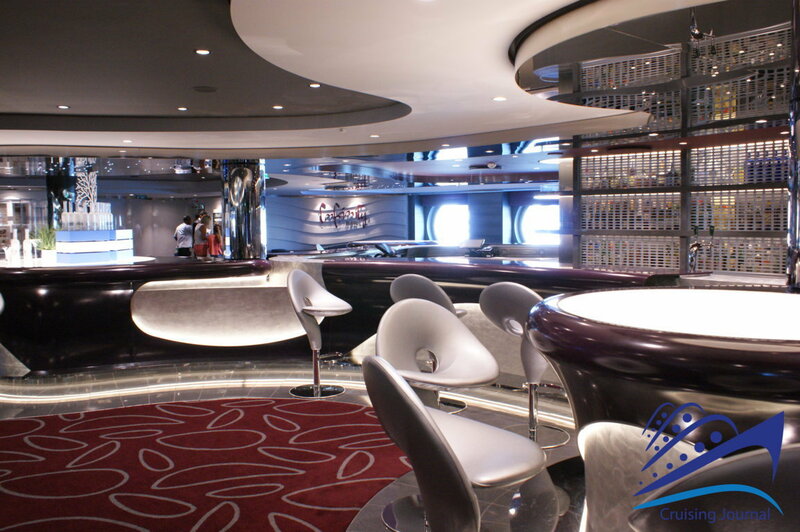 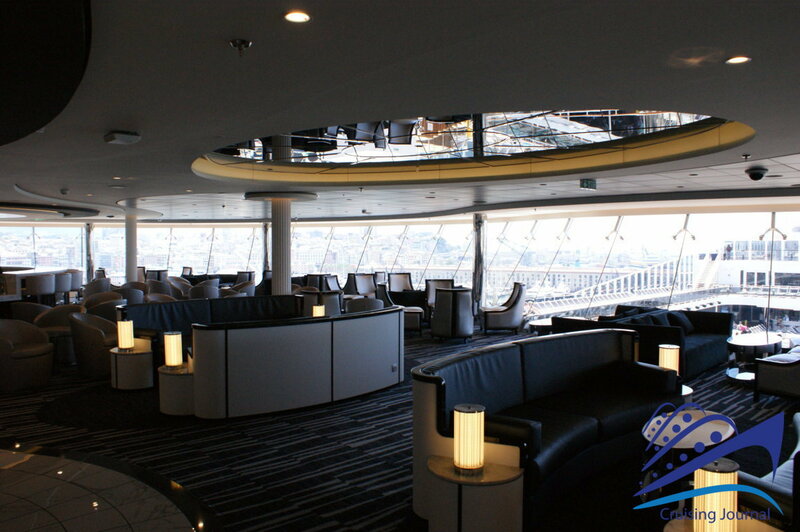 At the center of the ship we have the Sky Lounge, a large and lighted lounge overlooking the pool, for an afternoon reading as well as for an evening aperitif. 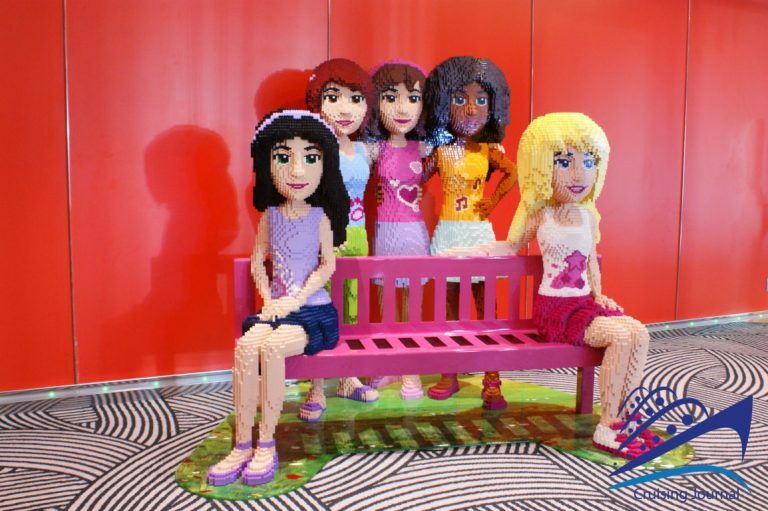 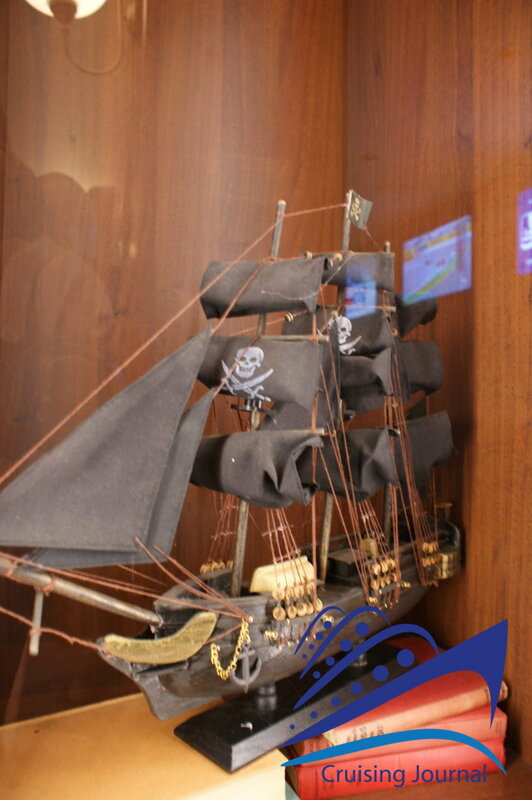 Moving back to the stern you can find the beloved Doremi Lab, and several other spots dedicated to young Msc guests: Baby Club Chicco, Mini Club Lego, Doremi Studio, Junior Club Lego, and clubs dedicated to different age groups (Young Club, Teen Club, Attic Club). 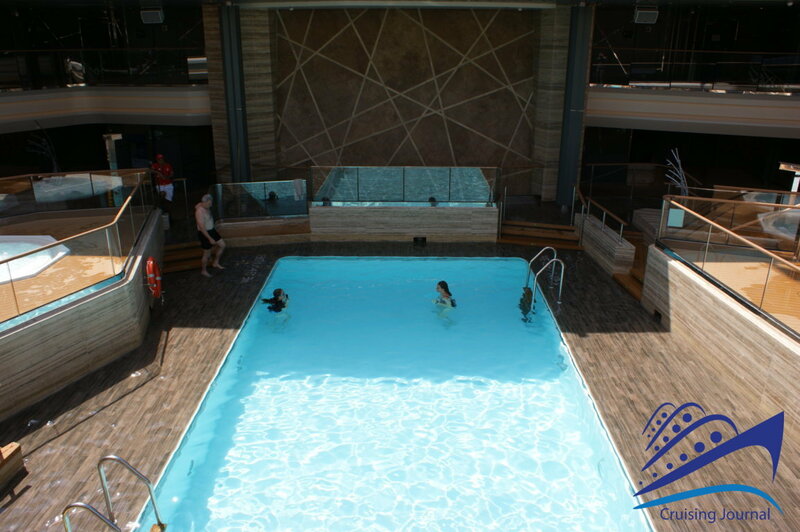 A little further back is the Horizon Bar, overlooking the pool and the aft Solarium area. The Yacht Club continues its development also on bridge 16. 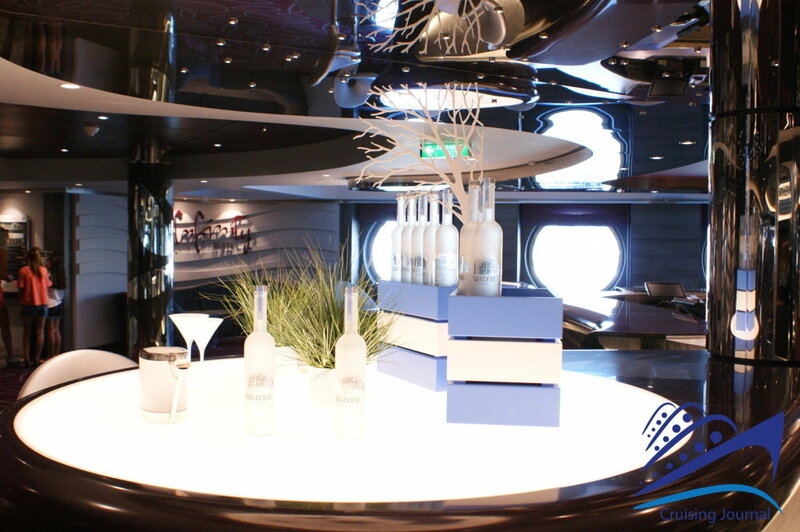 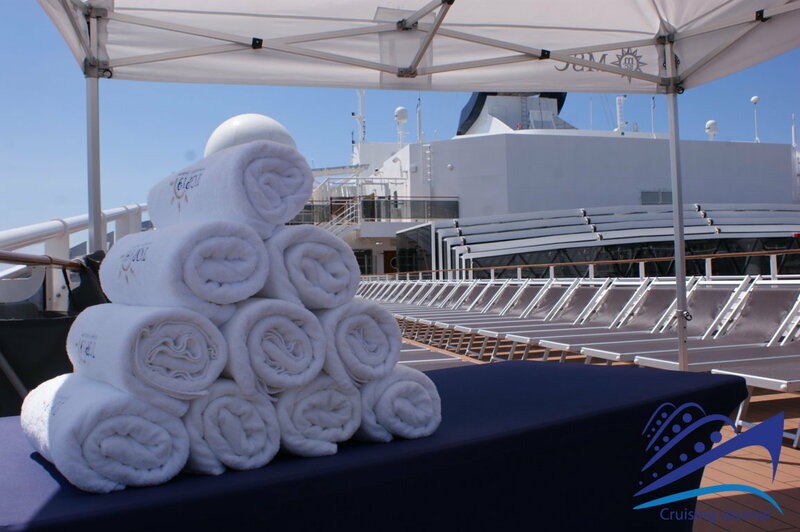 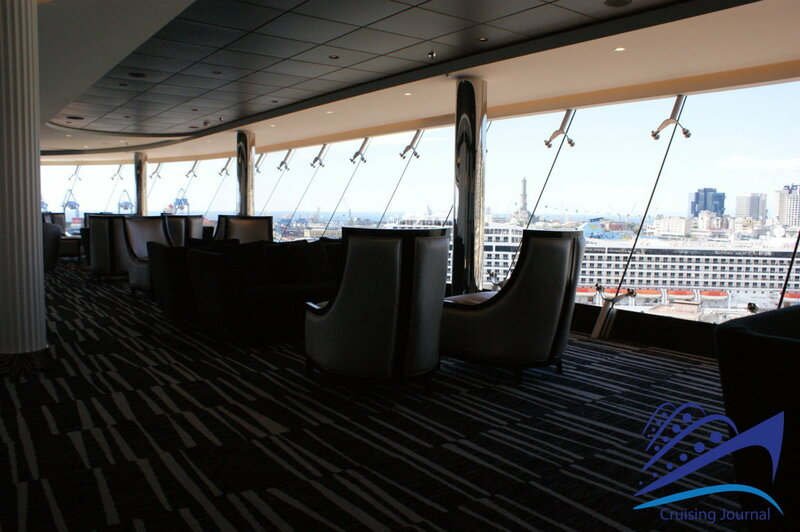 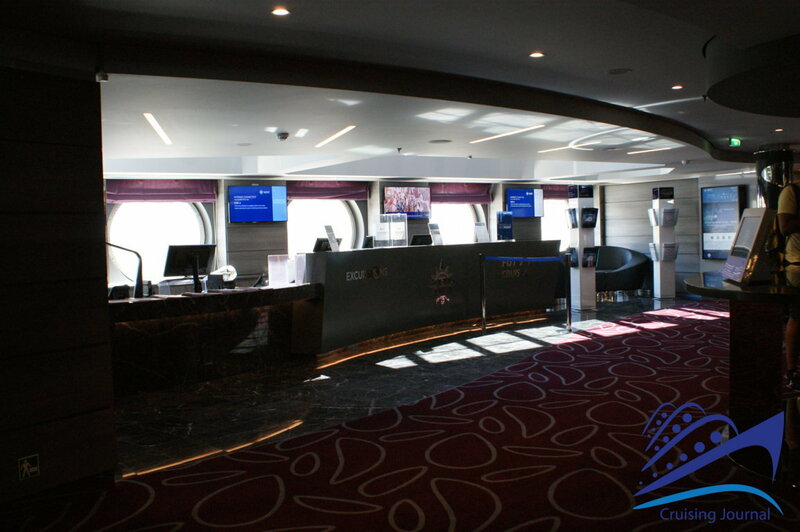 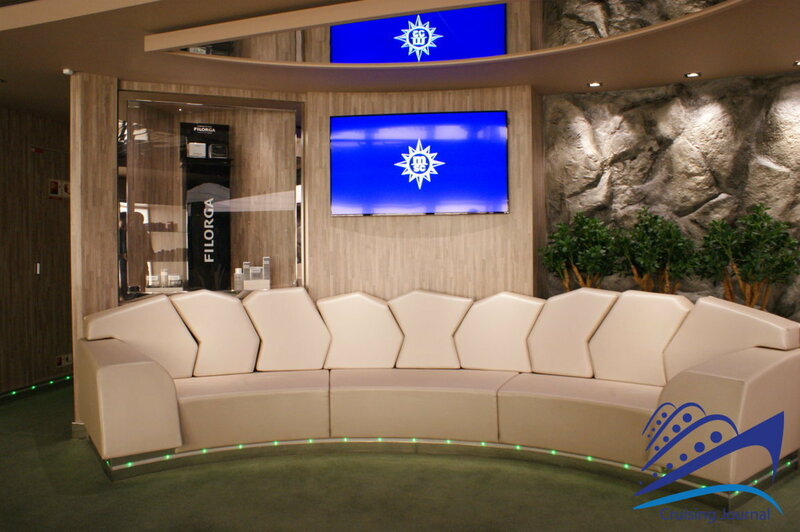 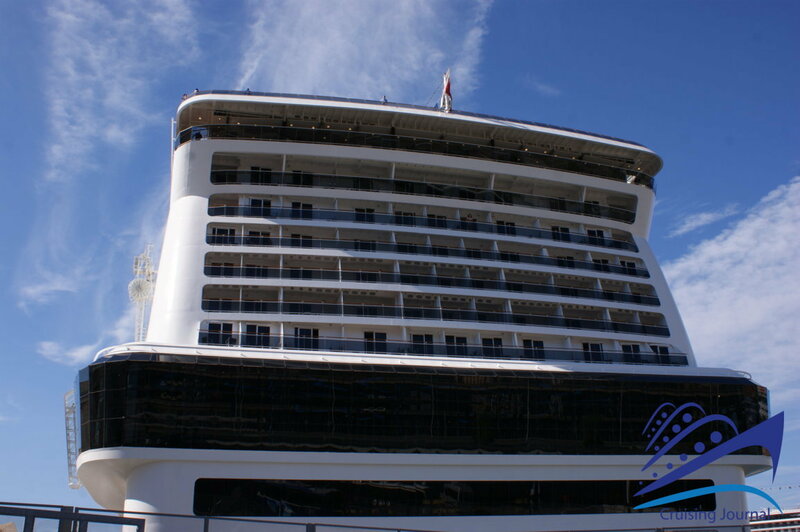 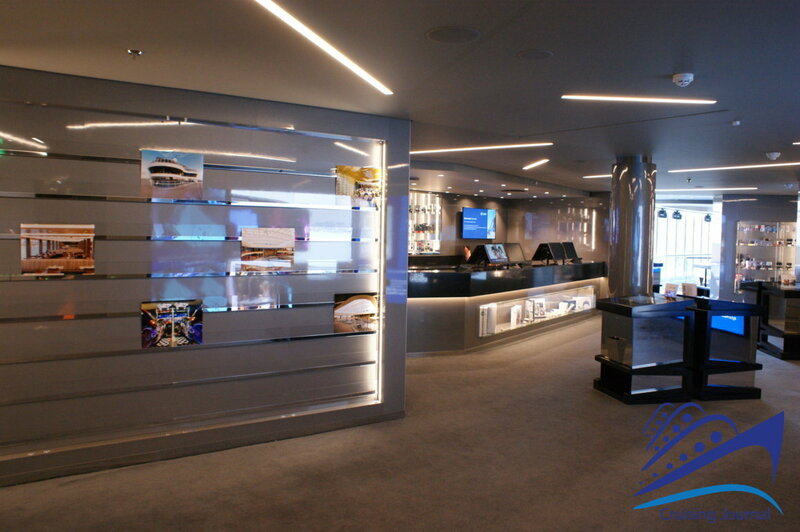 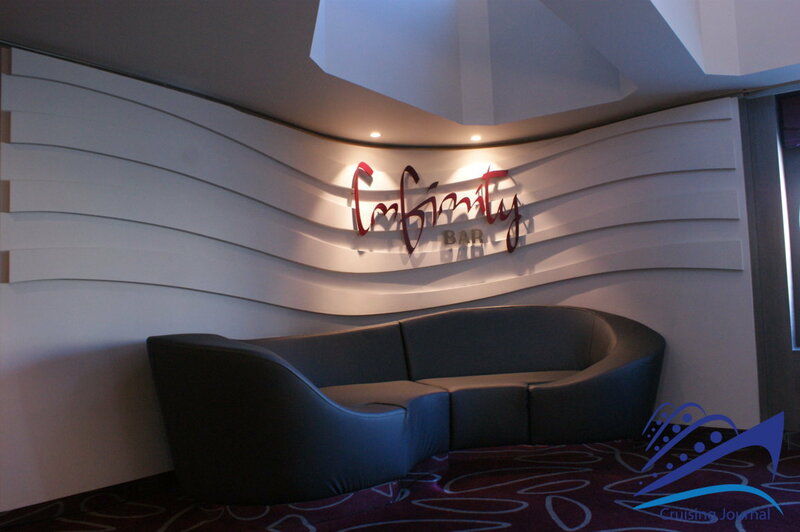 At the bow you can find the Top Sail Lounge, the Concierge, other Deluxe Suites and 4 inside cabins. 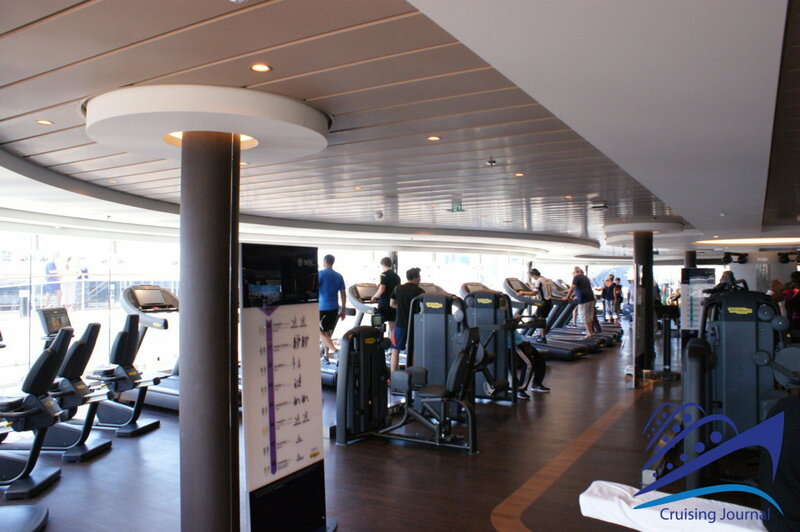 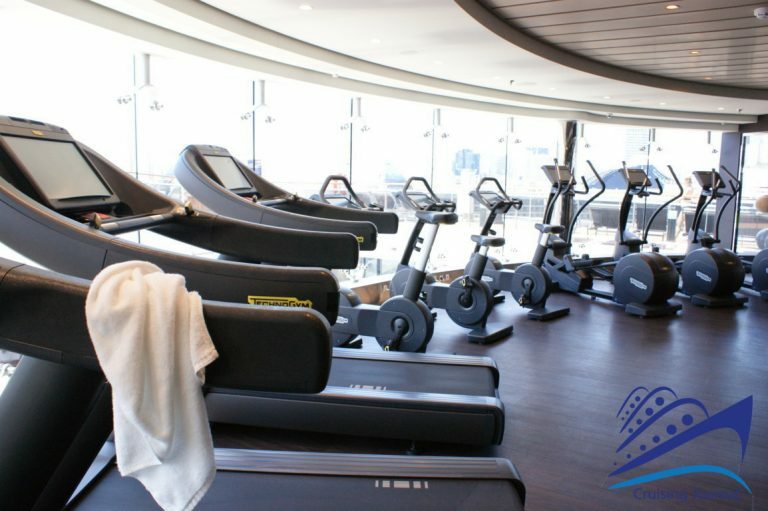 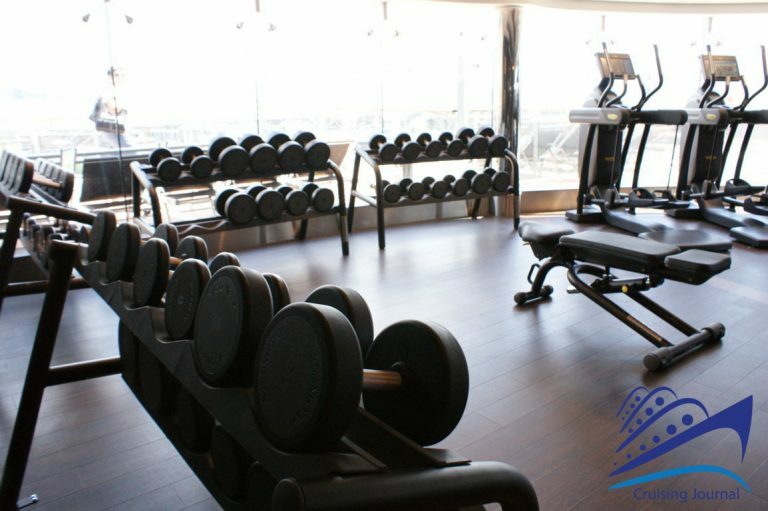 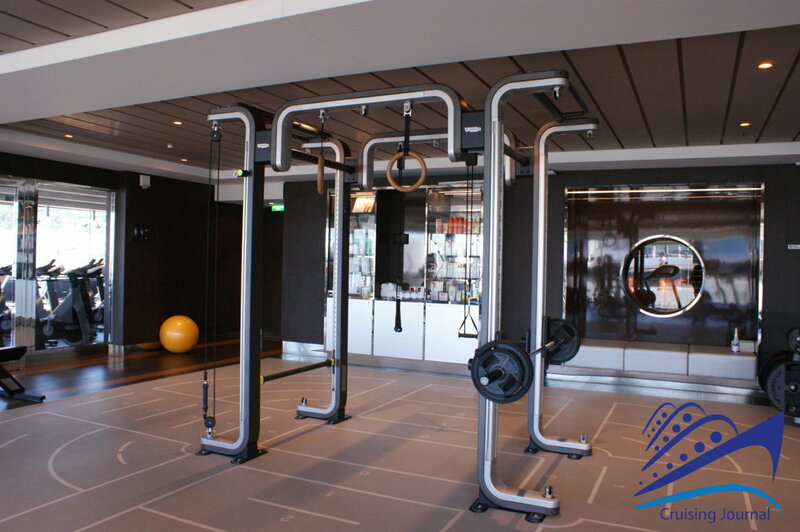 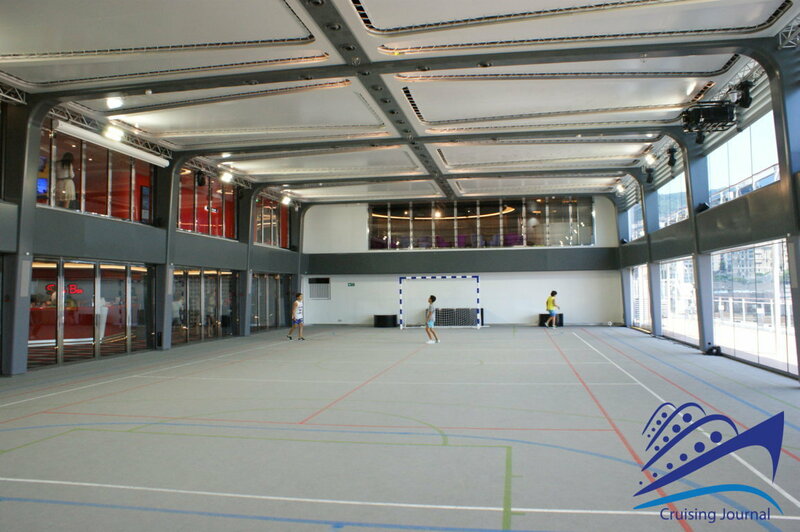 Moving back to the stern, past the pool, you come across the gym, Msc Gym by Technogym, surrounded on the outer sides by the jogging path. 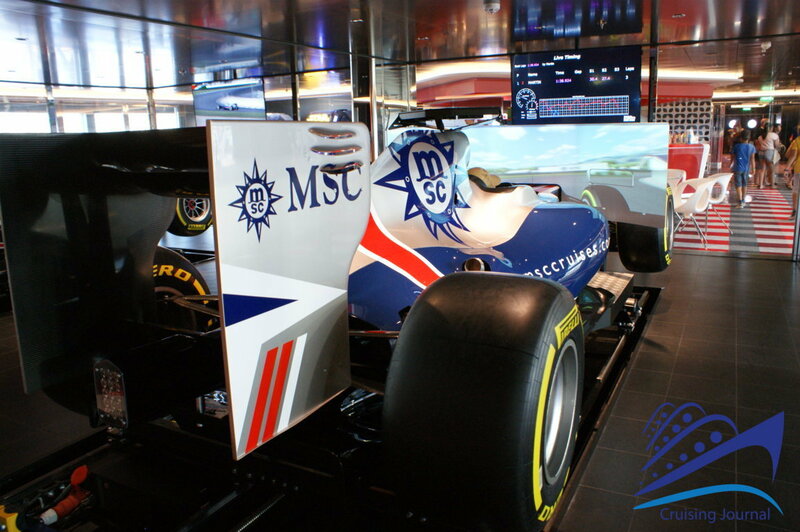 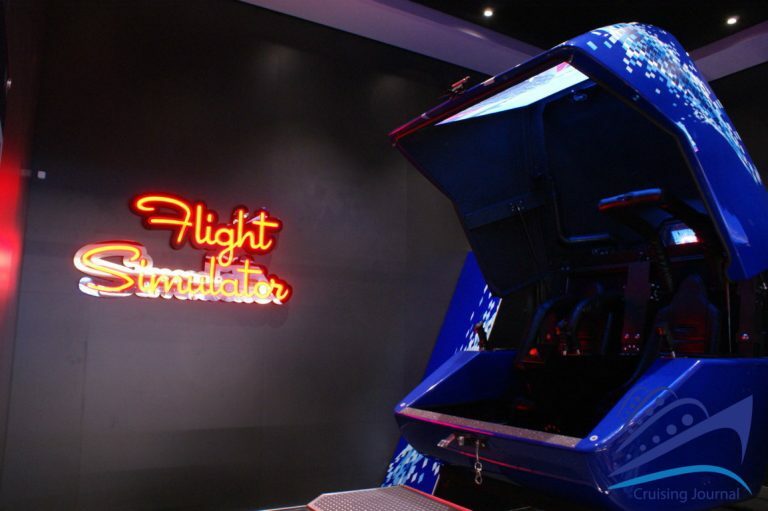 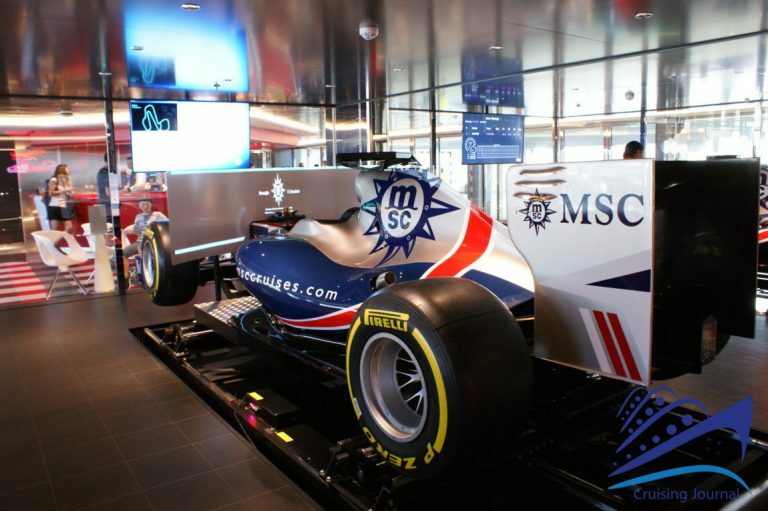 Even more towards the stern we have the Cinema 4D and the flight and Formula 1 simulators. 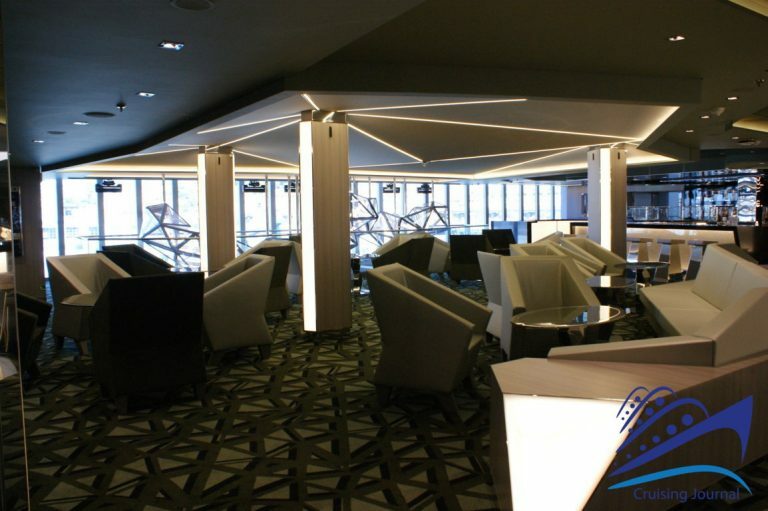 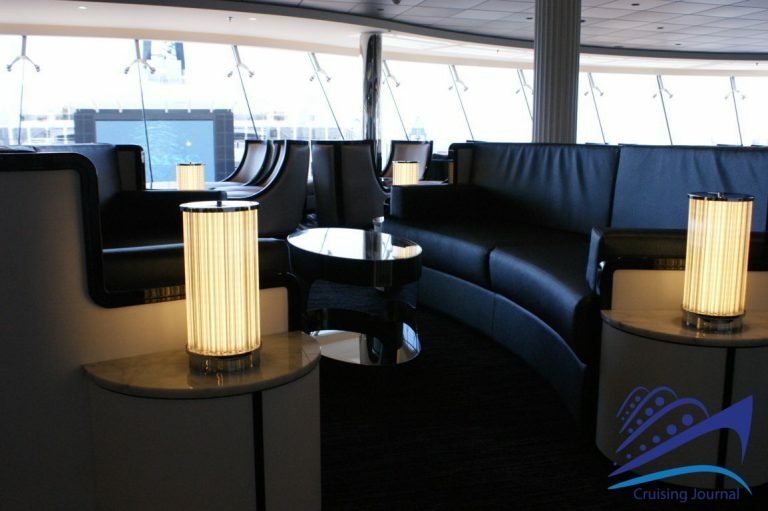 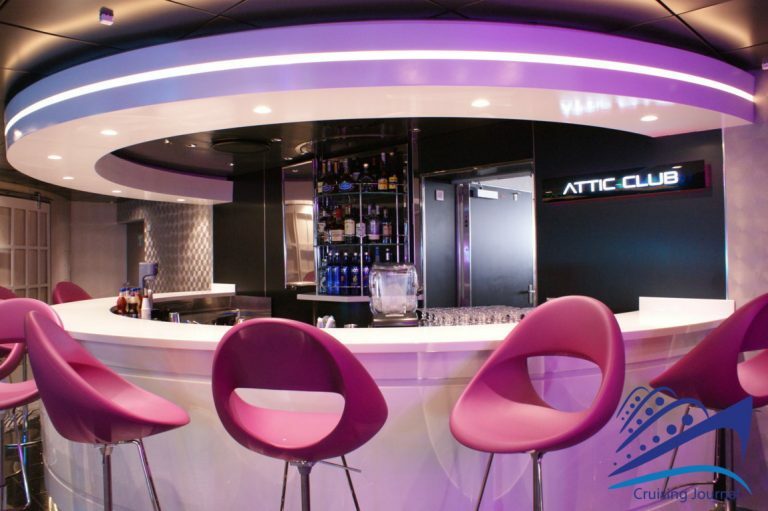 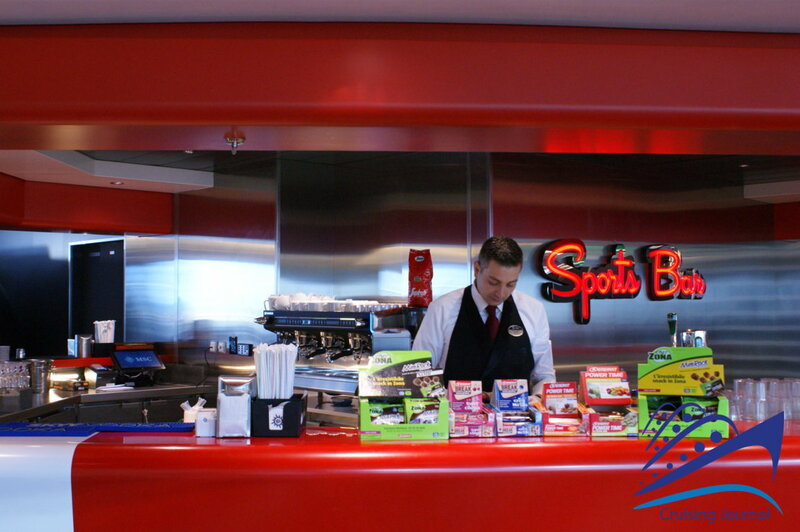 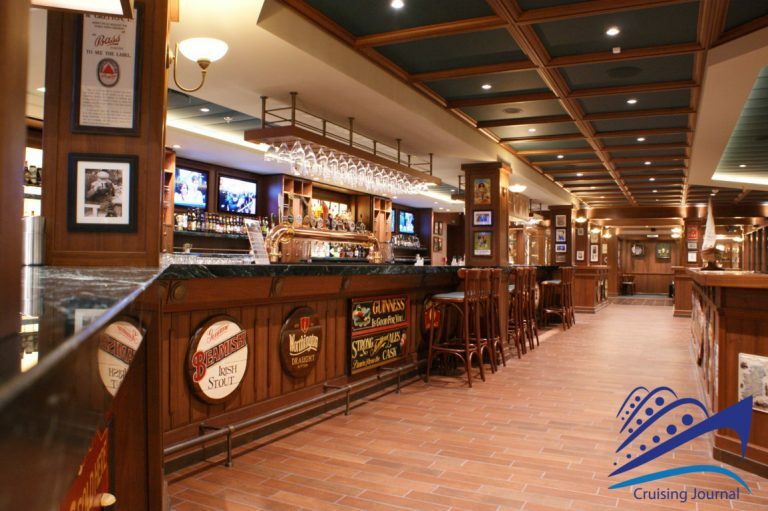 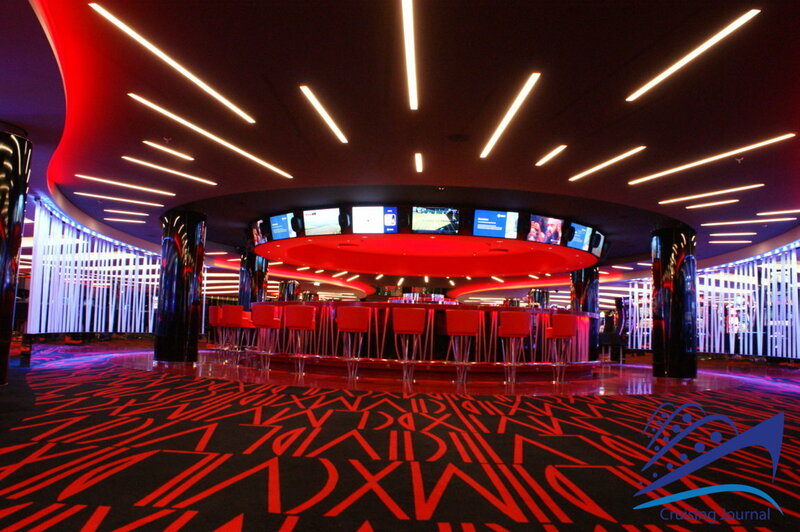 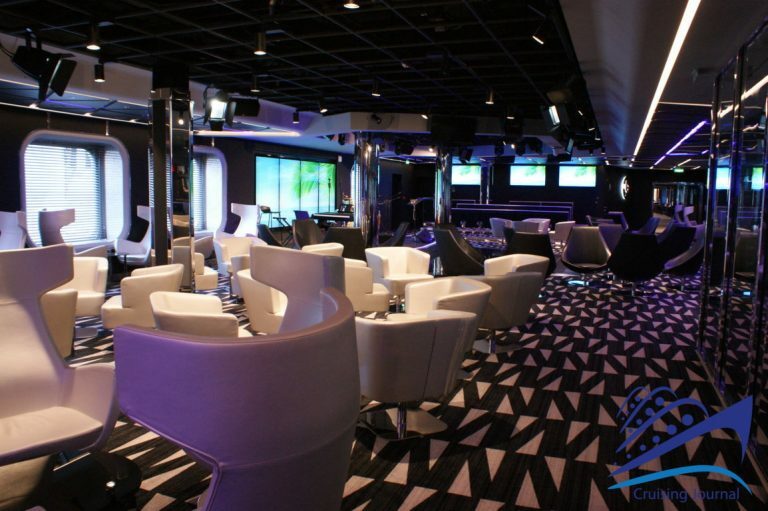 Around the Sports Bar we have other video games, two bowling alleys and the large Sportplex, a multipurpose sports platform available to passengers. 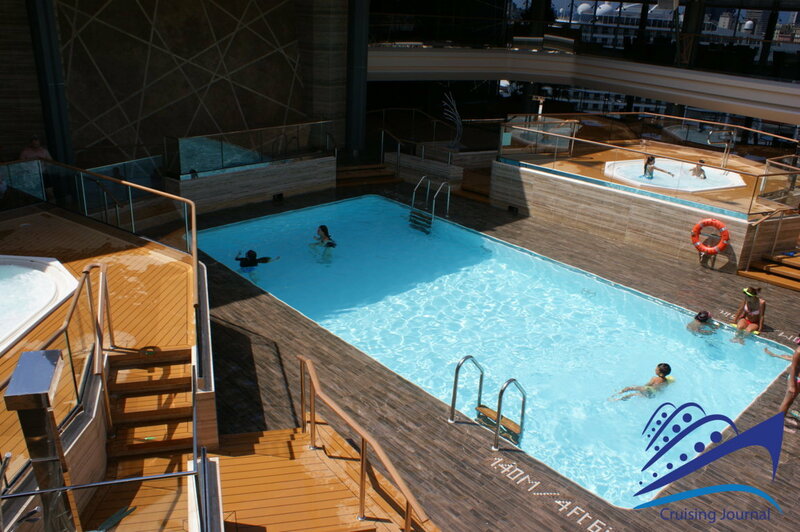 Continuing towards the stern, there is the Horizon Anphitheatre, with a series of sunbeds and a swimming pool at the end of the stern. Bridge 15: Yacht Club still at the bow. Deluxe Suites, some inside and the two Royal Suites, equipped with large verandas with a private Jacuzzi. A little further back, towards the center of the ship, we have the Bamboo Pool and its Bamboo Bar, a first swimming pool with two large side hydro-massages and a self-propelled roof to be used during all seasons. 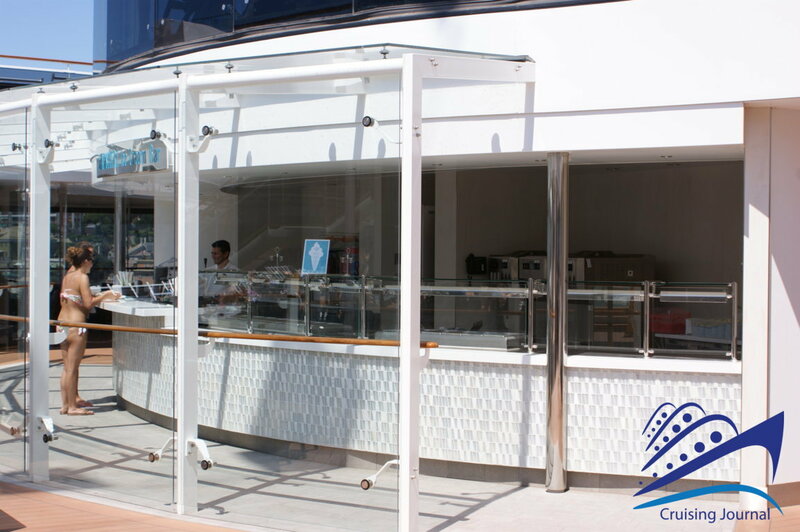 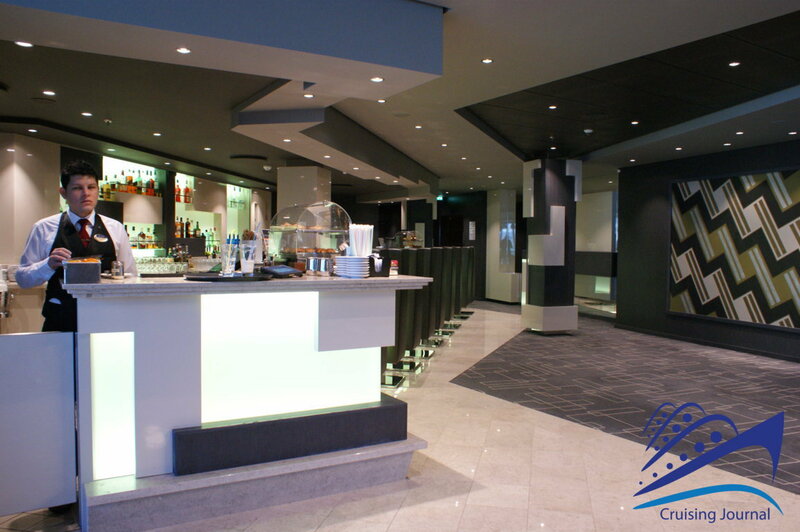 Further on we have the main pool, served by the Atmposphere Bar North on one side and the Atmposphere Bar South on the other, flanked by the Atmosphere Ice Cream Bar. 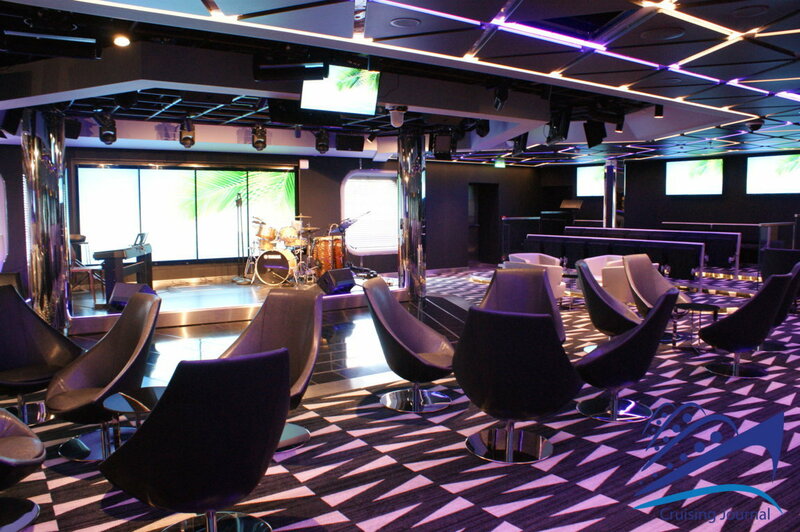 A large Dance Floor welcomes dance classes, shows and entertainment. 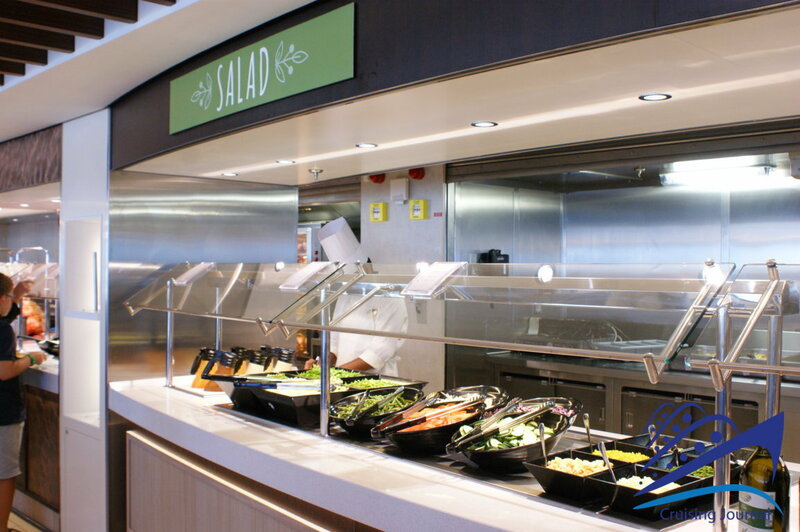 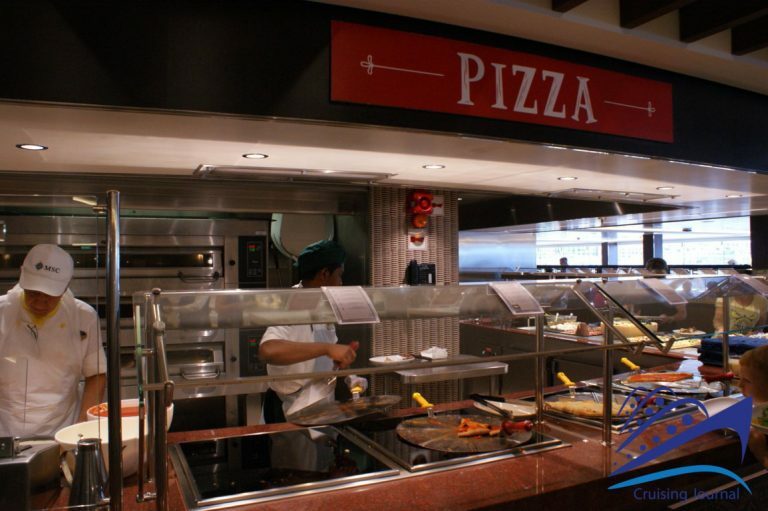 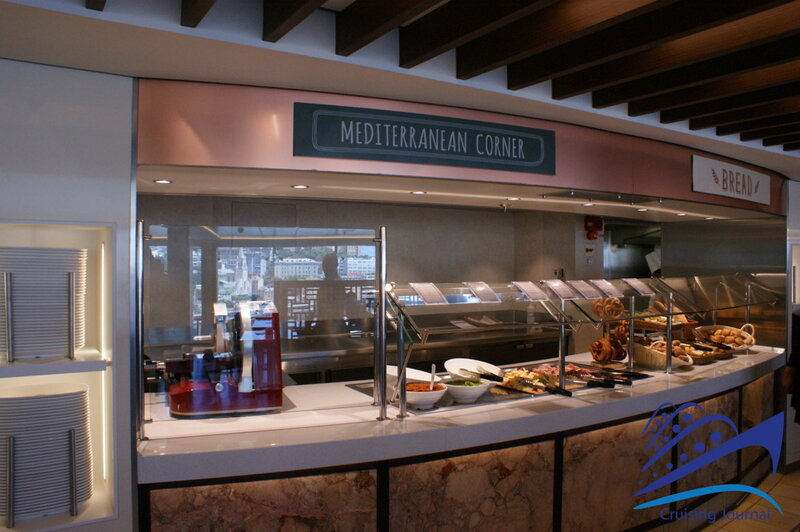 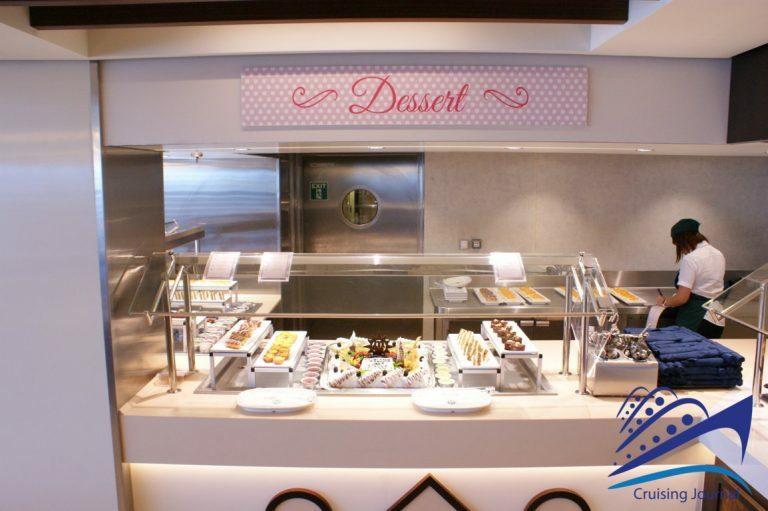 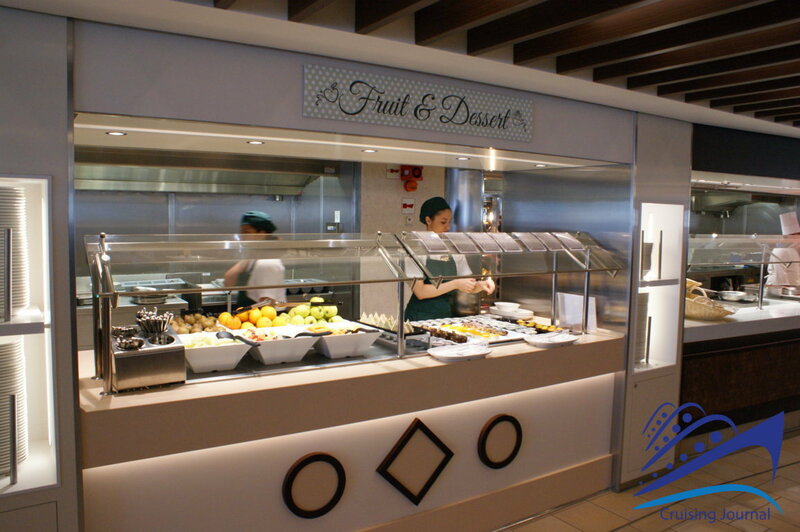 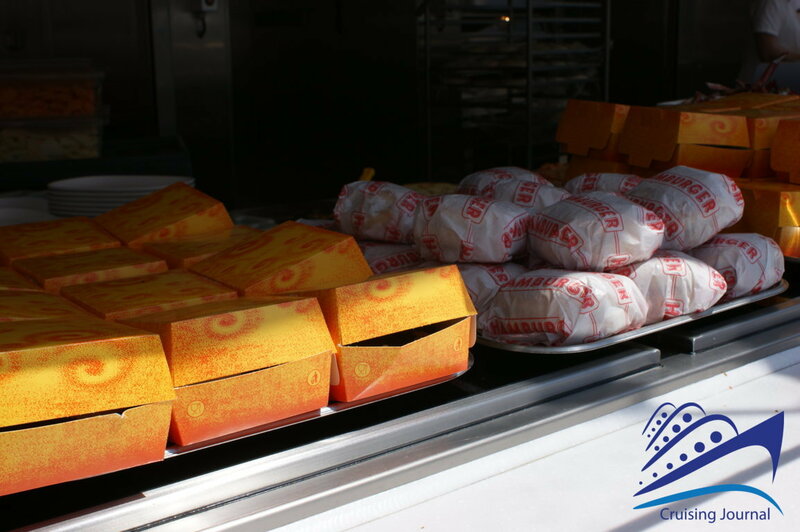 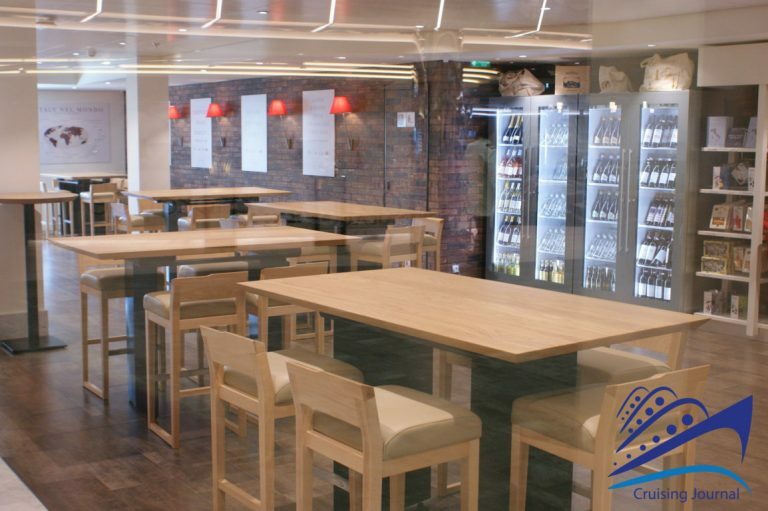 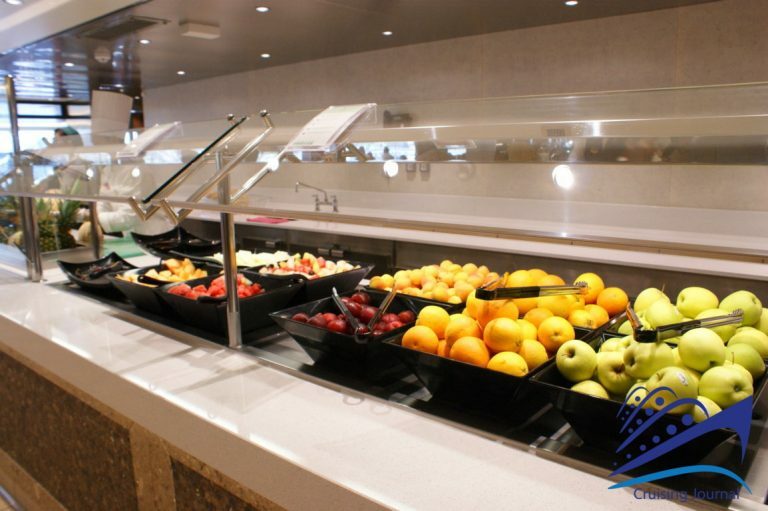 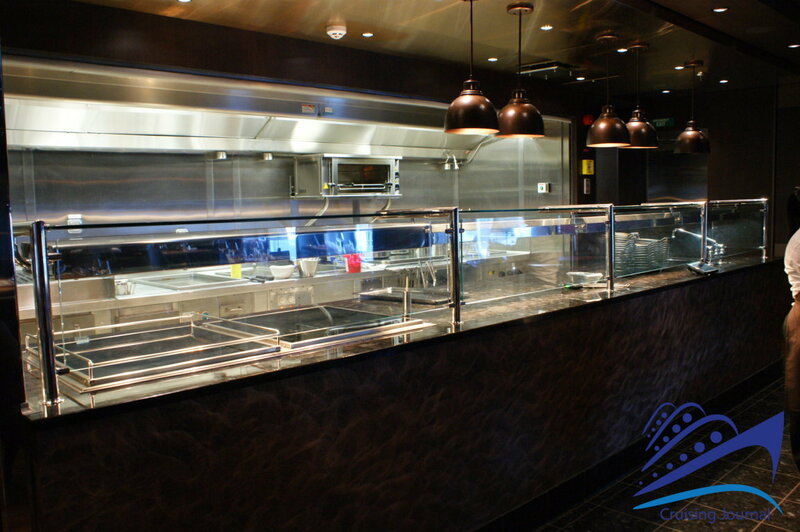 The aft part of bridge 15 is occupied by the Buffet area. 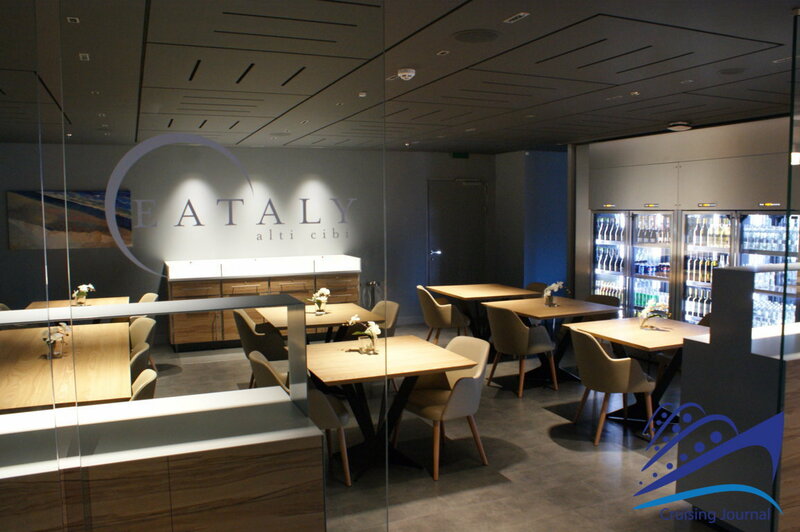 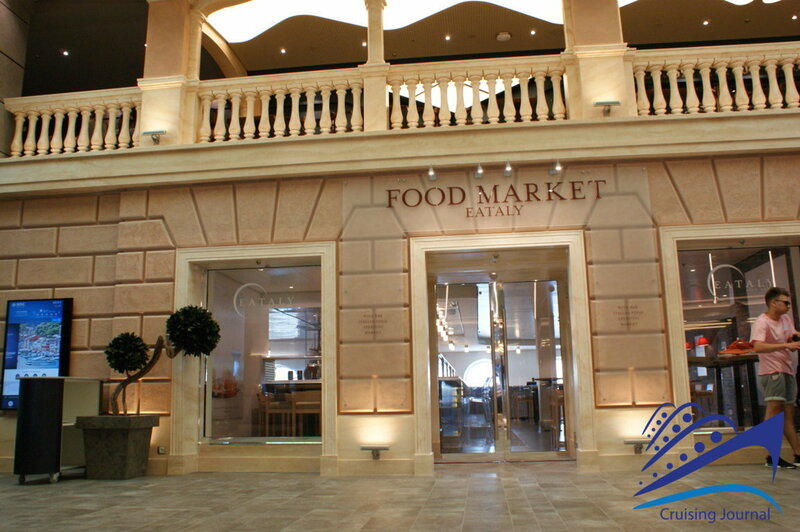 The Marketplace is 3550 square meters wide, open 20 hours a day, with an open kitchen, an area dedicated to the production of mozzarella, others to thematic dishes, from green to ethnic, and a fruit and vegetable market. 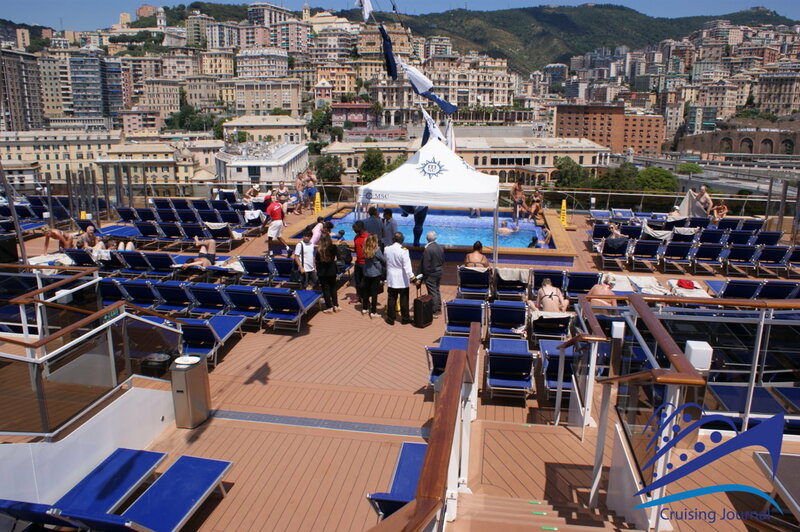 On the aft terrace, which isn’t very large, you can eat outside. 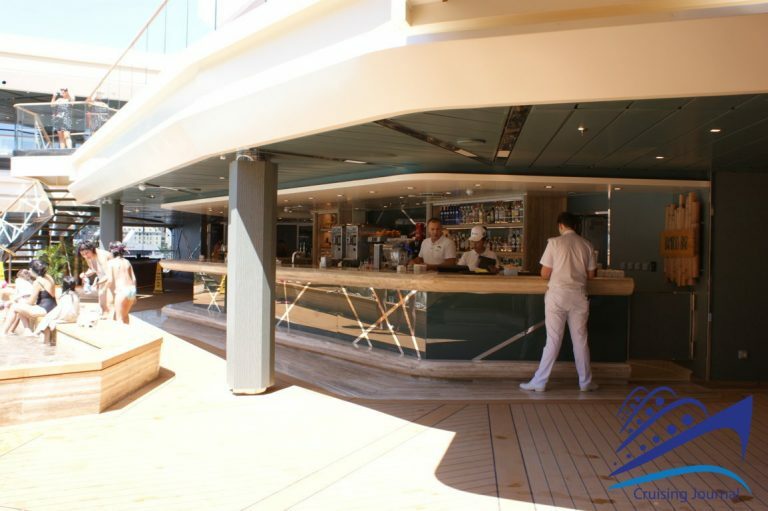 Decks 14-13-12-11-10-9-8: still the Suite Deluxe Yacht Club at the bow, others inside and two Welness Suites complete the reserved area, followed by some Aurea Suites with balcony. 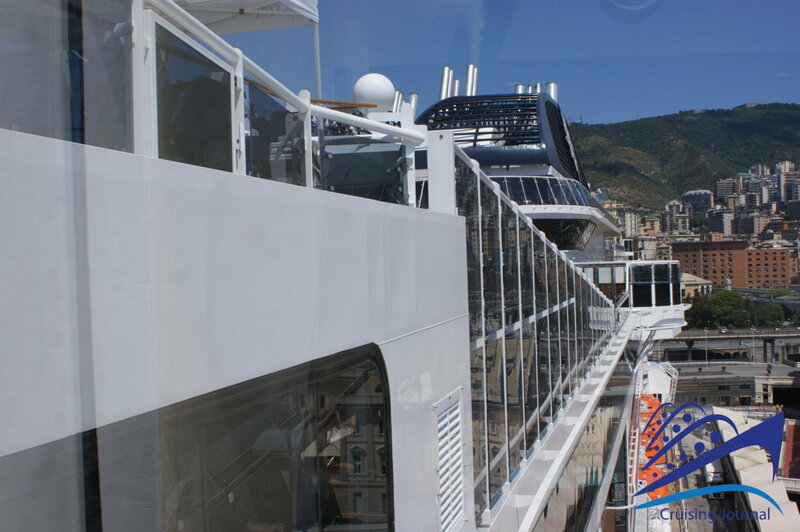 Continuing towards the stern there is a long series of cabins, of various categories, from the ones inside to the Wellness Balcony ones. 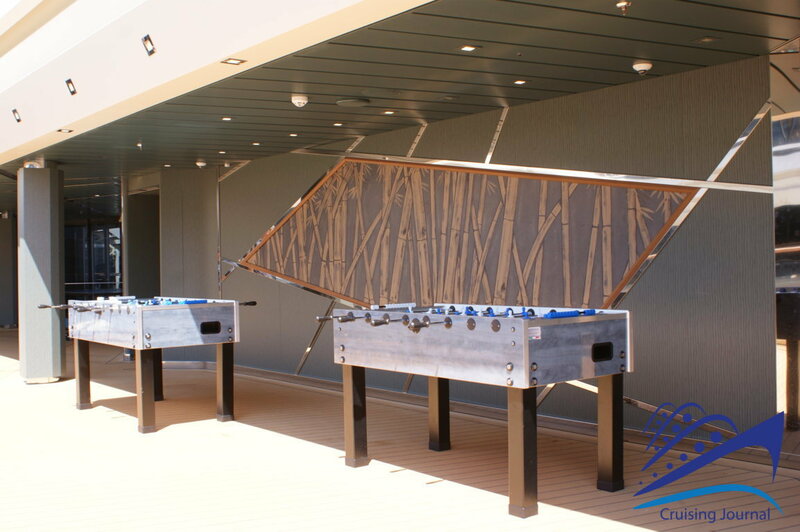 At bridges 13 and 12 there are other Aurea Suites at the bow and 3 Duplex family in each level. Also, bridges 11, 10 and 9 have bow cabins that can be converted into Family. 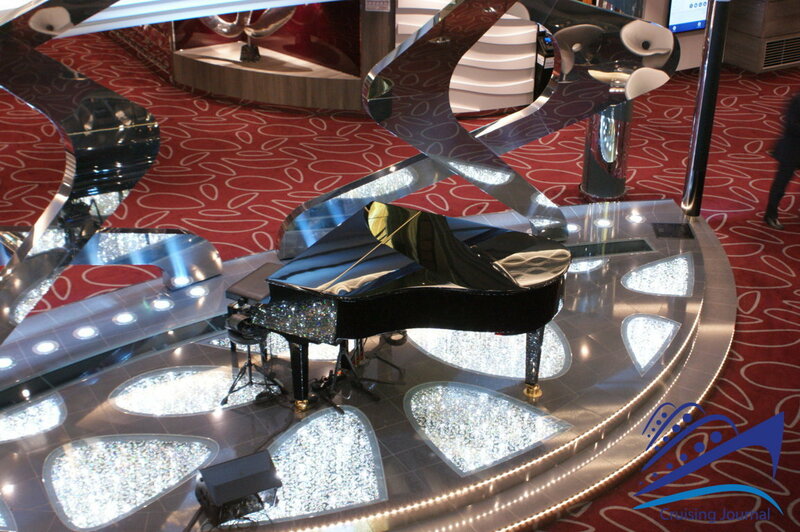 From deck 7 we go back to welcoming common spots. 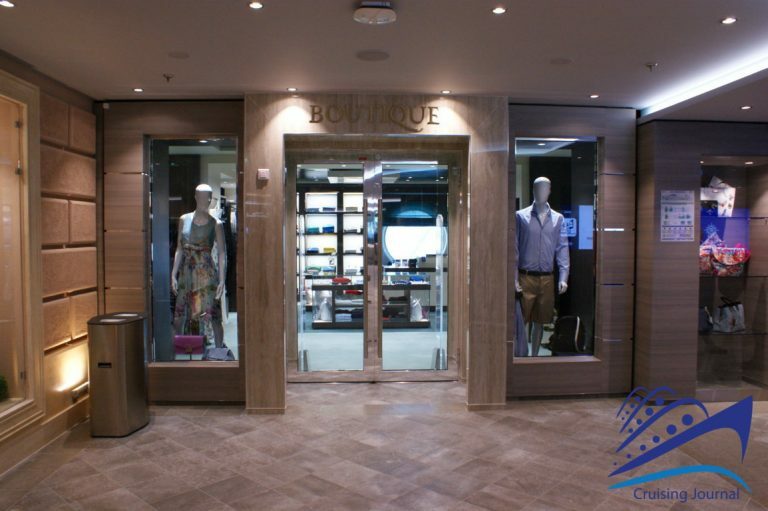 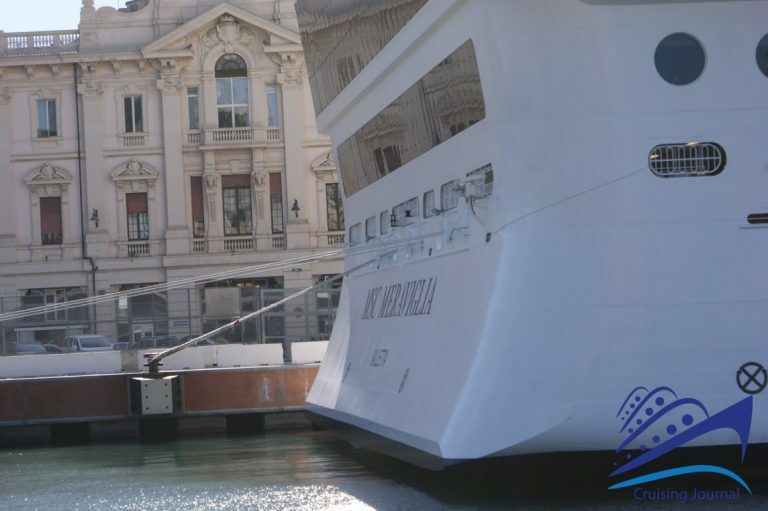 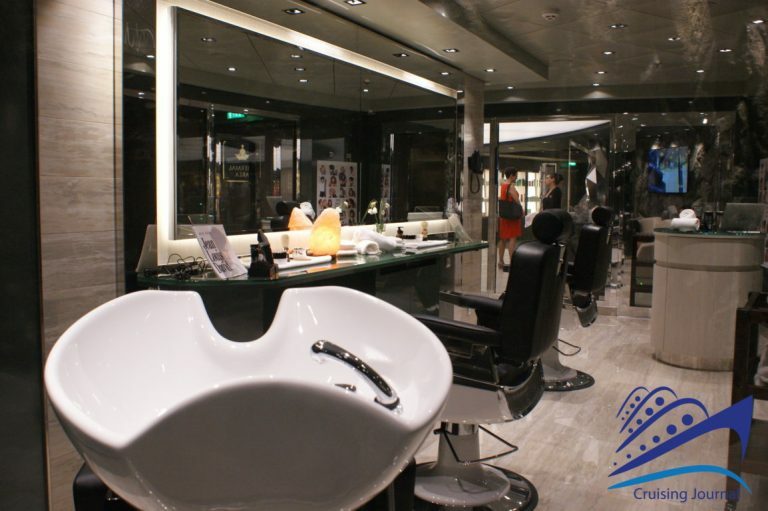 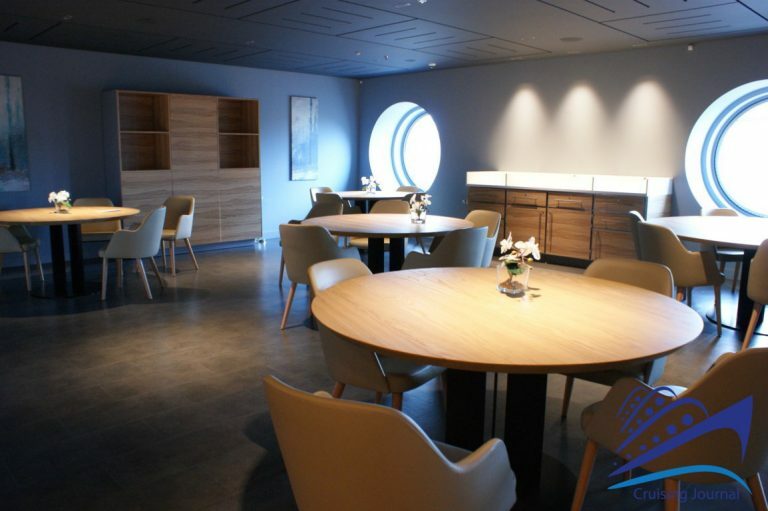 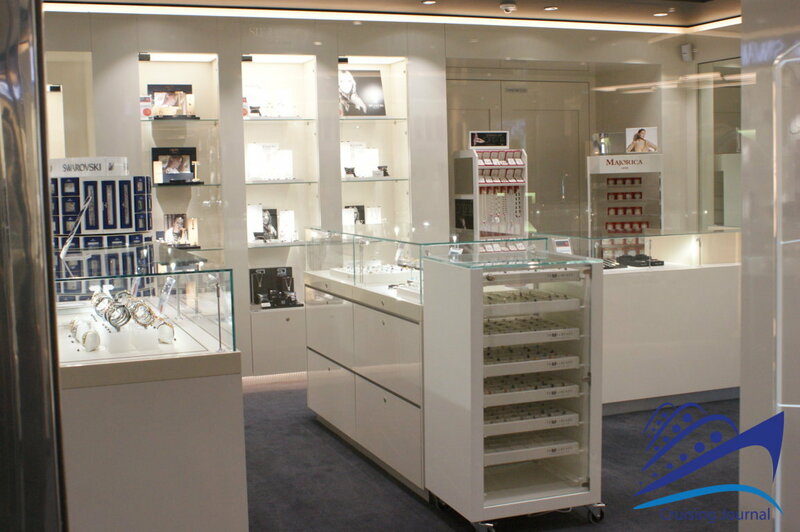 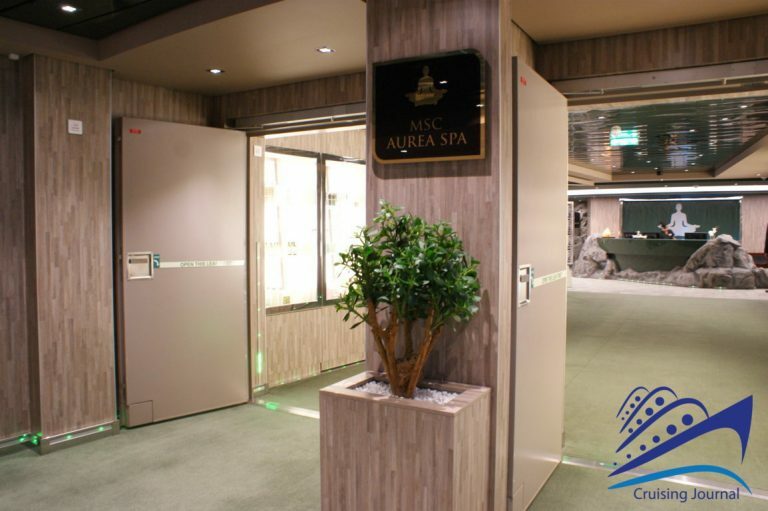 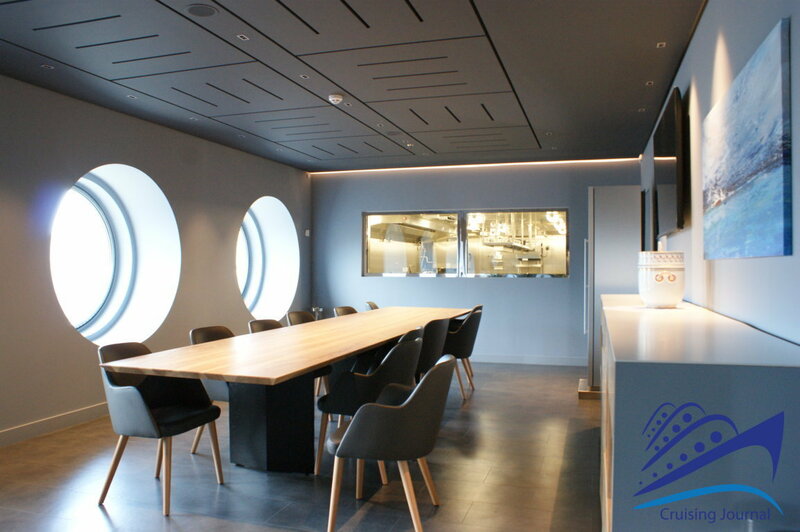 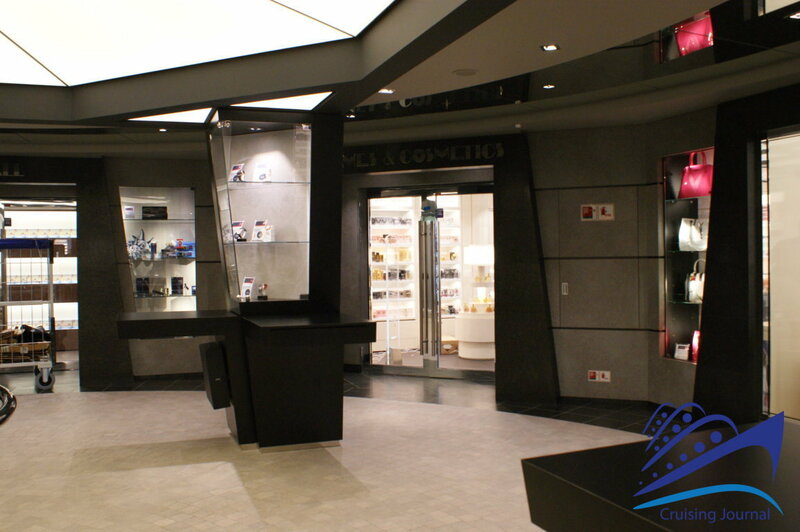 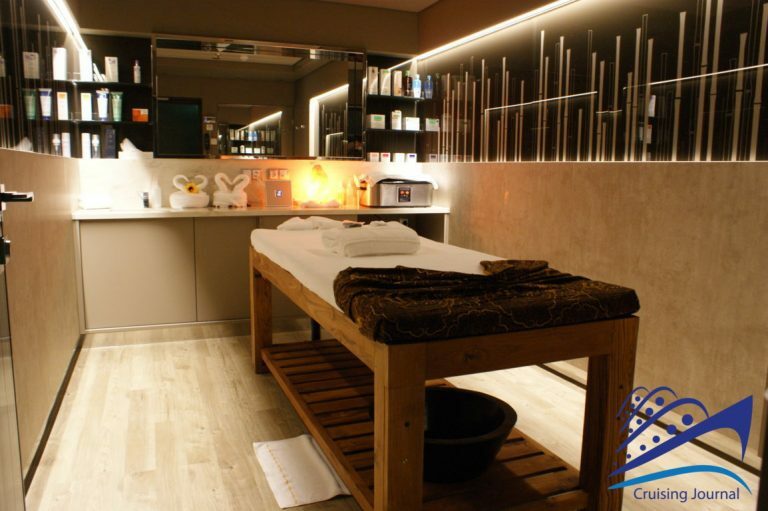 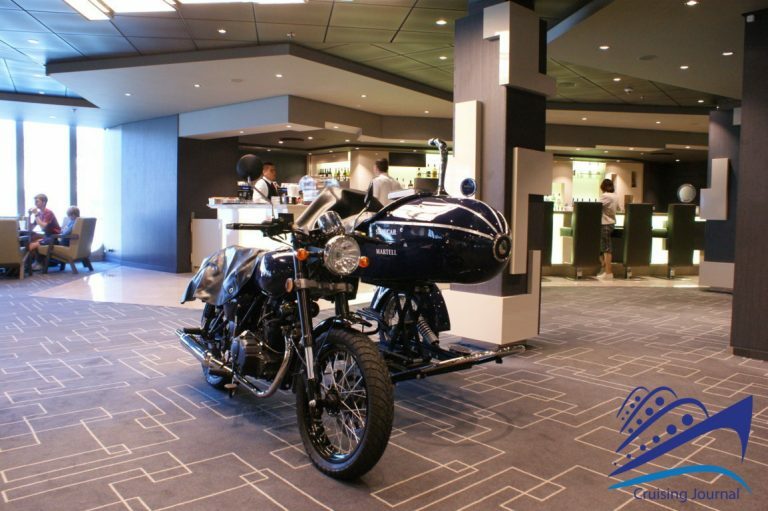 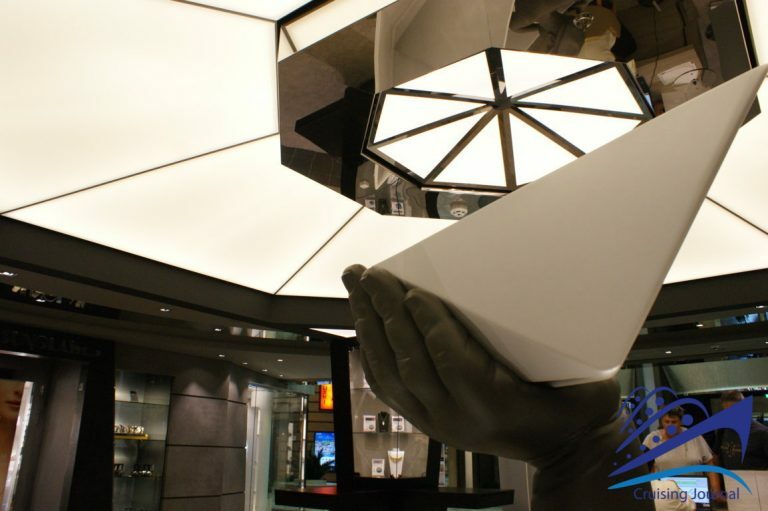 The bow area is occupied by the Msc Aurea Spa, over 1,100 square meters between spa area, aesthetic doctor, Jean Louis David hairstyle salon, barber shop and treatment rooms. 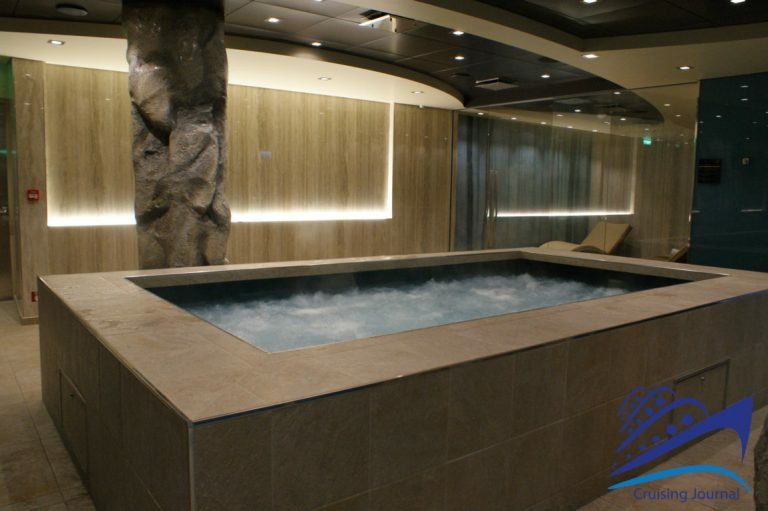 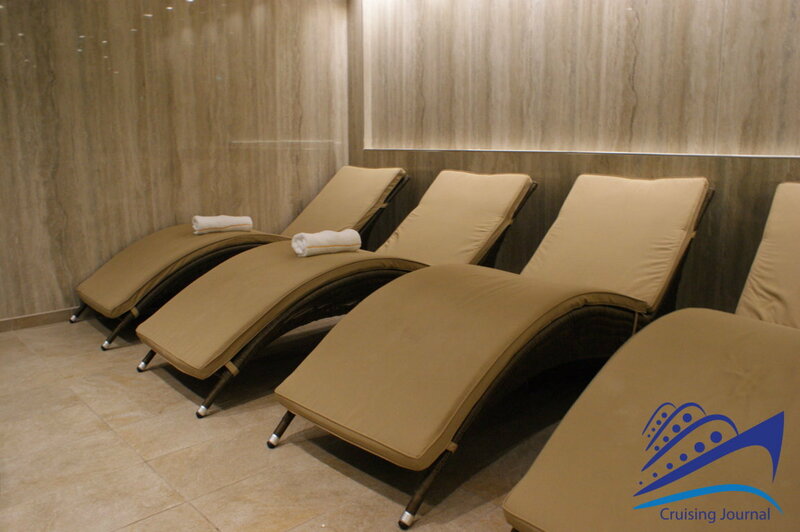 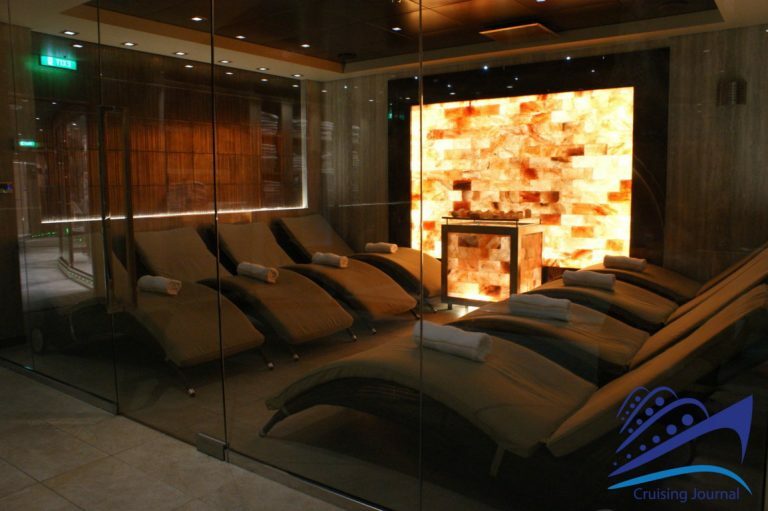 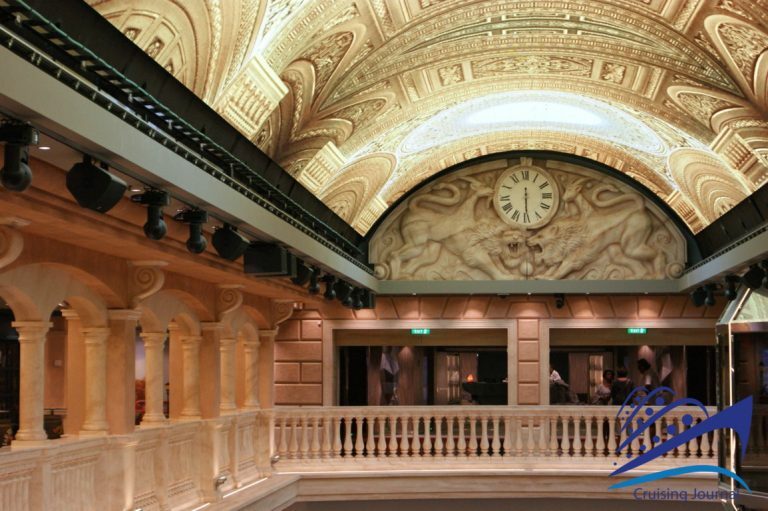 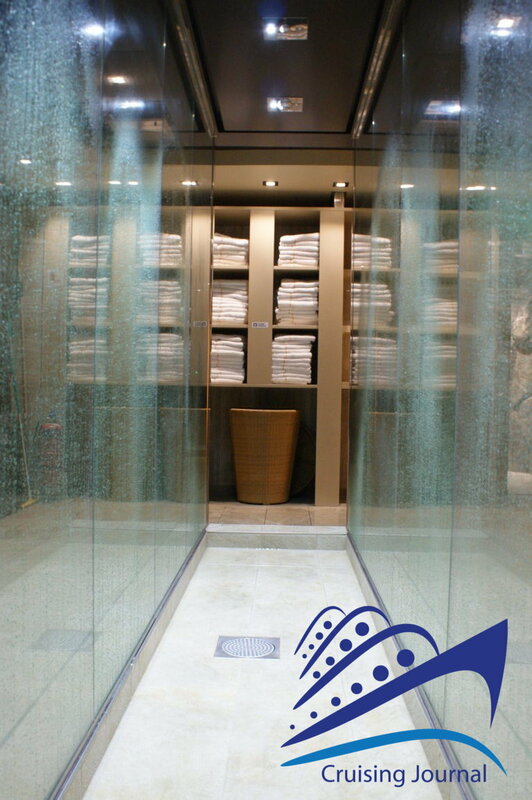 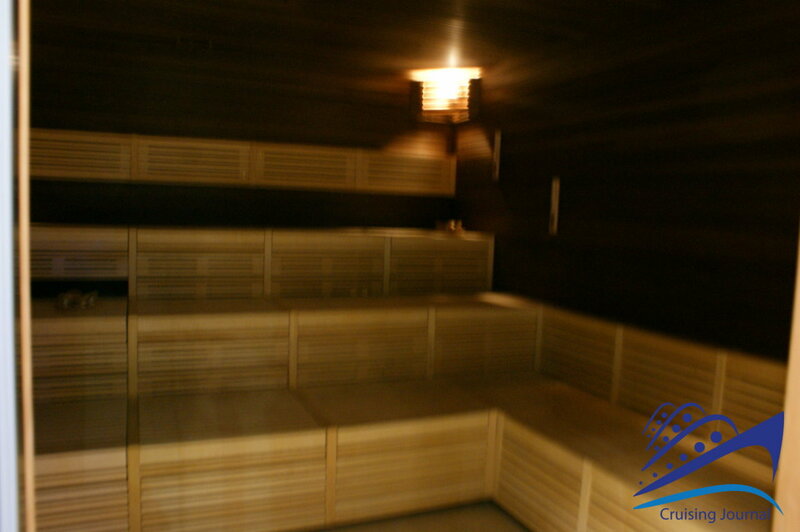 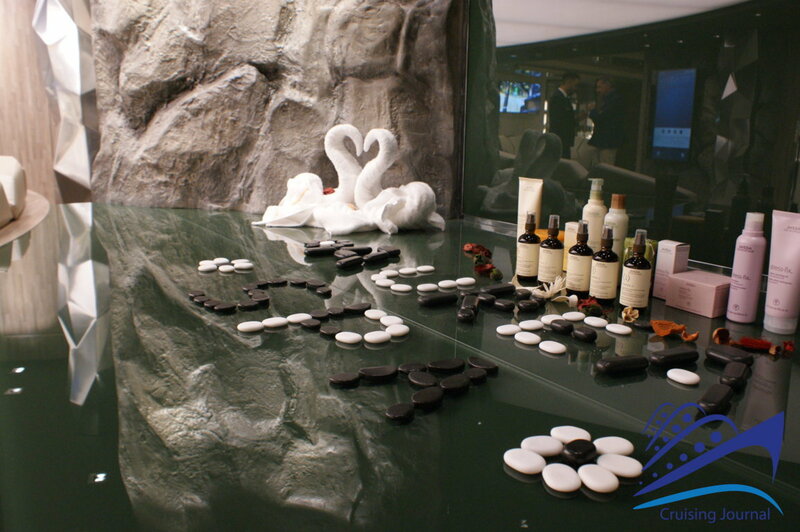 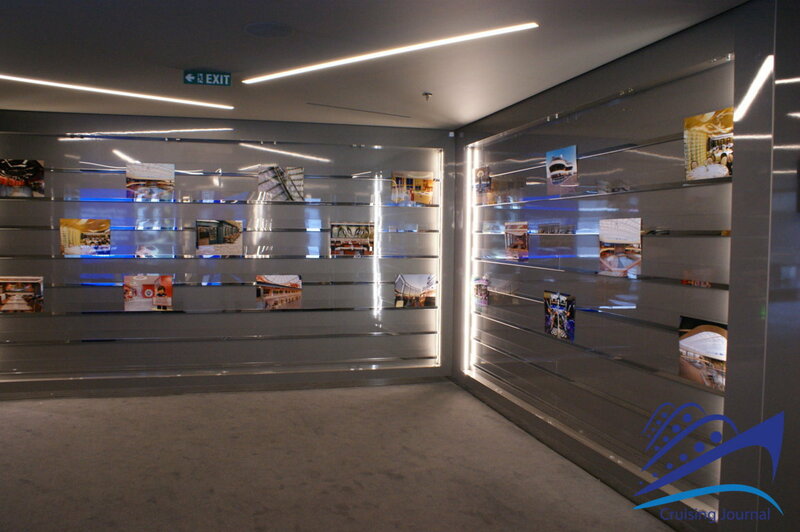 The spa area features exotic interiors, mosaics and wood, it also offers many saunas, Mediterranean steam baths and Turkish baths, as well as cold rooms, a relaxation area, a salt room and aromatic showers. The SPA offers a total of 20 different types of massages, 20 body treatments and 30 facial treatments. 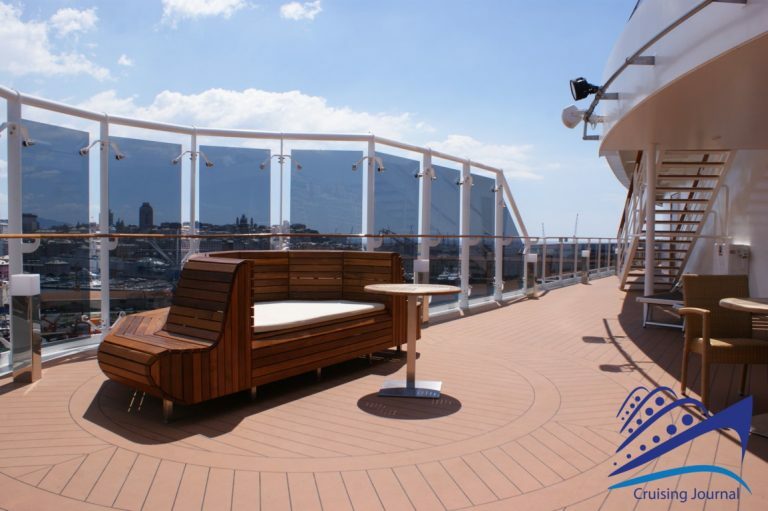 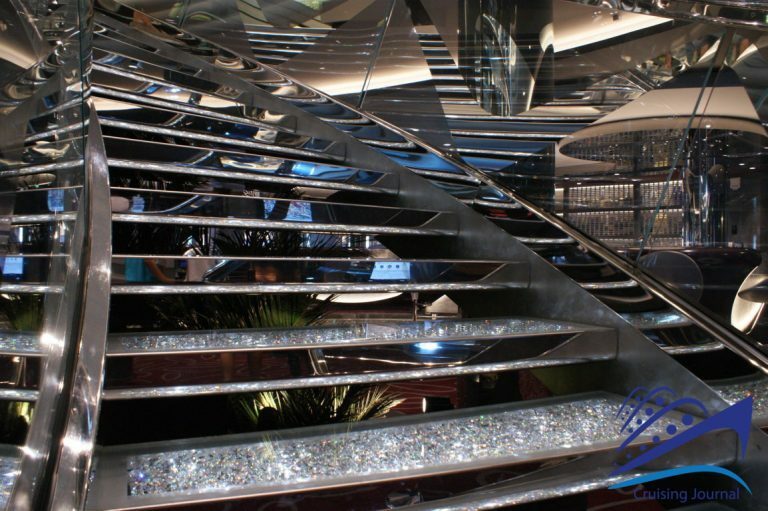 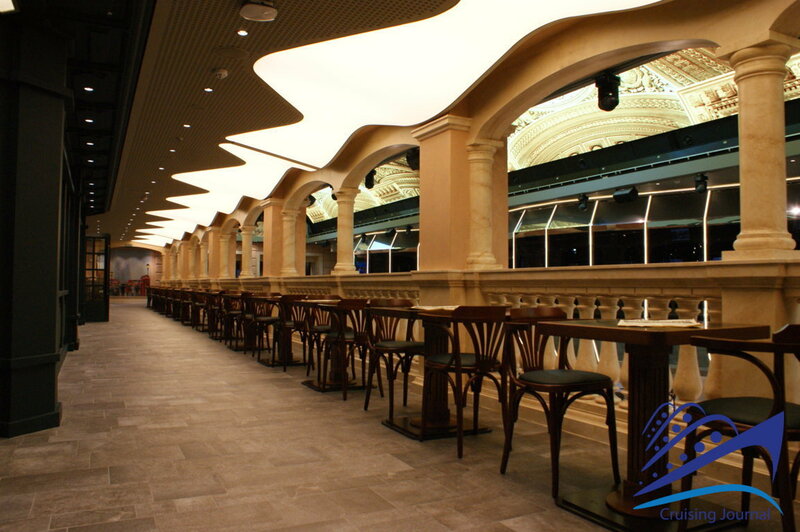 Deck 7 welcomes the balcony on the Promenade and then a series of rooms overlooking the gallery. 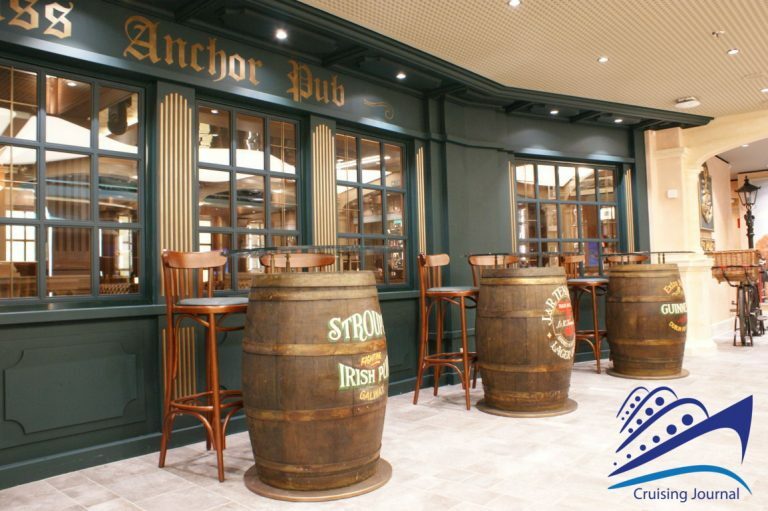 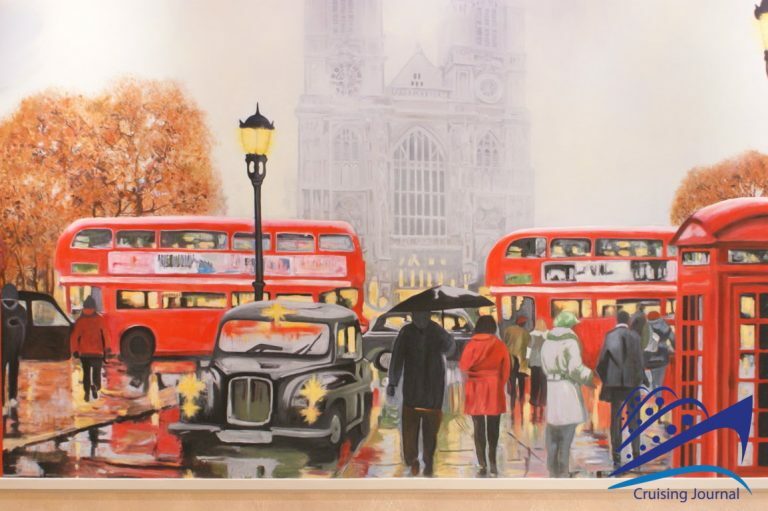 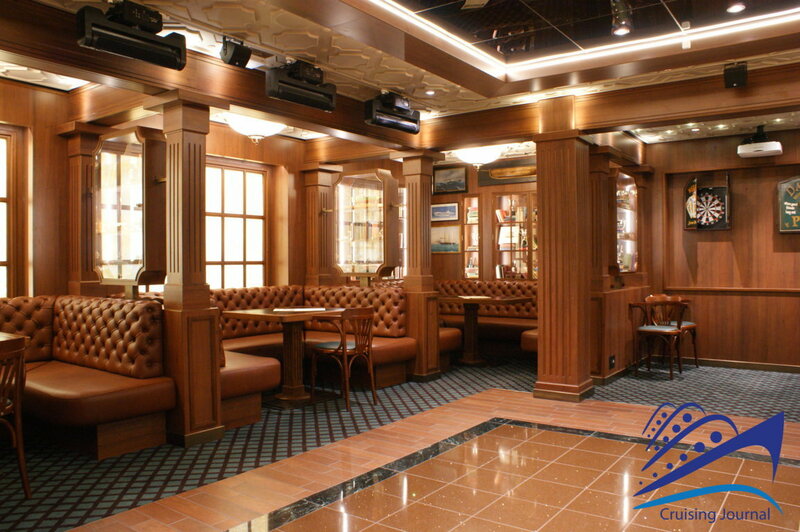 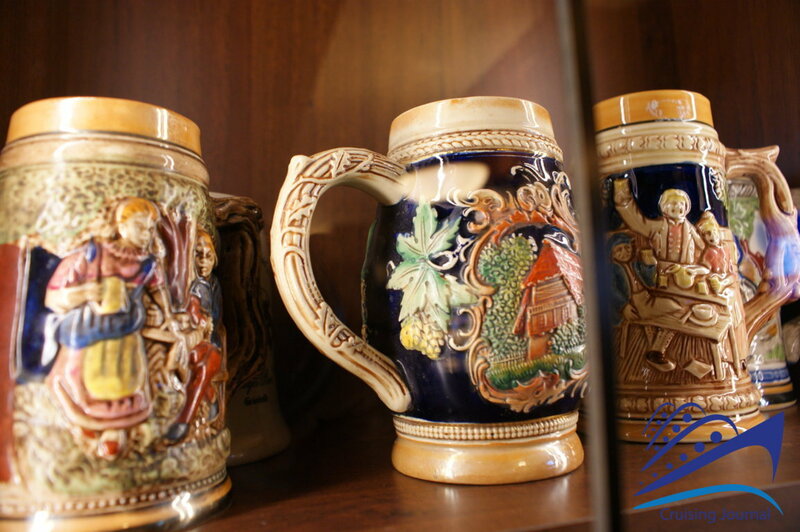 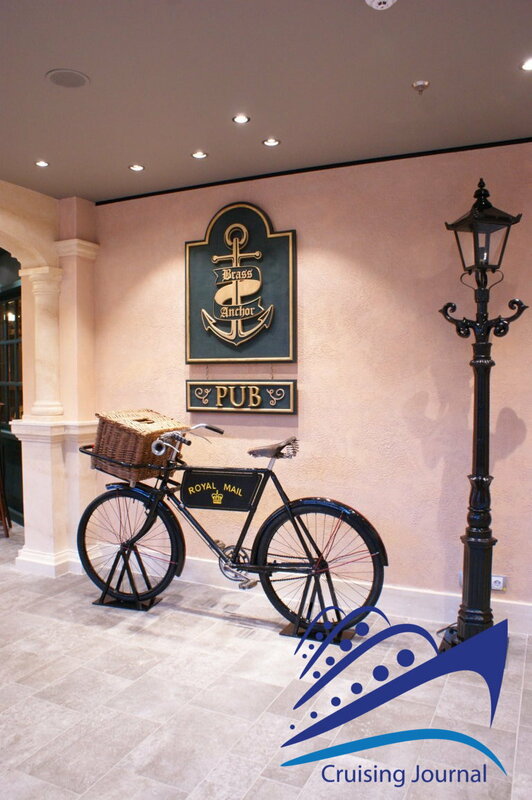 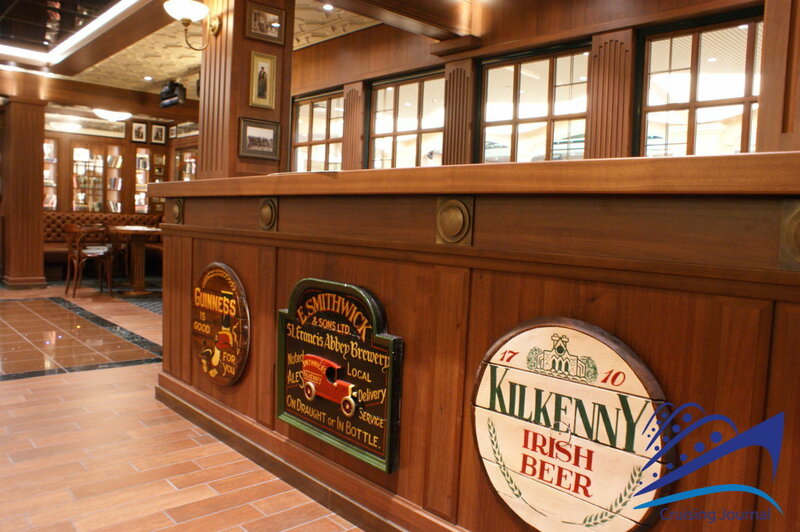 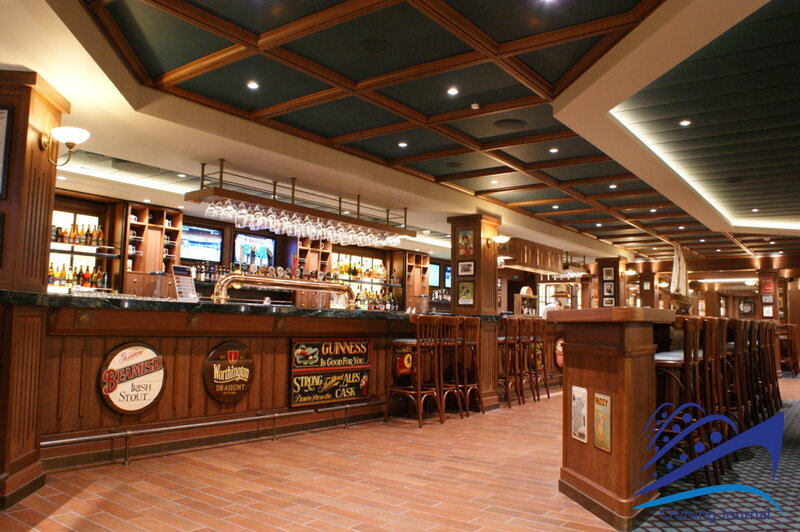 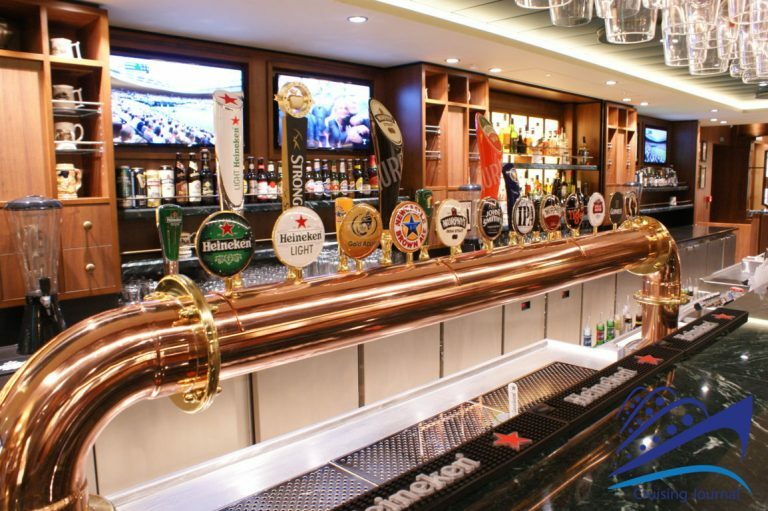 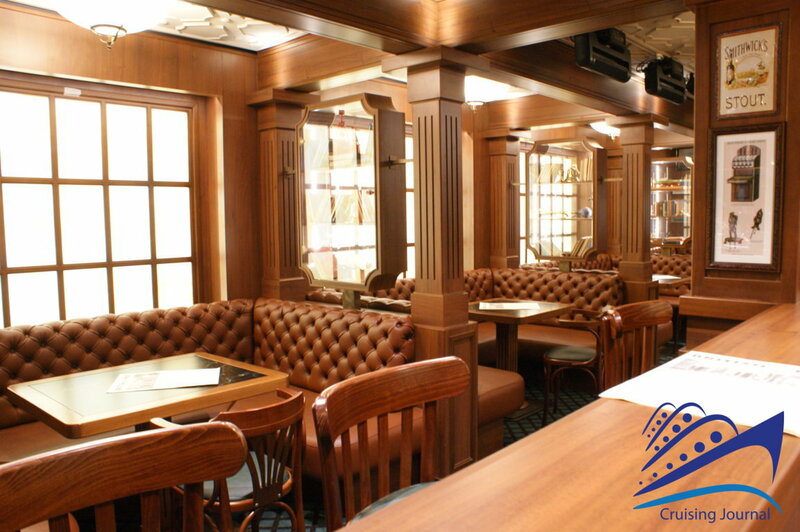 The Brass Anchor is the typical English pub, with small tables overlooking the Promenade and cozy wooden interior spaces, with a selection of draft beers and specialties. 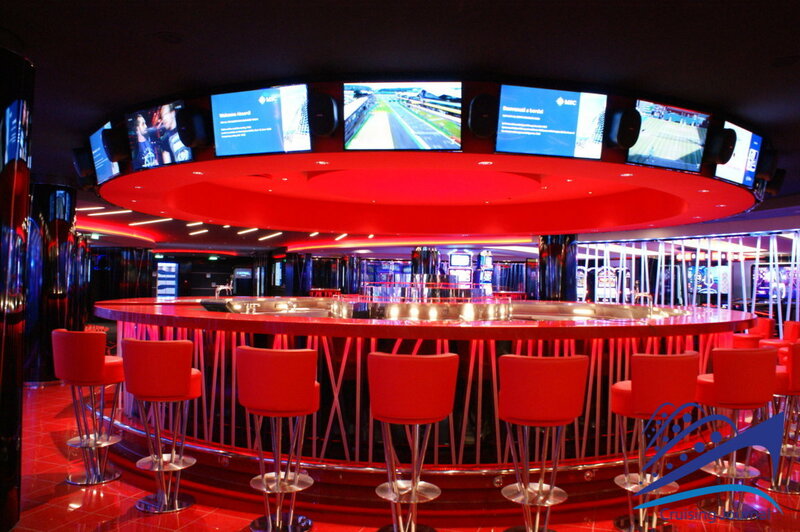 Opposite, on the other side, we have the most modern TV Studio Bar, dedicated to interactive entertainment, shows and projections. Continuing towards the stern you have three specialty restaurants: from the Butcher’s Cut, a modern American steakhouse with an open kitchen, to the Japanese alternative of Kaito Teppanyaki, which serves an eclectic series of Asian dishes through four teppanyaki grills used by the same number of chefs. 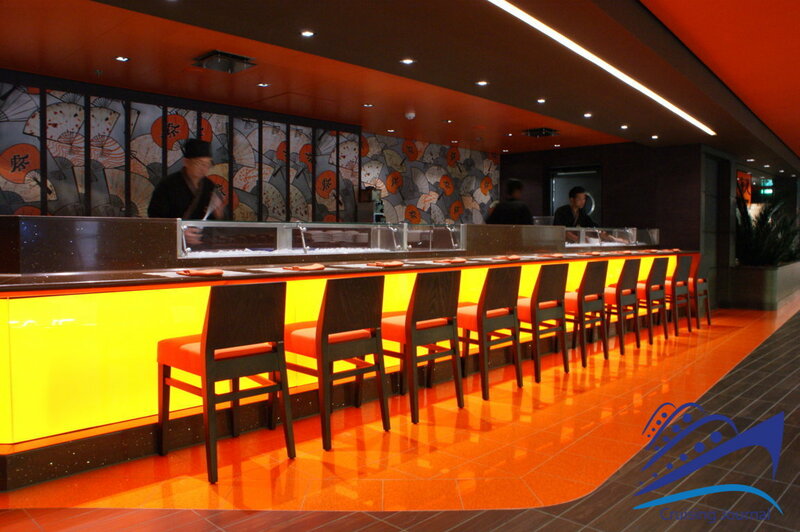 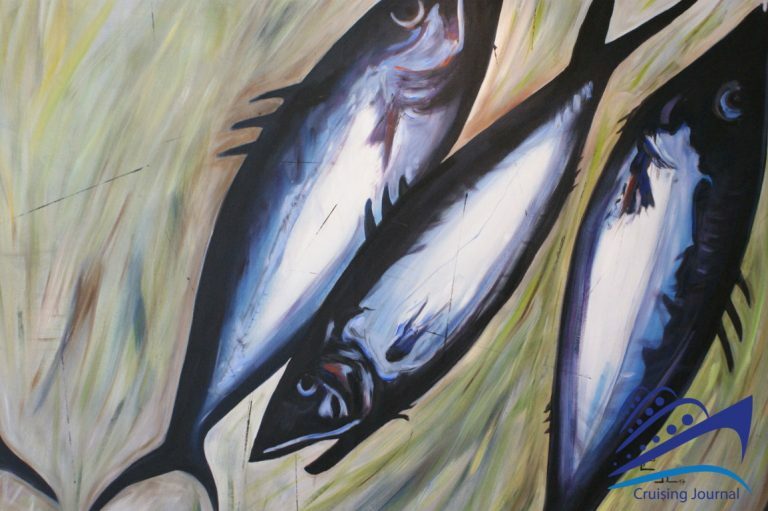 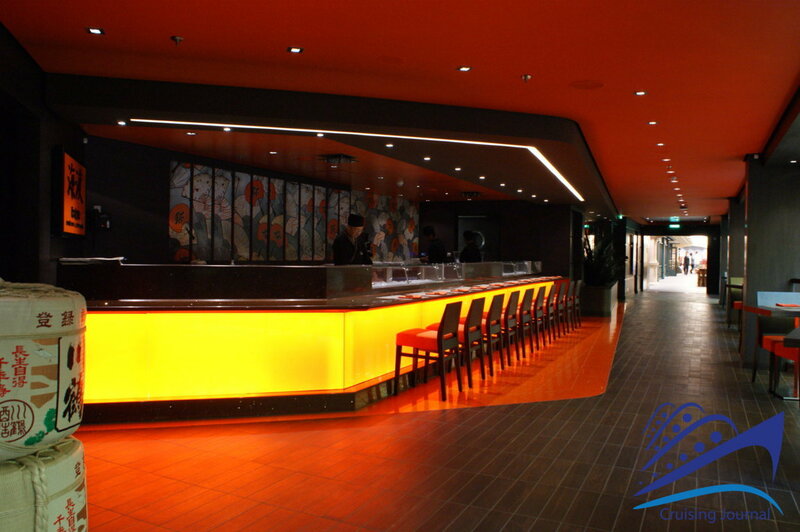 And, the Kaito Sushi Bar, already described as the “best sushi on the sea” by the Berlitz Complete Guide to Cruising & Cruise Ships, where you can enjoy, with a promenade view, sushi, sashimi and tempura, respecting the best Japanese traditions. 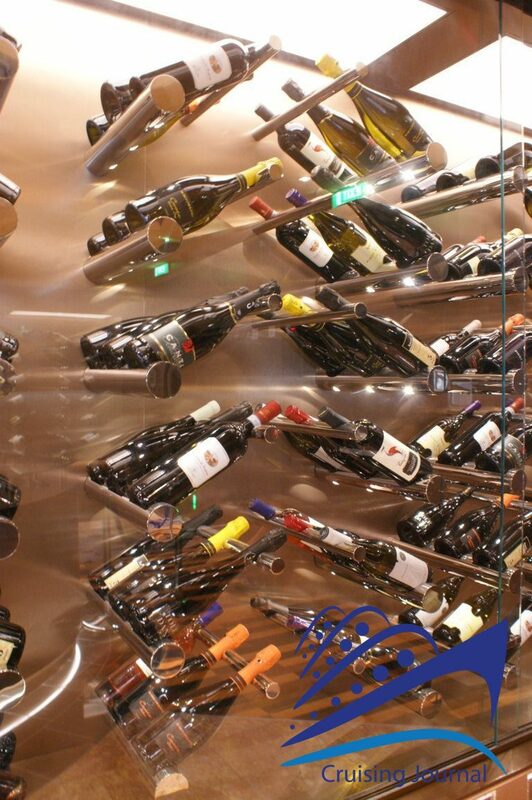 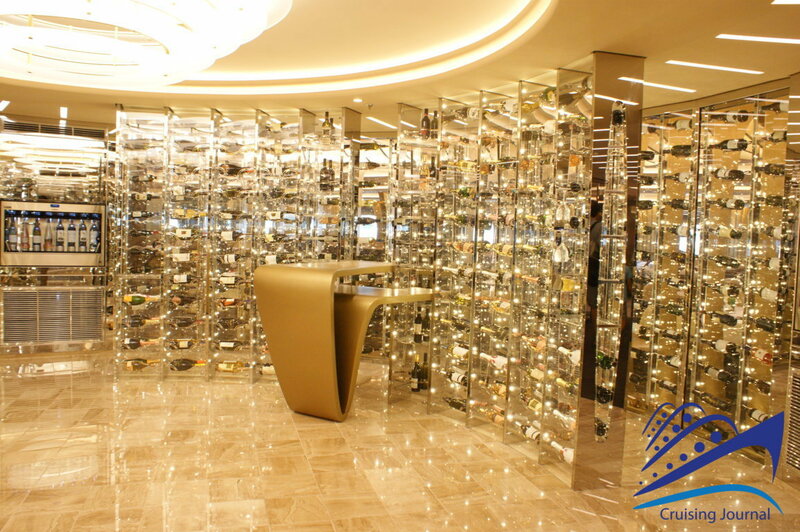 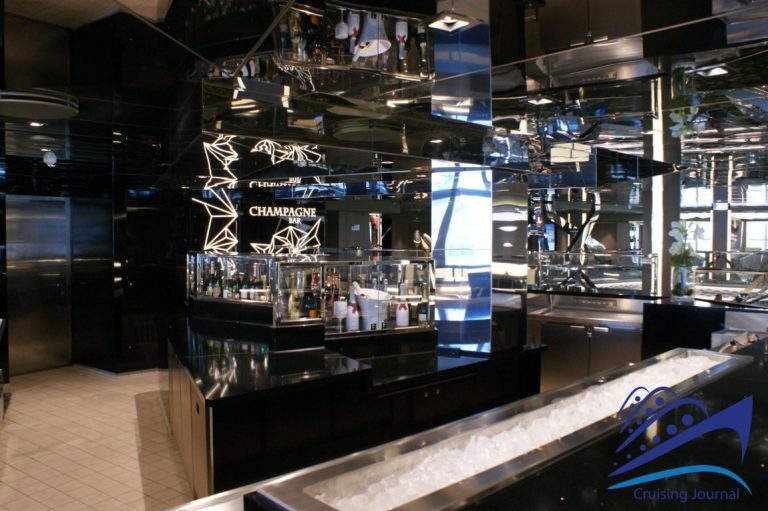 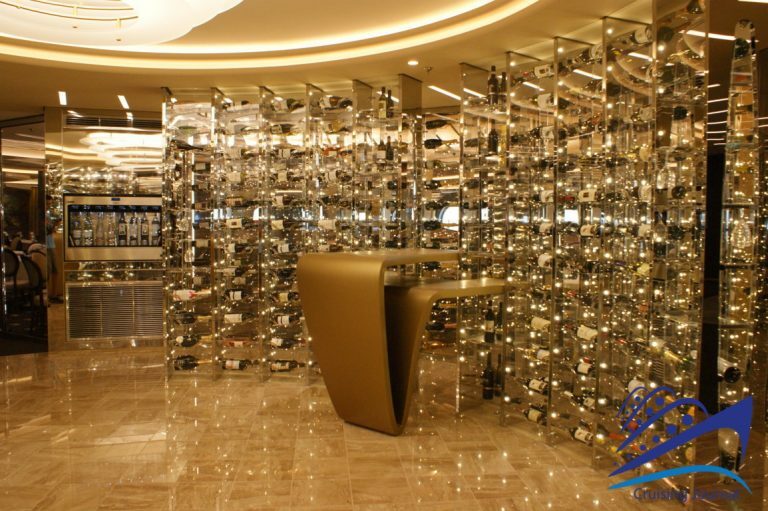 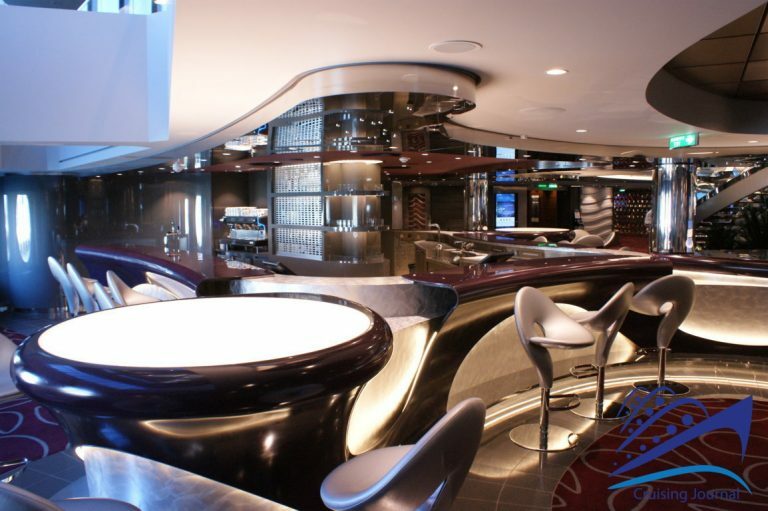 Further on, on both sides of the ship, we have the modern Champagne Bar, where you can taste the best bubbles of the most refined international cellars and you may accompany your glass with oysters, prawns, sashimi and other delicious crudités. 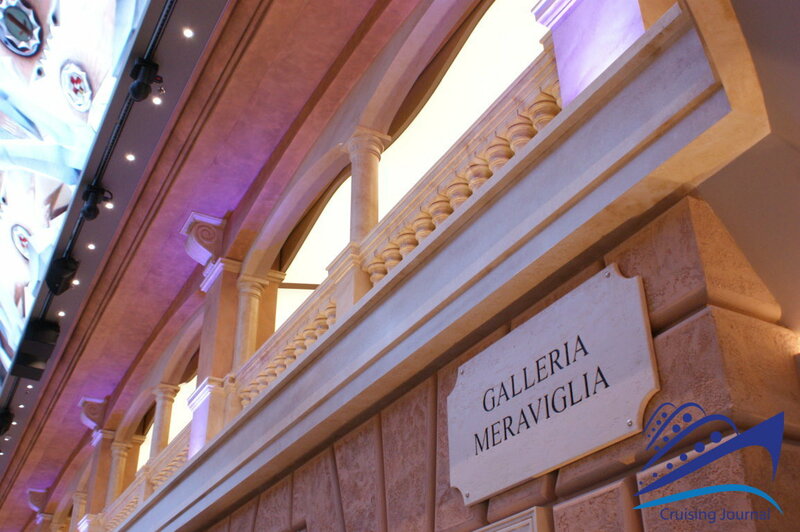 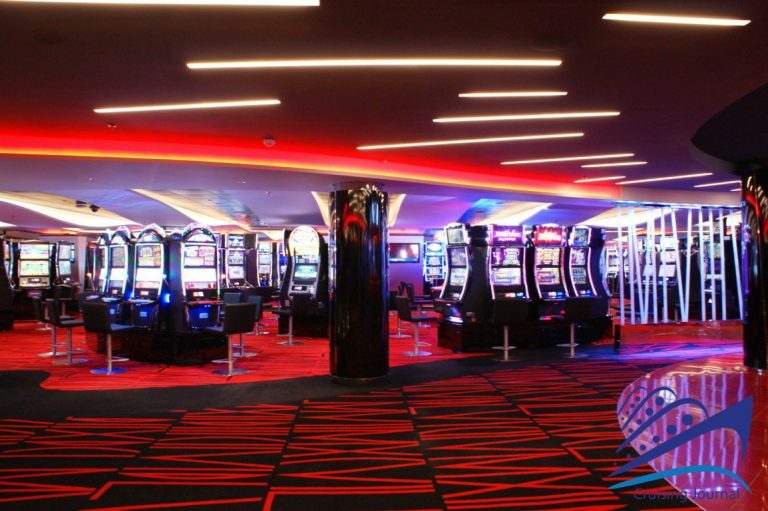 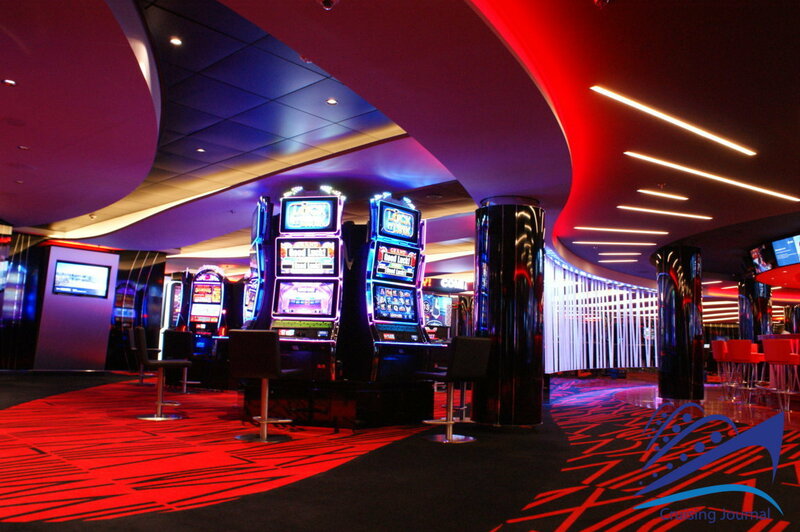 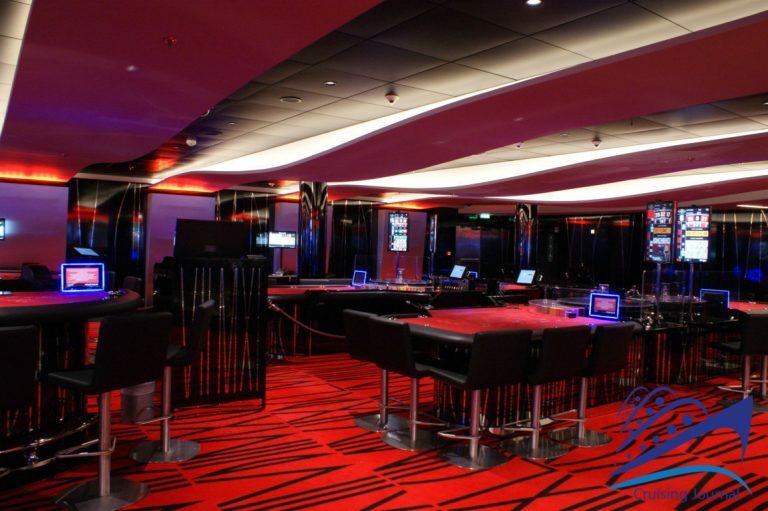 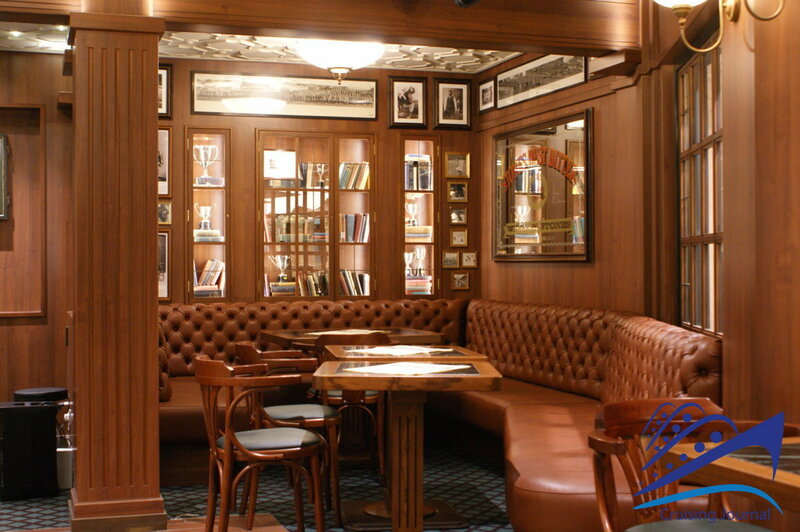 After passing the Meraviglia Library you reach the Casinò Imperiale: large, full of slots and with a good number of tables, with a large central round bar. 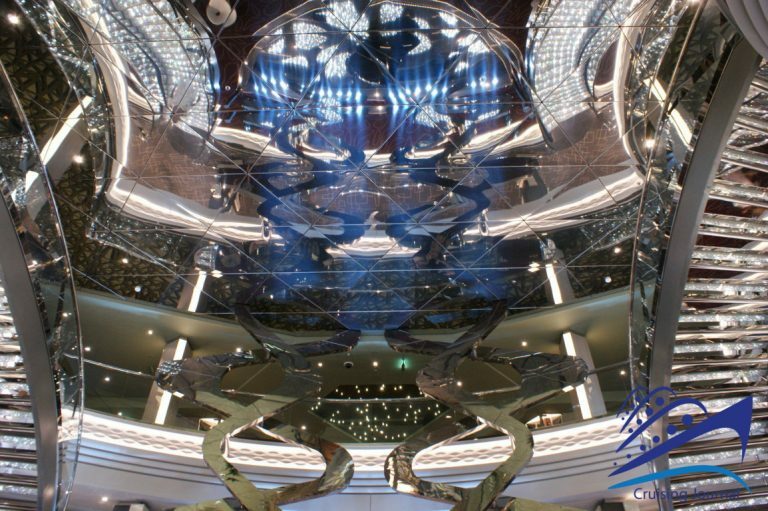 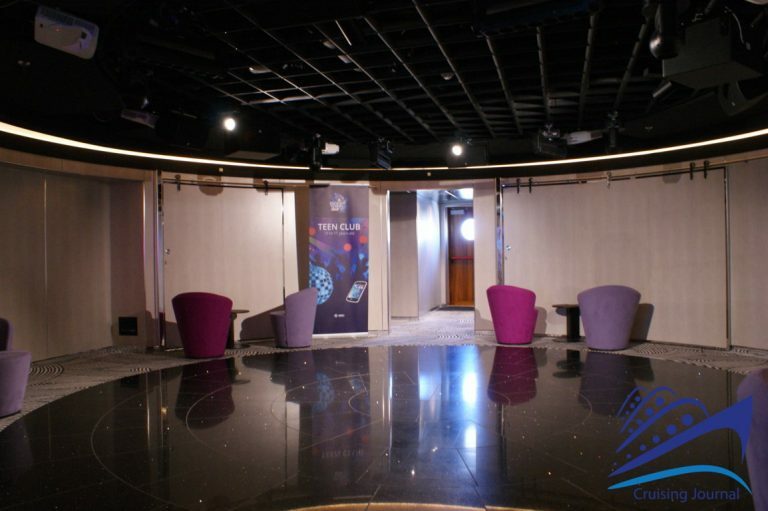 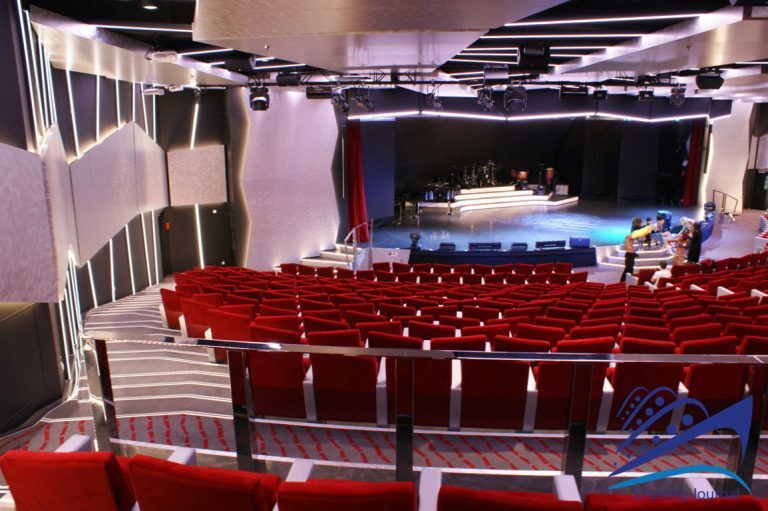 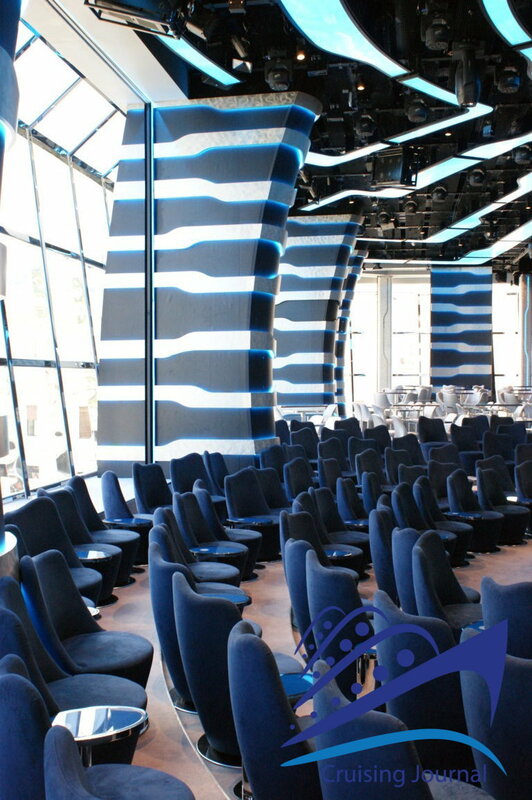 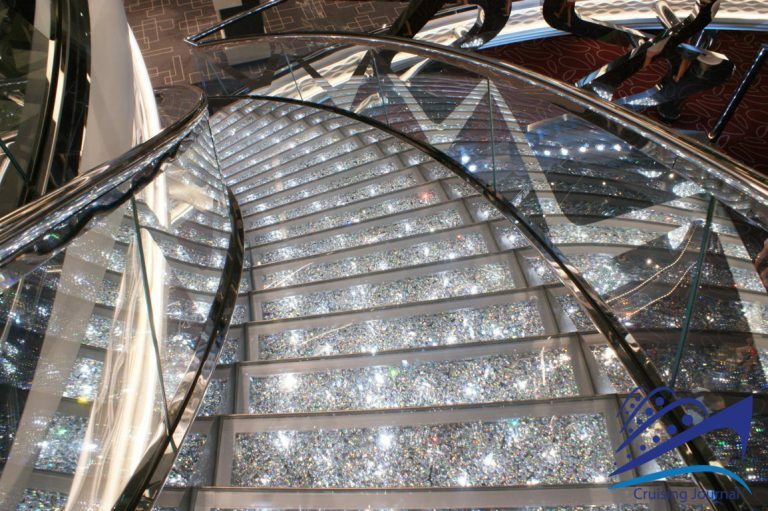 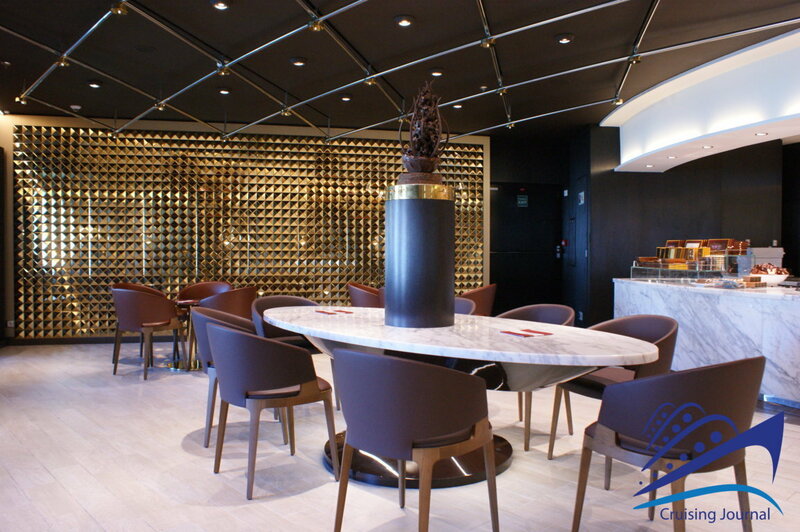 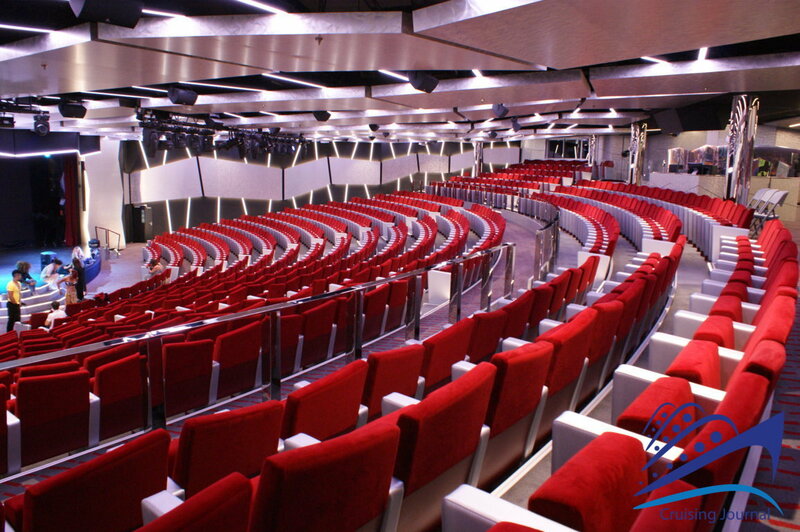 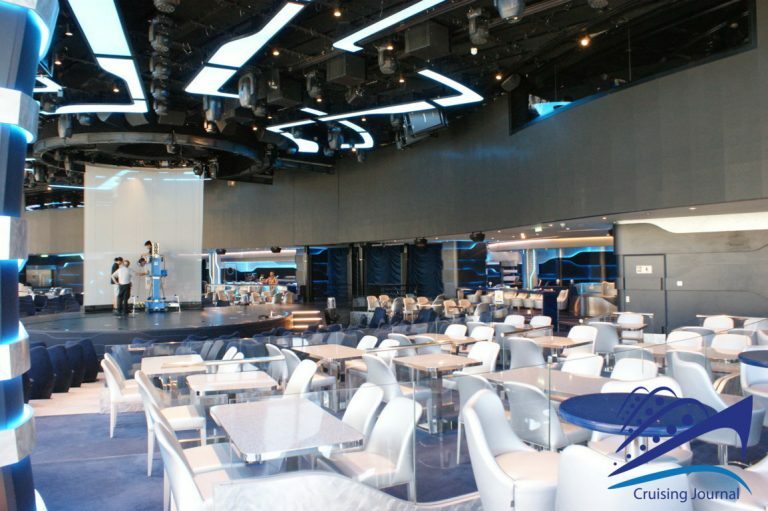 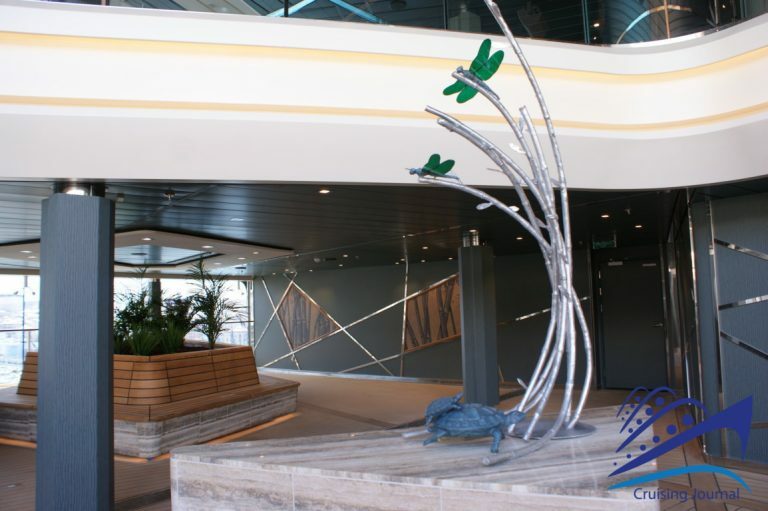 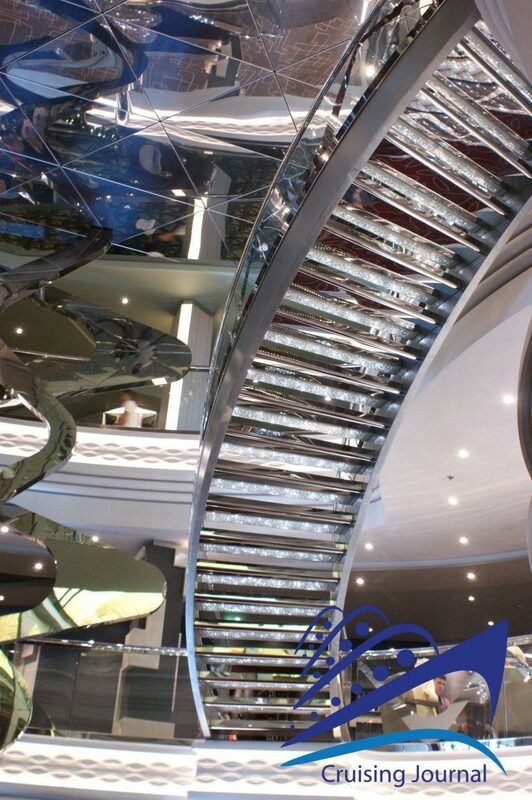 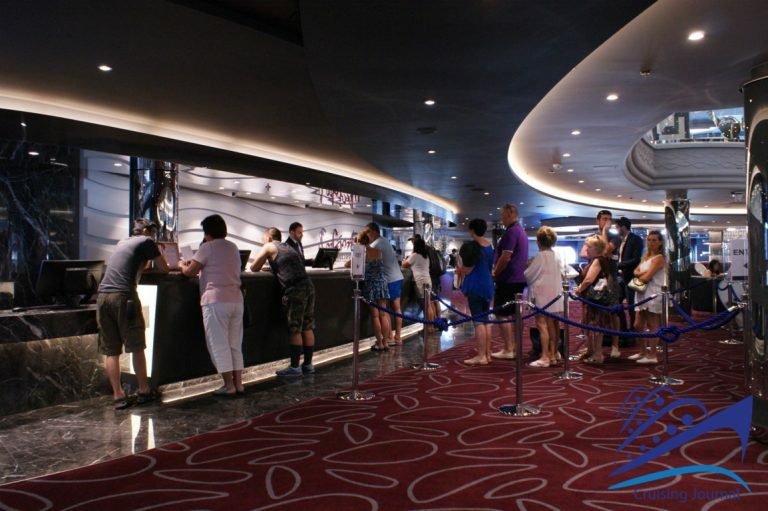 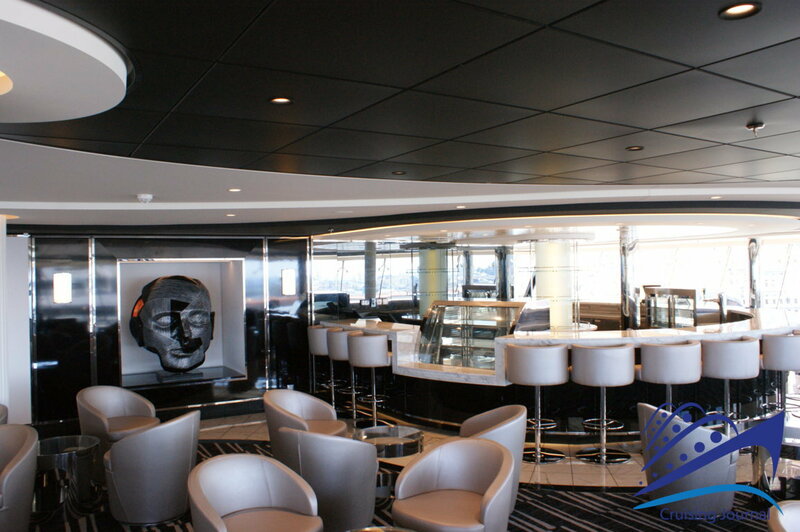 It is a necessary passage to reach the bright Carousel Lounge, a large room overlooking the sea on all sides and a central stage that during the first seasons of Msc Meraviglia hosted the famous Cirque du Soleil. 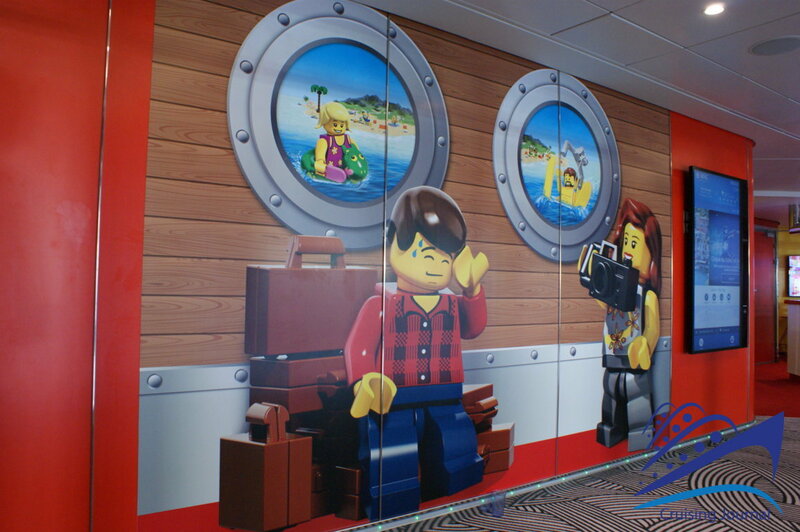 Just as many spots and attractions develop on deck 6. 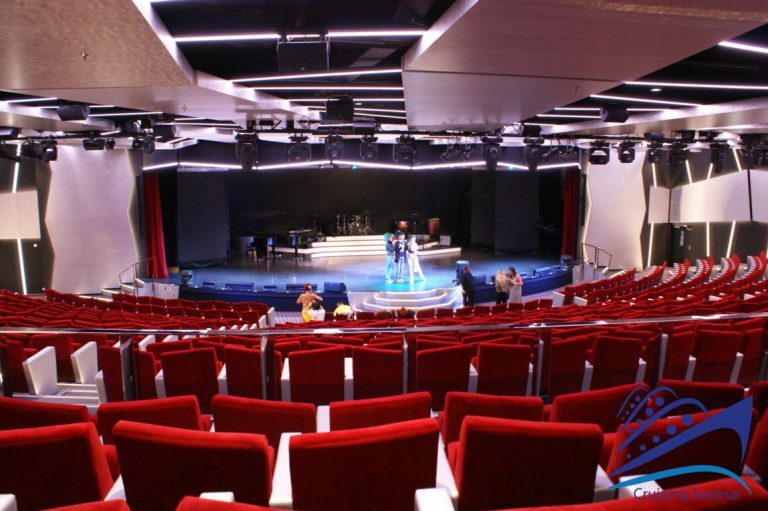 The Broadway Theater occupies a large area of the bow, with 985 seats, before leading the way to the Galleria Meraviglia. 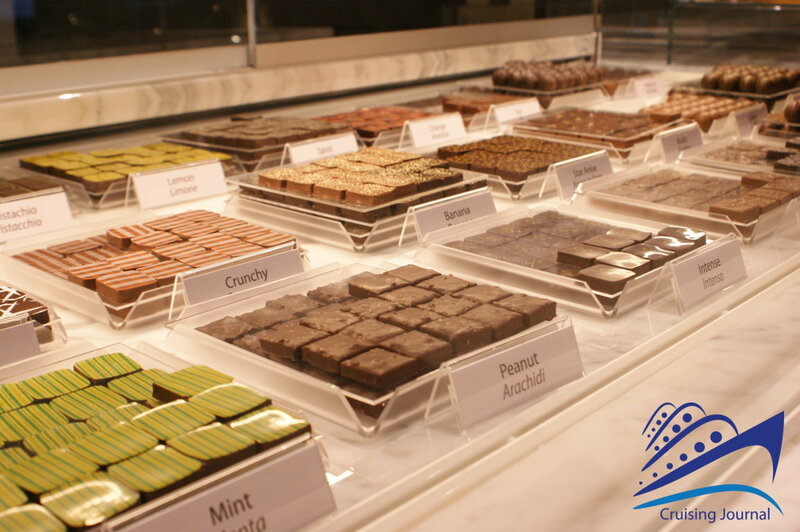 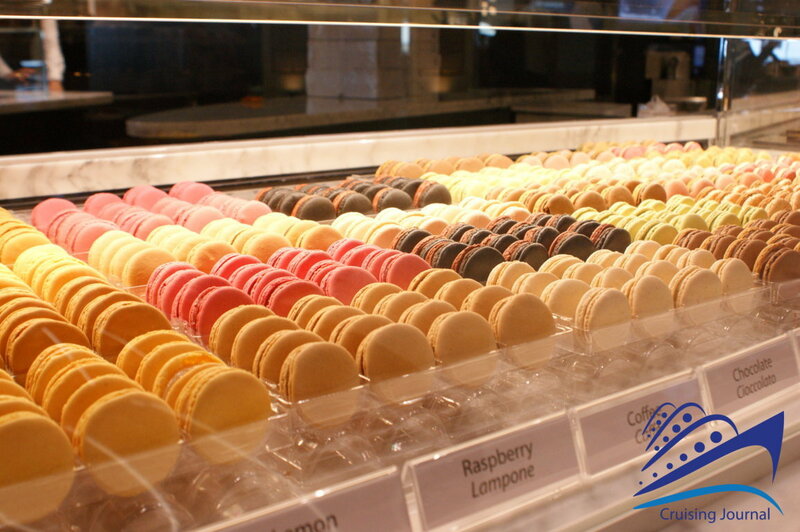 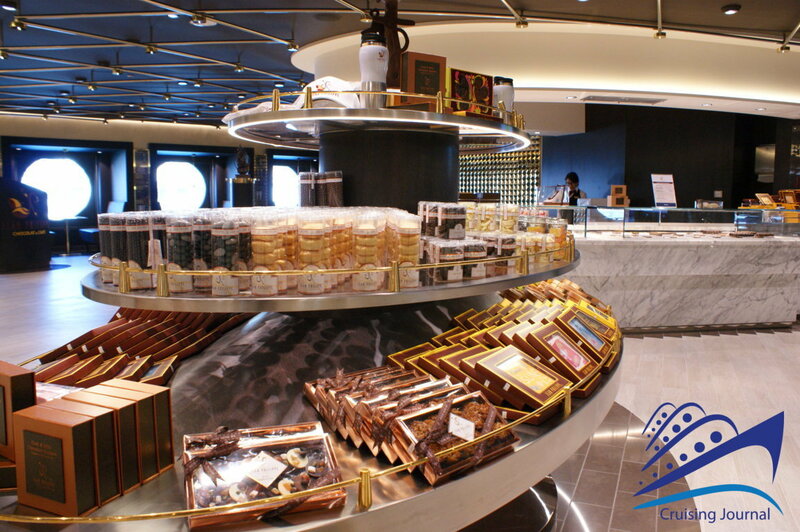 Here you can find a long series of shops and local specialties: the Theatre Bar and Lounge, the Boutiques, Fine Watches and Jewellery, the sweet-tooth Jean Philippe Chocolate and Coffee, a real atelier resulting from the partnership with the award-winning confectioner, where you can find hundreds of sweet temptations, for all tastes and palates, prepared in an innovative chocolate kitchen, and the Eataly Food Market in the first part of the Promenade. 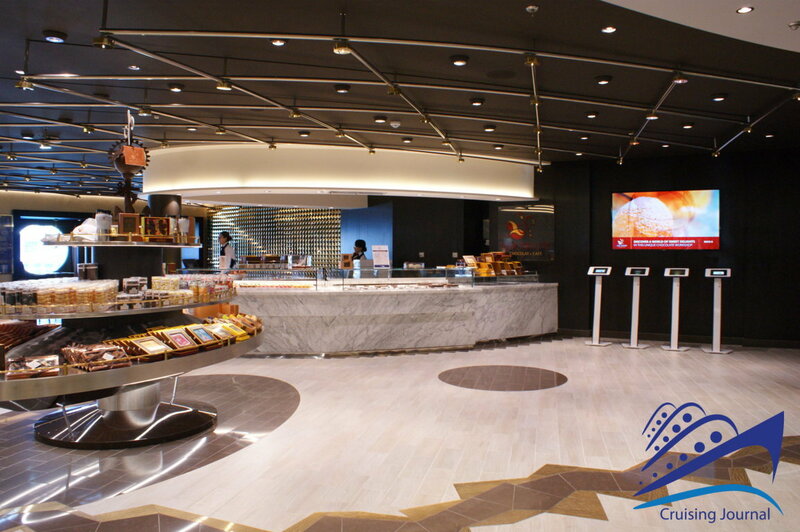 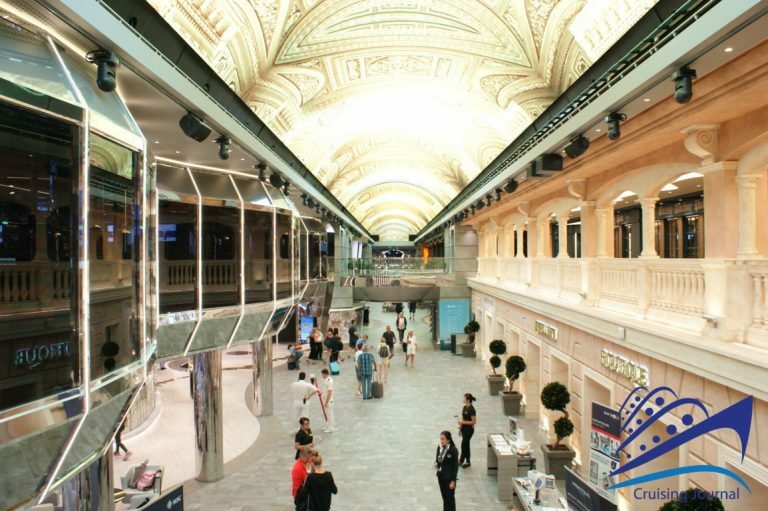 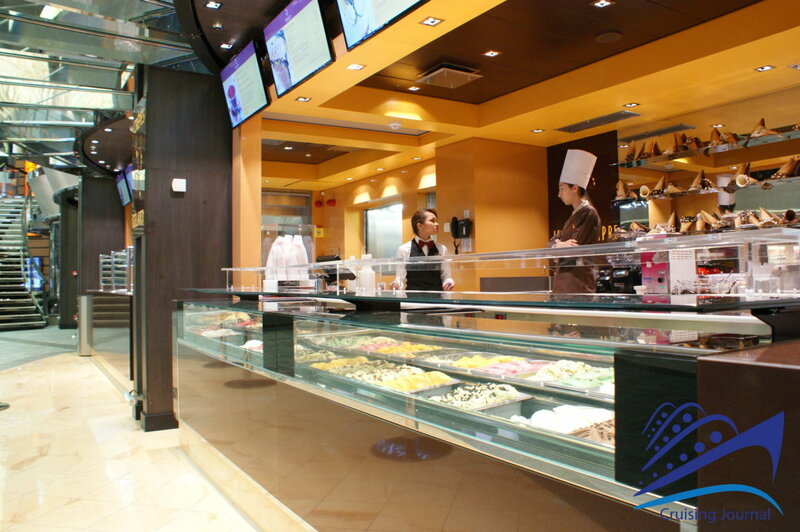 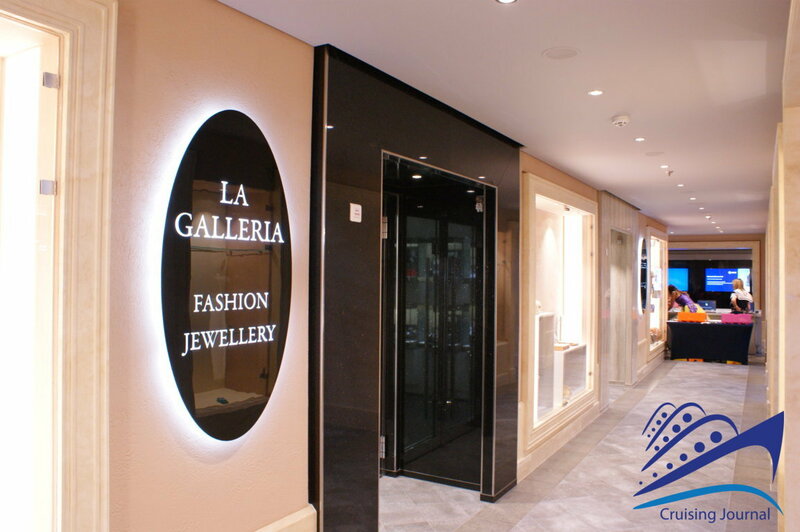 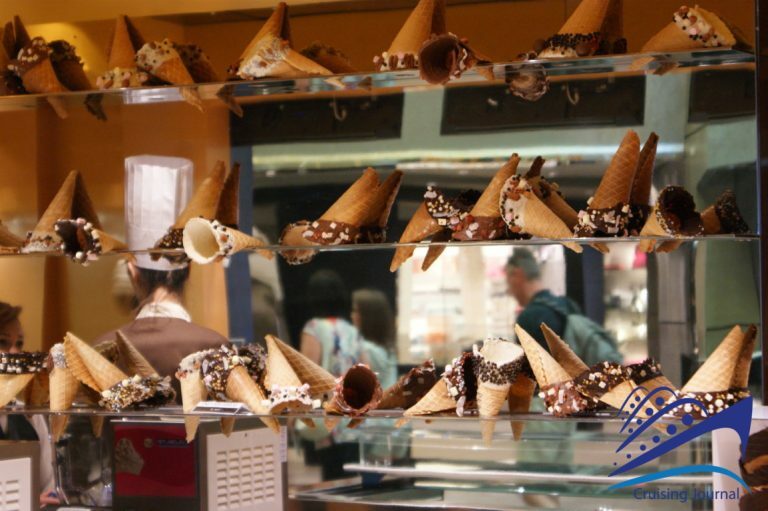 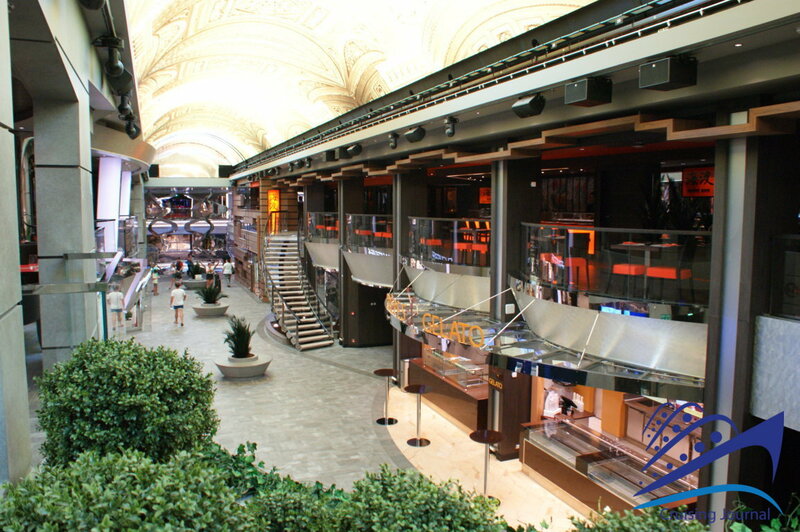 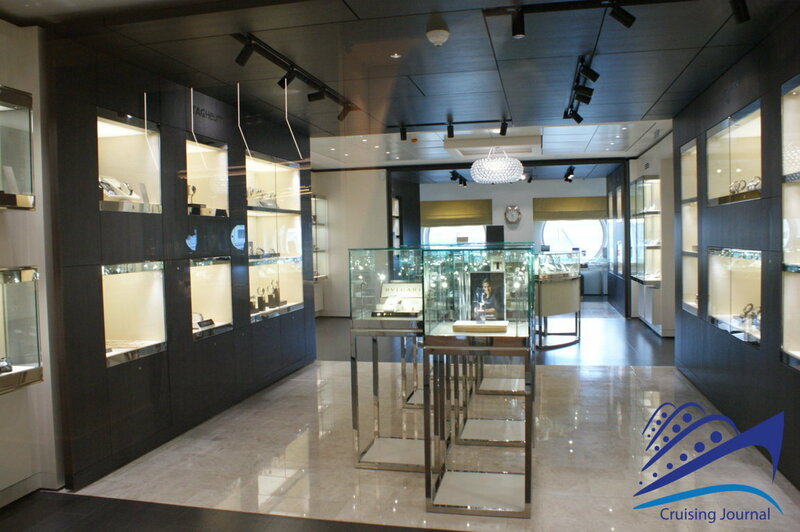 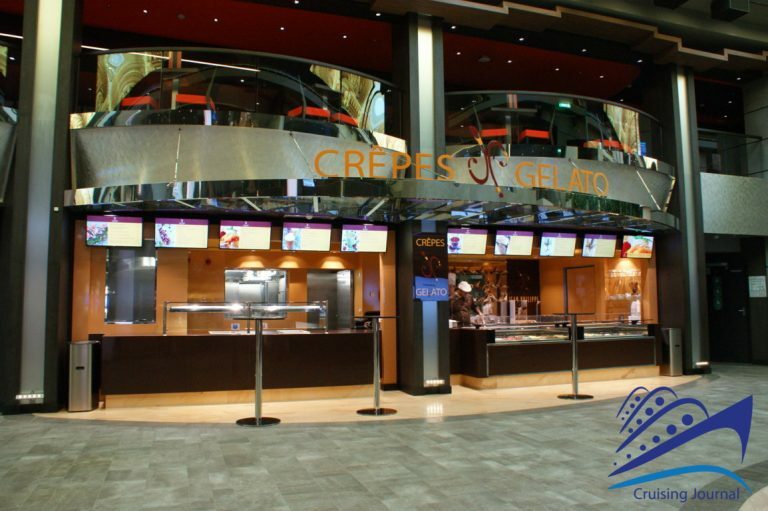 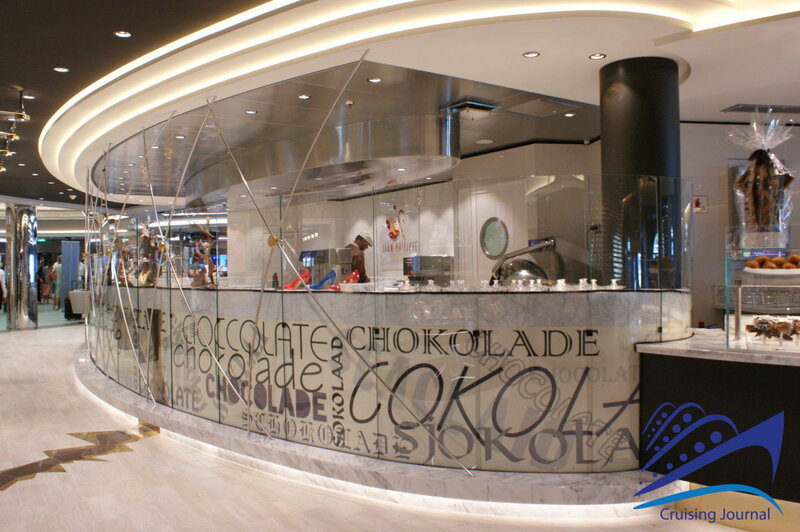 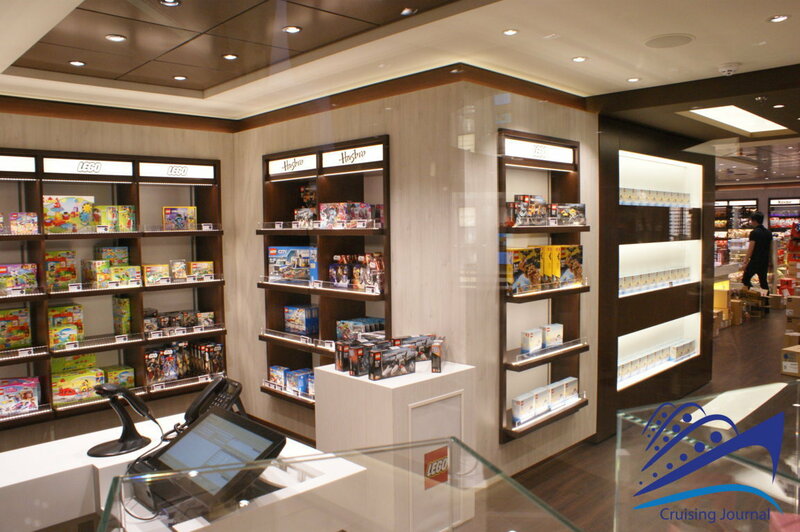 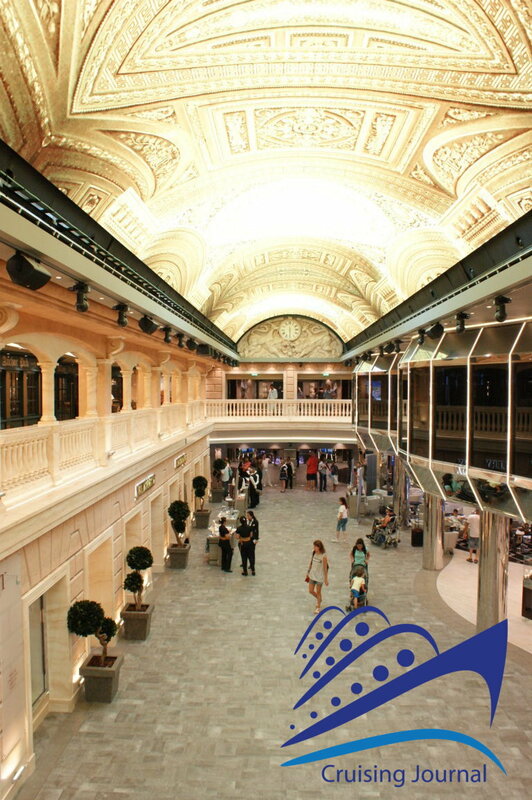 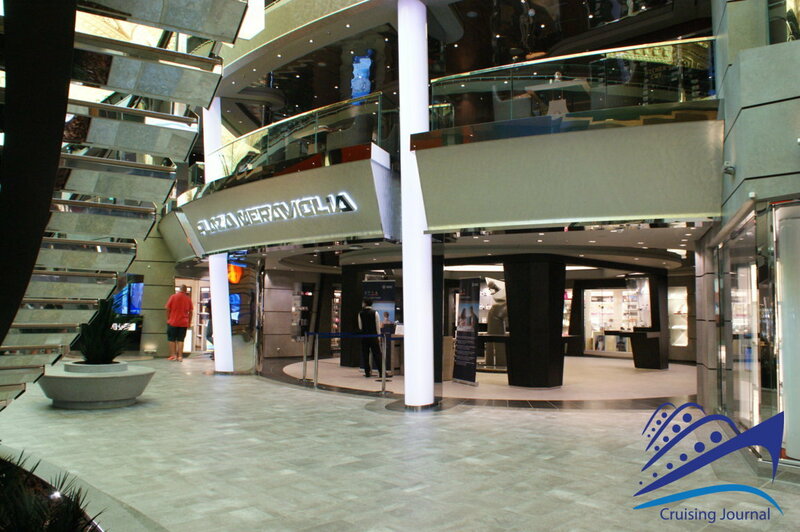 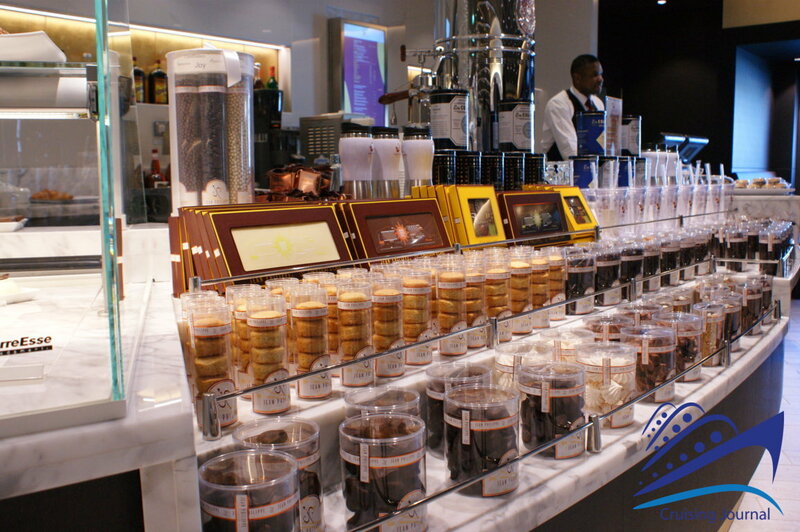 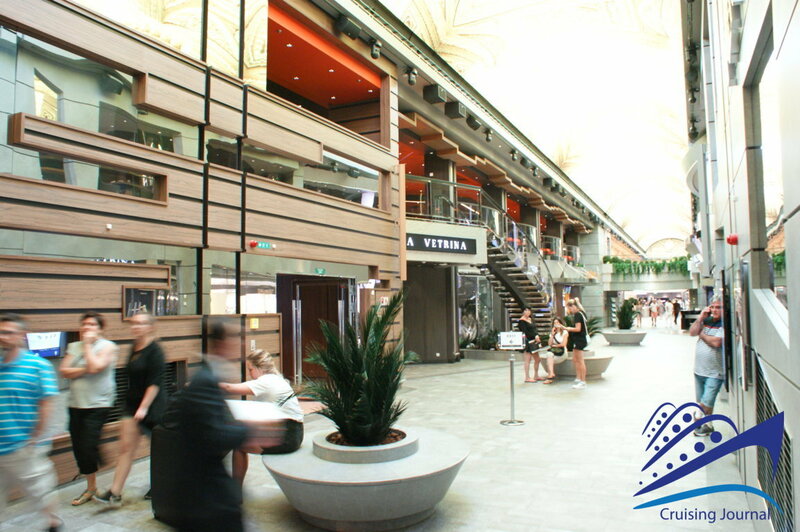 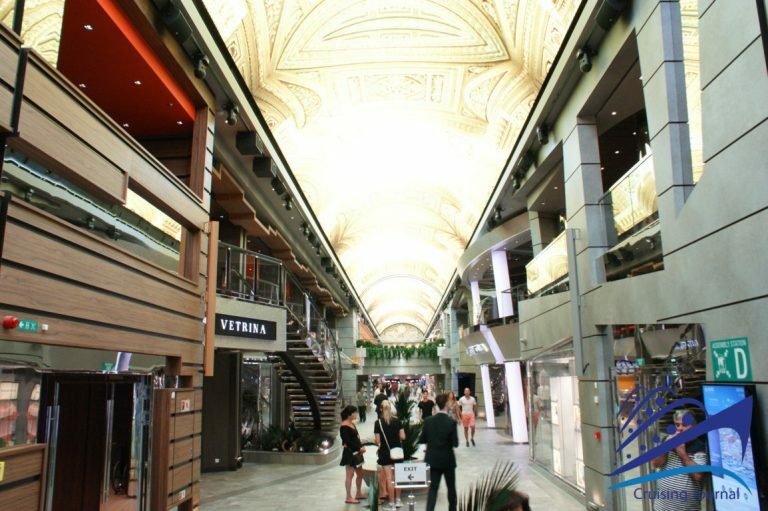 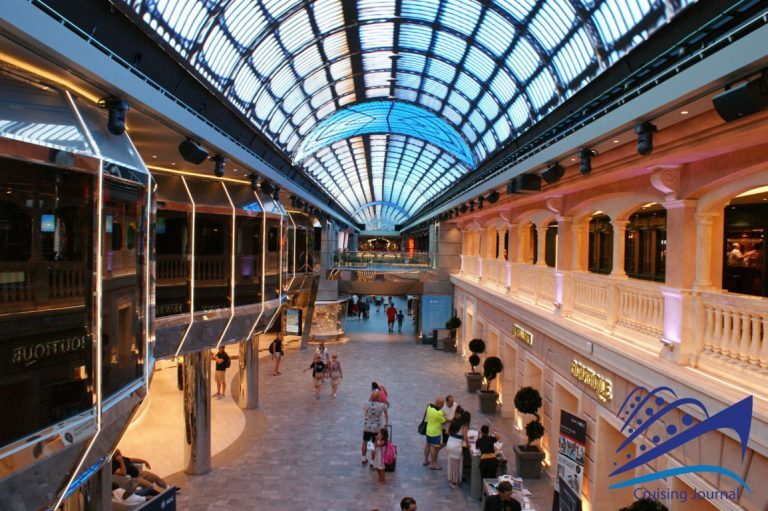 After the Excursion Office there is another large shopping area: Jean Philippe Ice Cream and Crepes, Ristorante Italiano, La Vetrina on the left side of the ship, the Plaza Meraviglia on the right side with the Mini Mall, Perfums & Cosmetics, Watches & Sunglasses. 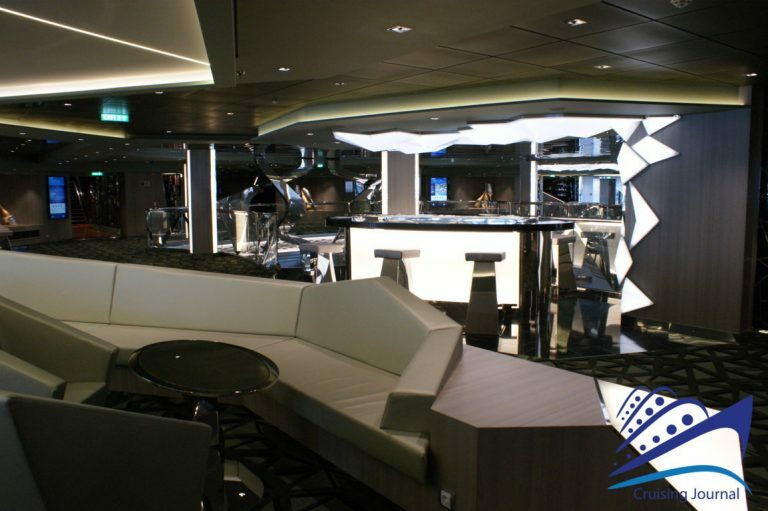 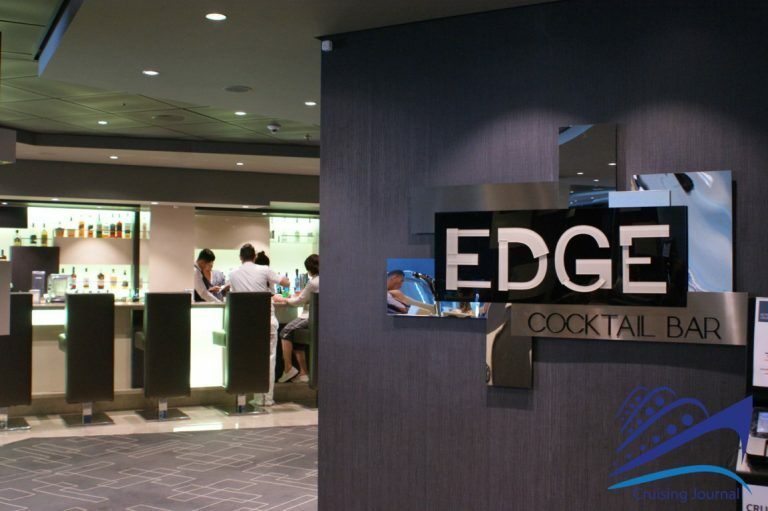 Further ahead, around the Edge Cocktail Bar, you can find the MSC Shop, the Fashion Jewellery, the Photo Shop and the Photo Gallery. 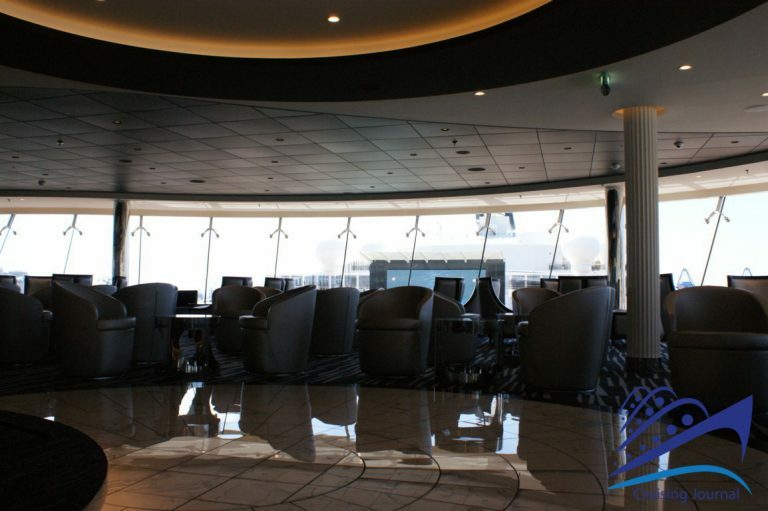 From here you can take the panoramic elevators that go up to the external bridges. 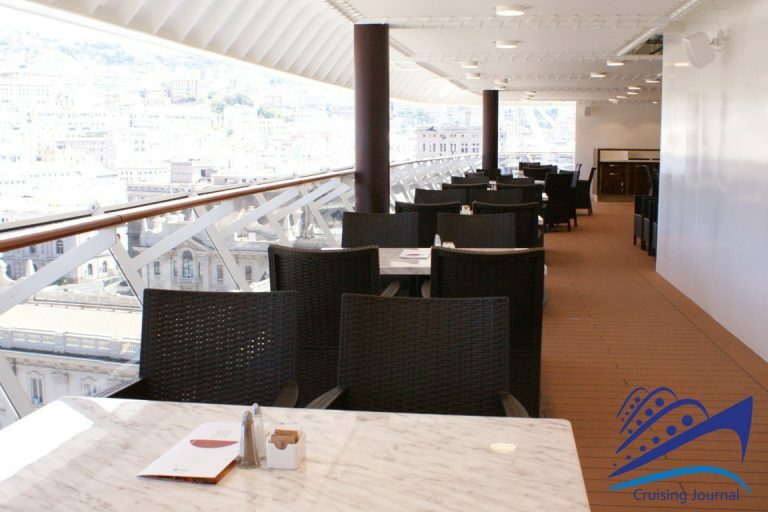 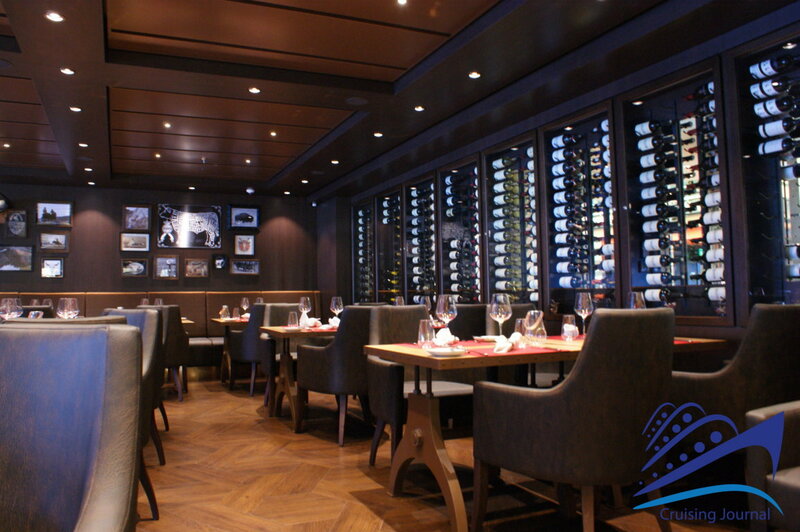 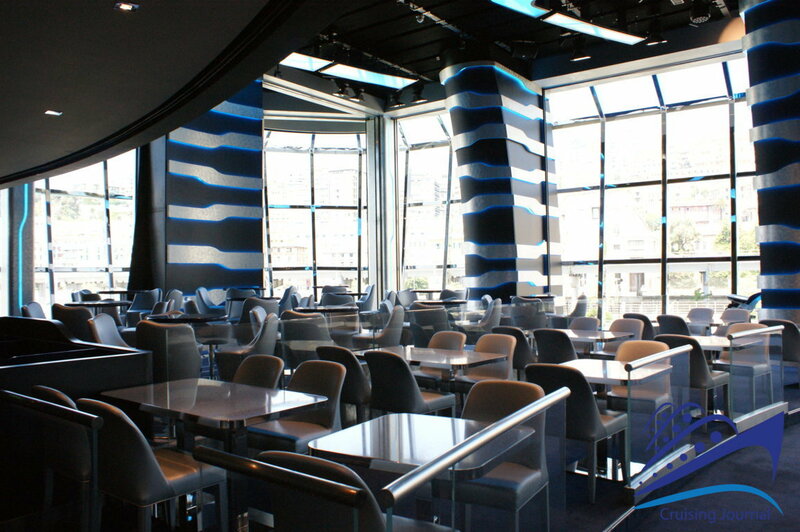 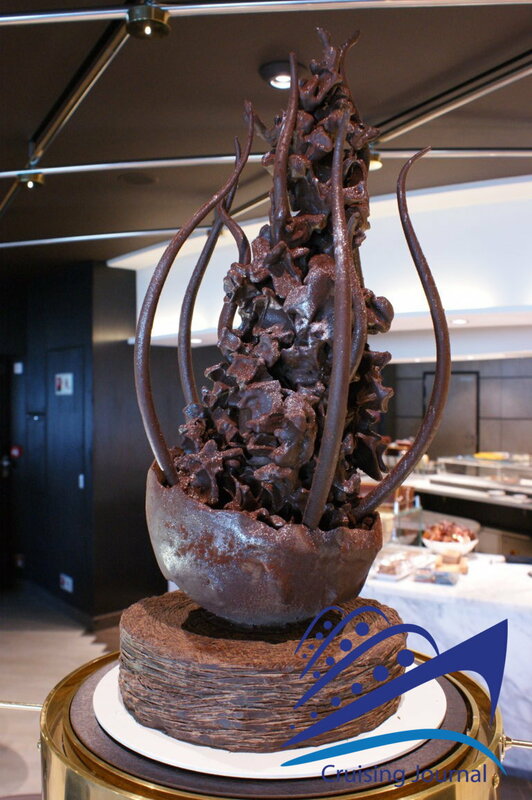 The stern area hosts the restaurant L’Olive Doreè and the Panorama Restaurant, both dedicated to Flexi Dining, a new proposal that allows you to abandon the pre-established shifts and to pre-select a time range for dinner, with the possibility to change your reservation at any time. 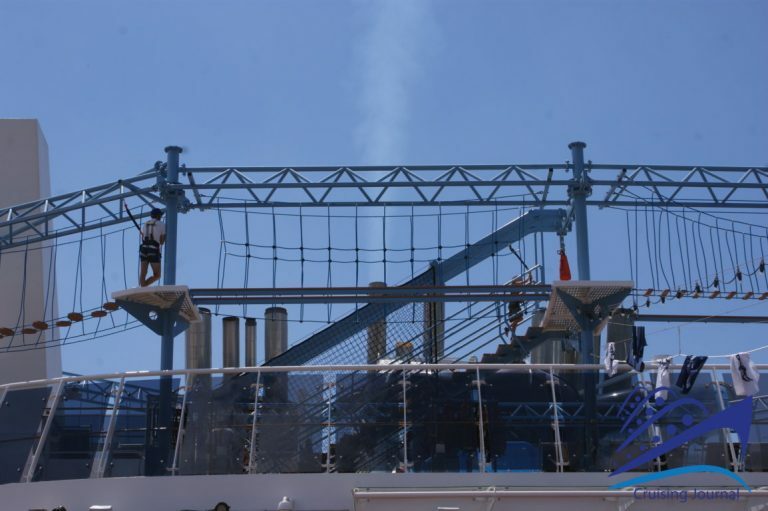 Decks 5-4: at the bow, the Broadway Theathre stands continue while some cabins are found up to the center of the ship. 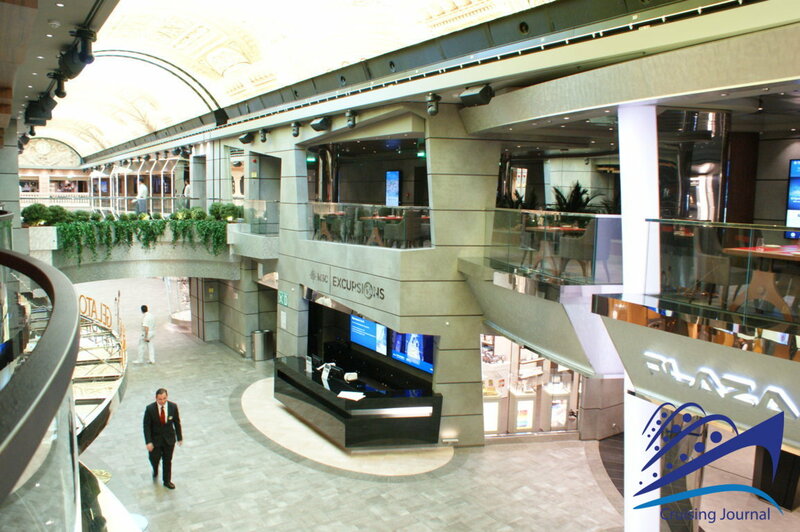 The Infinity Atrium houses the Infinity Bar, another Excursion Office, the Reception and a Business Center. 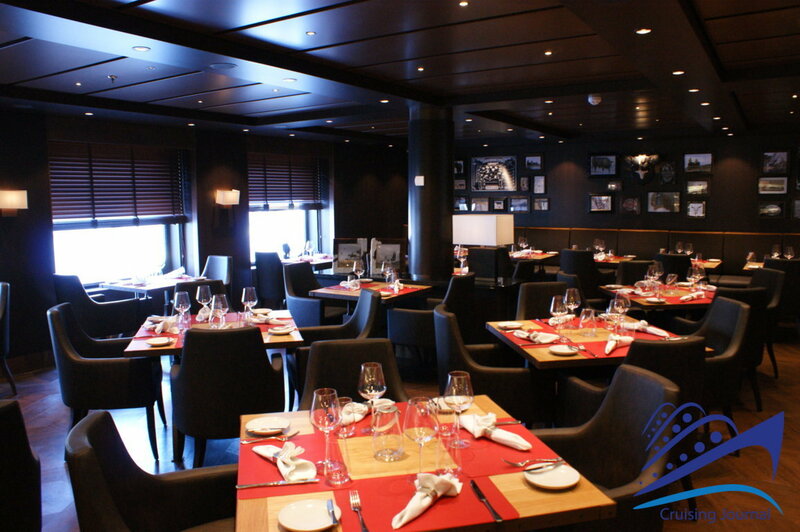 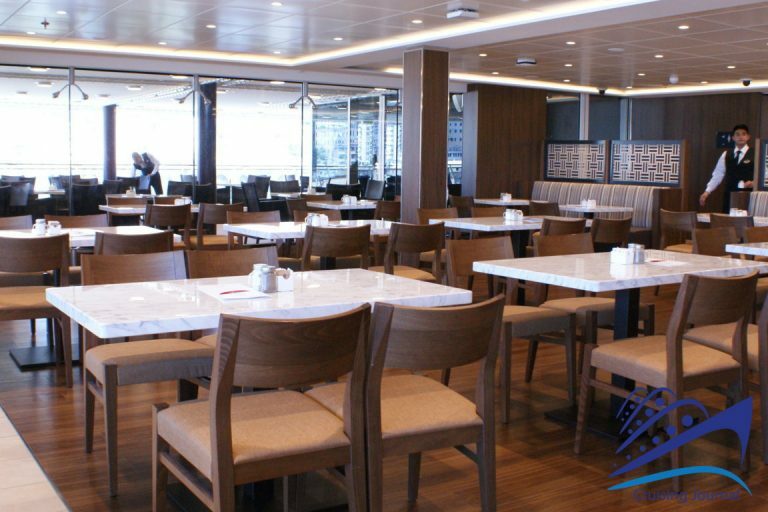 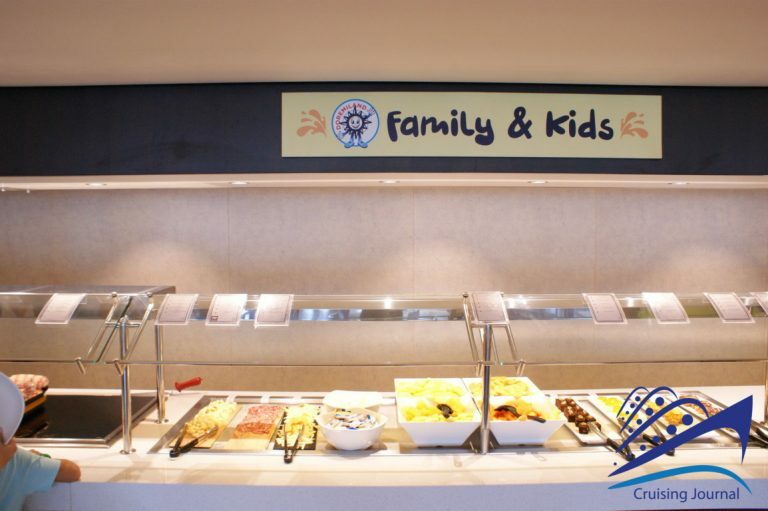 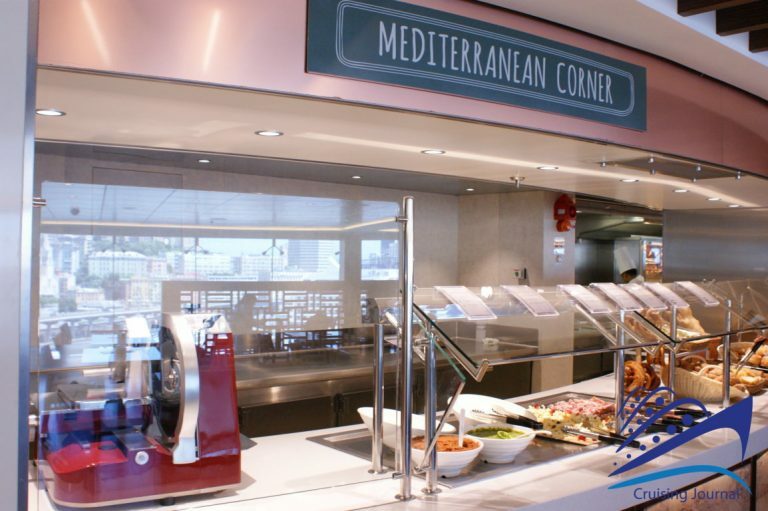 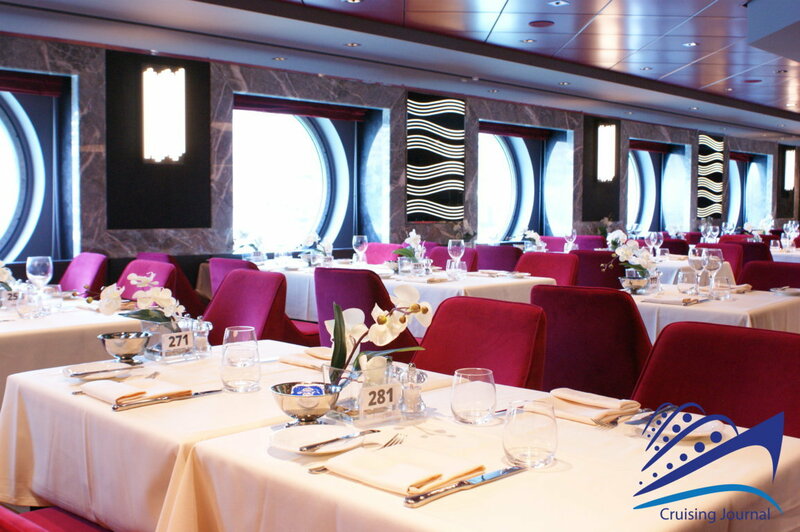 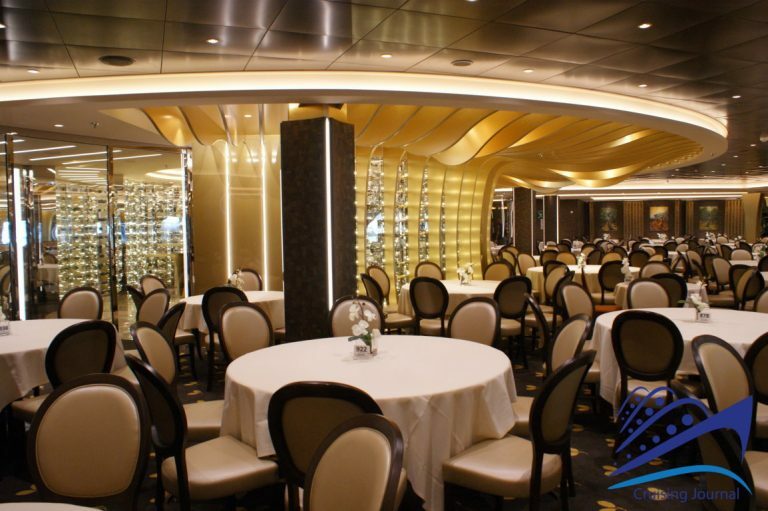 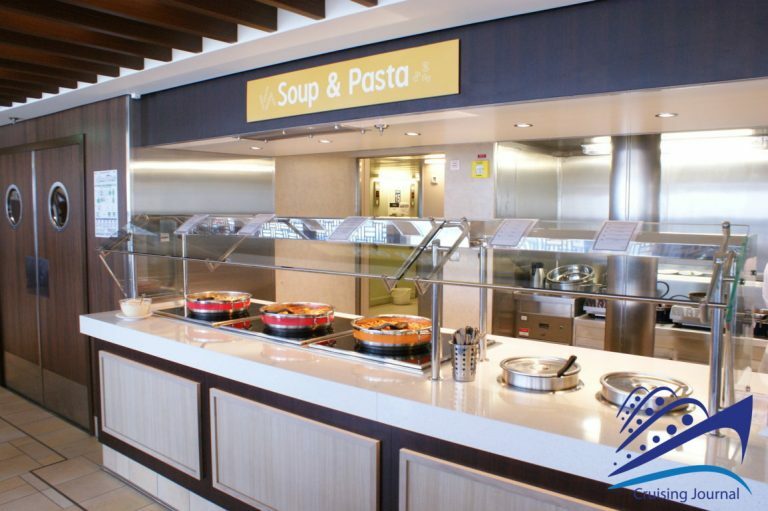 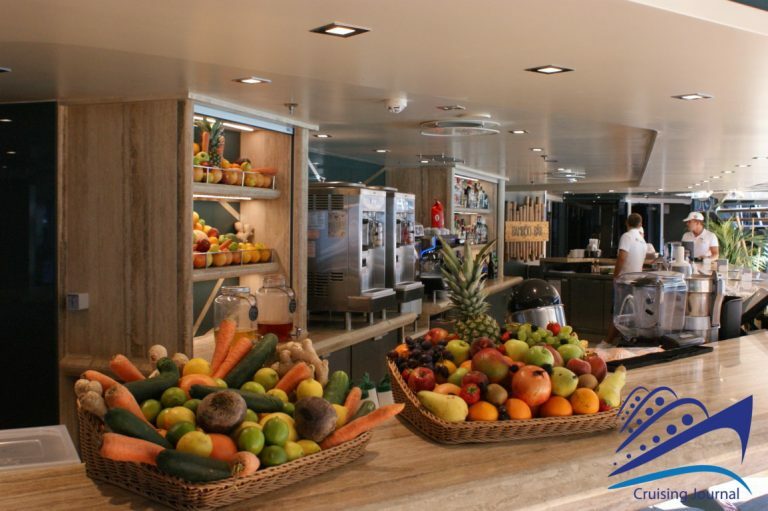 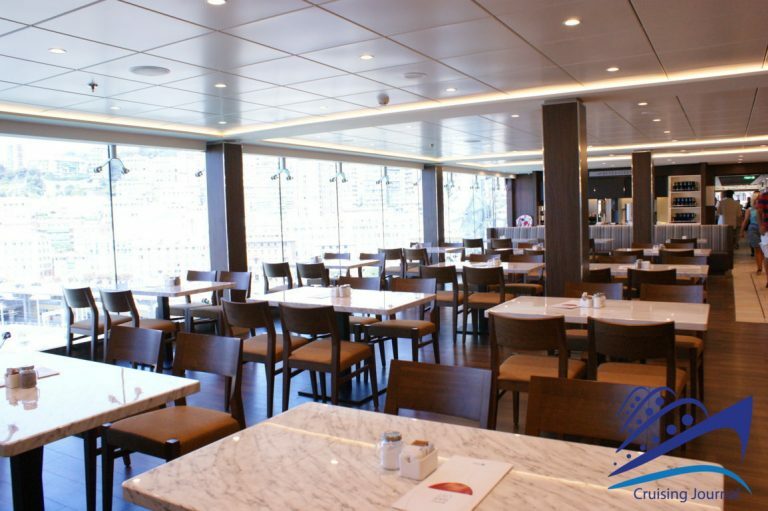 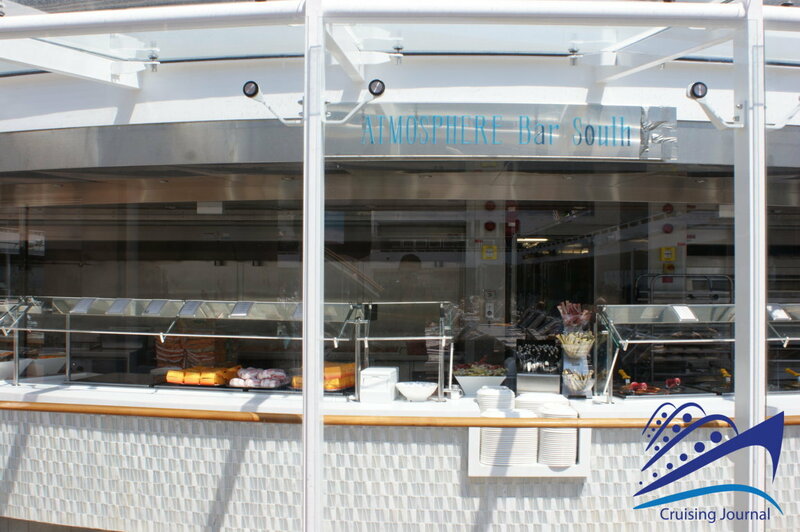 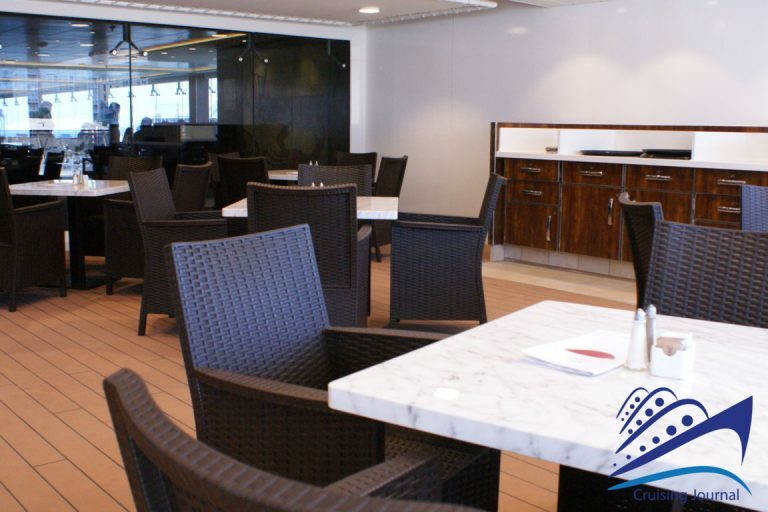 At the stern we have the Waves Restaurant, set on the classic method, which allows guests to keep the habits of always dining at the same time, at the same table and with the same neighbors, for the duration of the cruise. 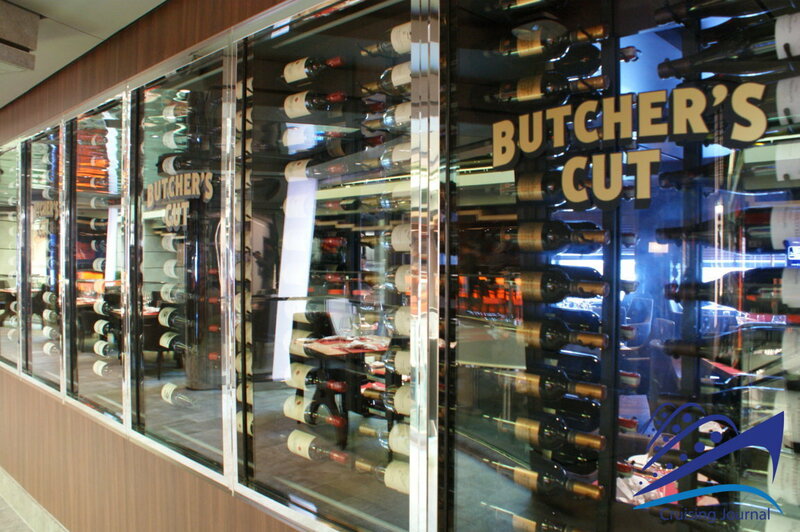 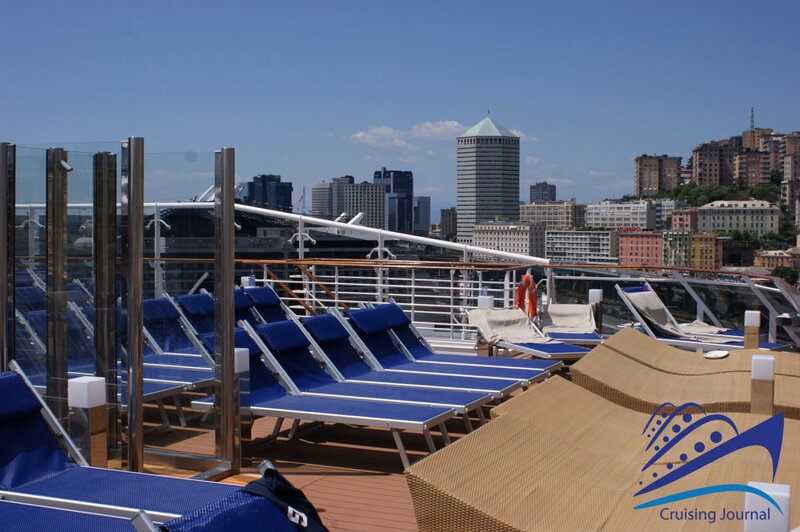 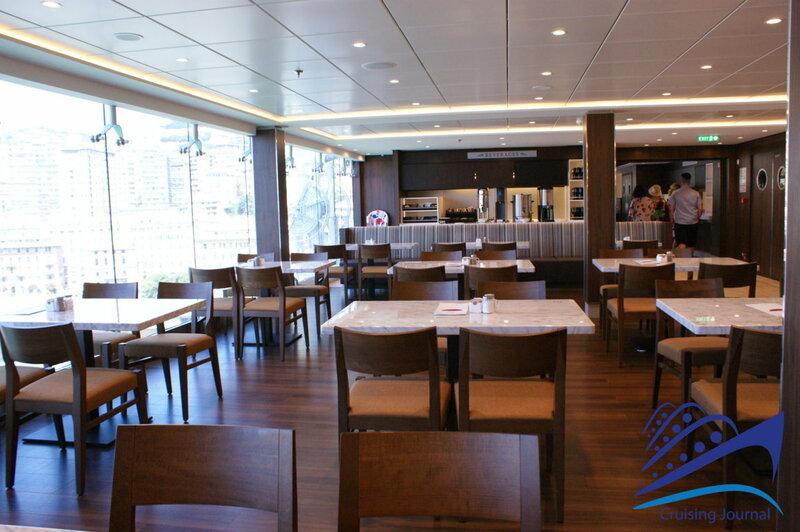 At deck 4 you have the Medical Center at the bow and a series of Gangways. 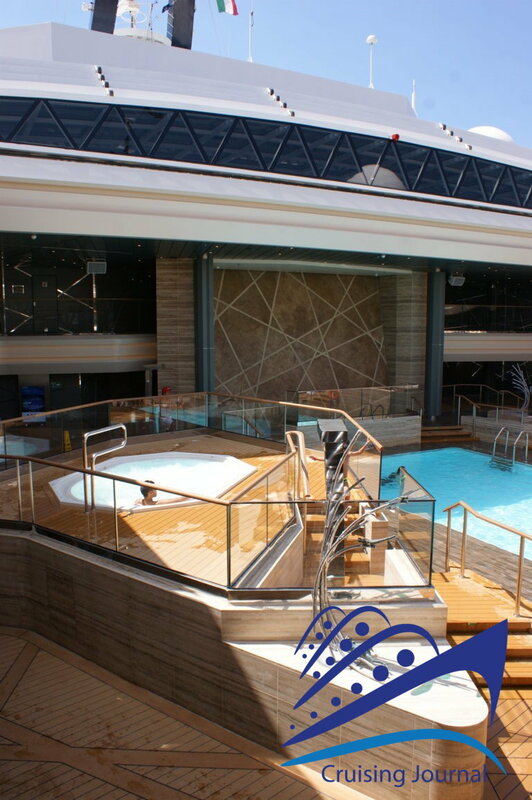 Msc Meraviglia is a modern floating resort offering a very wide range of services and opportunities. 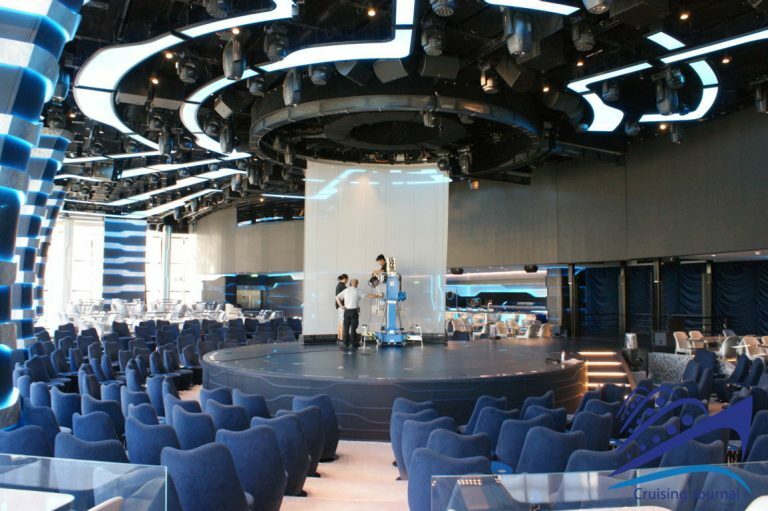 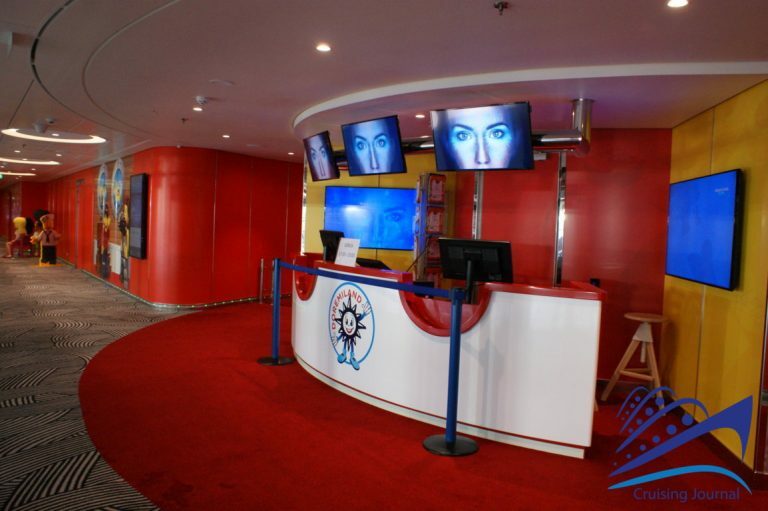 It adapts to a young, innovative and very engaging cruise style, while offering suitable spots for a more mature audience. 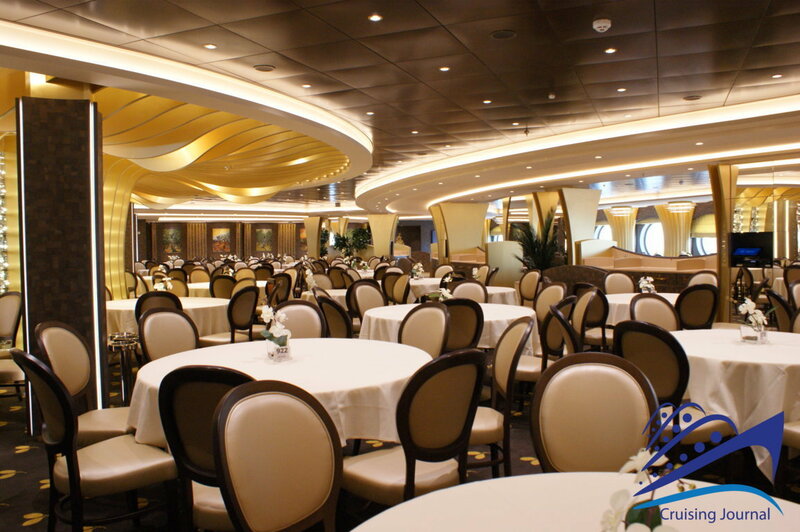 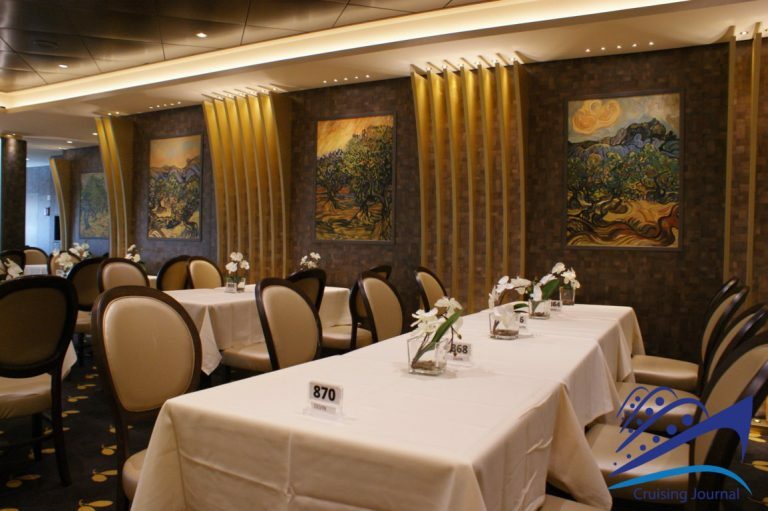 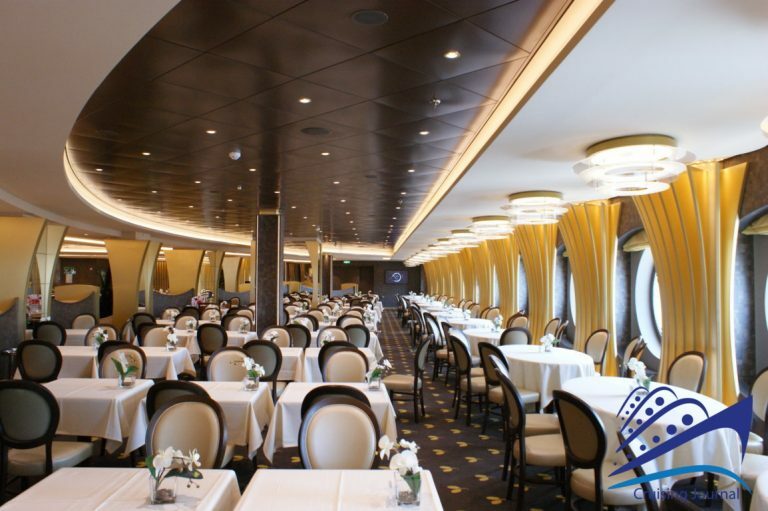 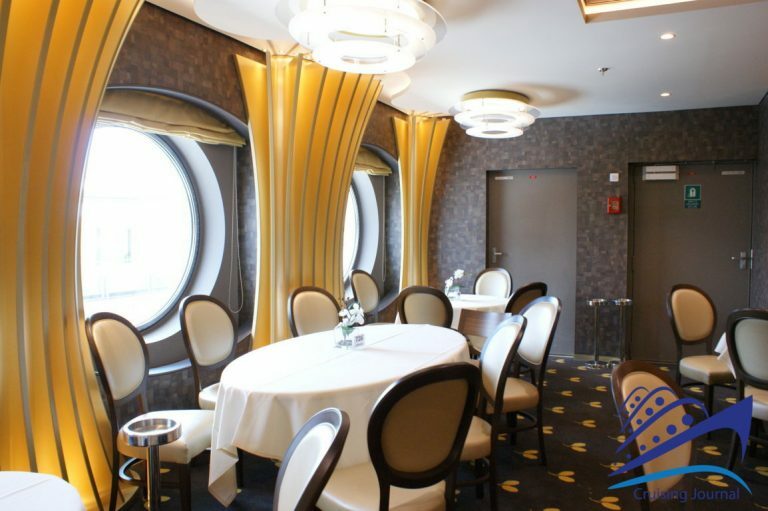 A ship also fascinating and spectacular, in its Promenade, as in the many restaurants dedicated to catering, which, in today’s cruise scene, is very competitive and certainly worth trying.